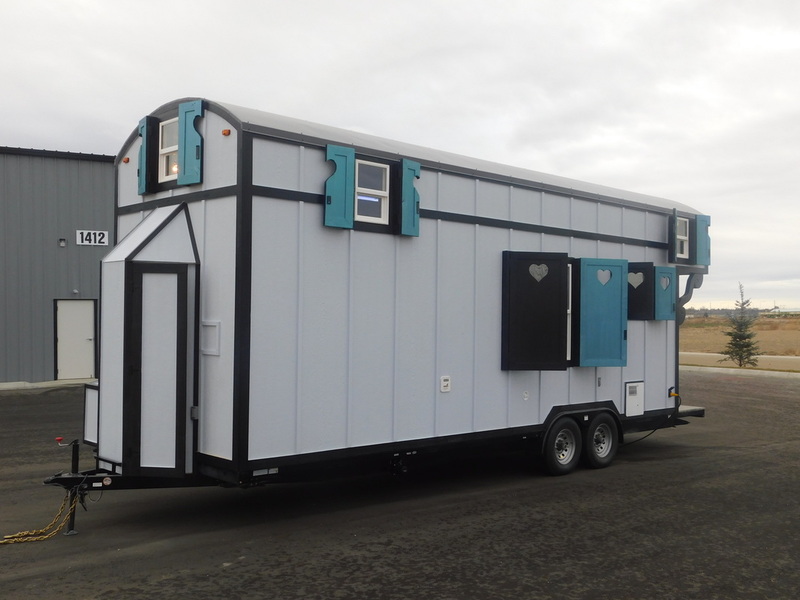 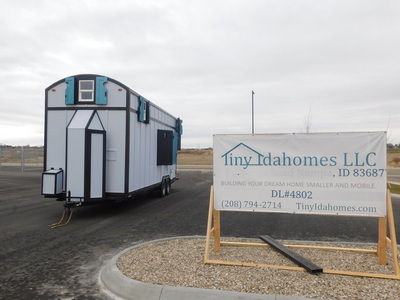 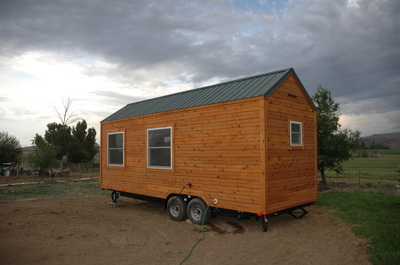 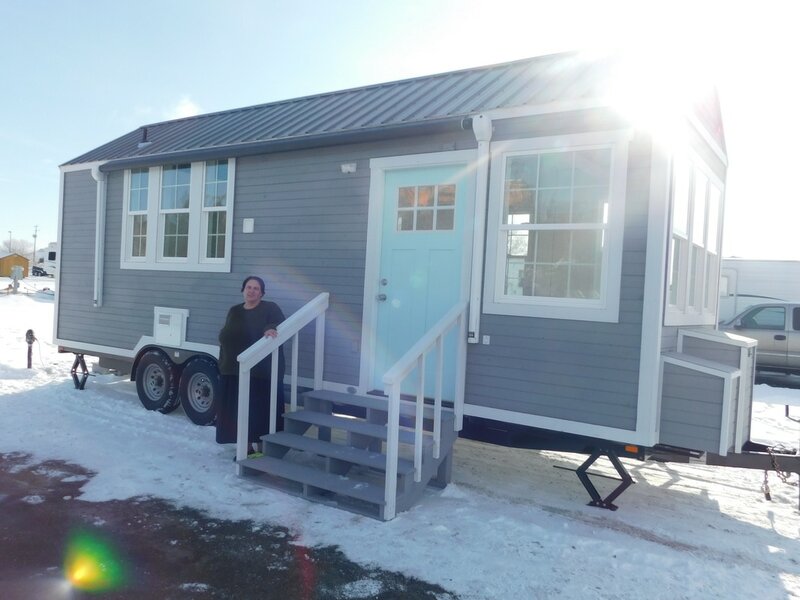 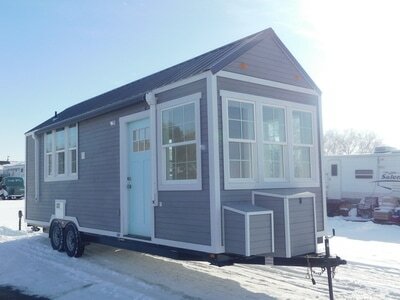 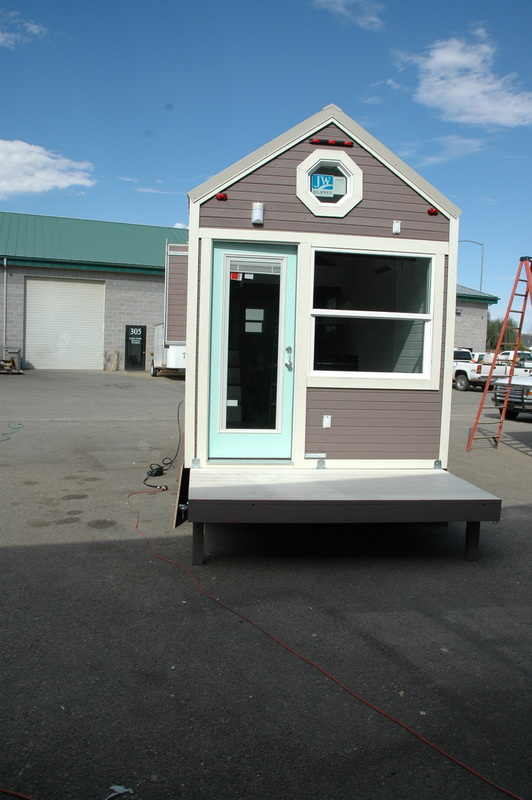 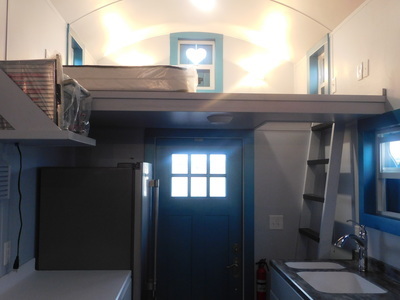 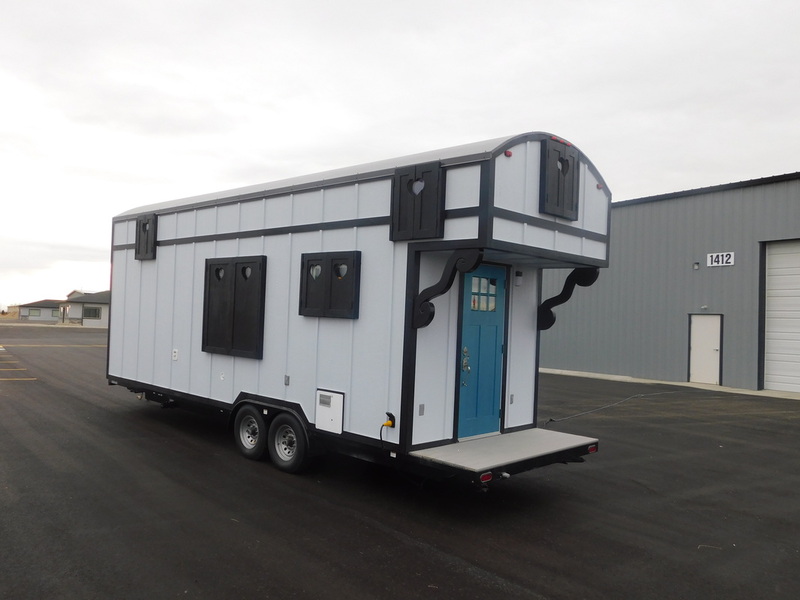 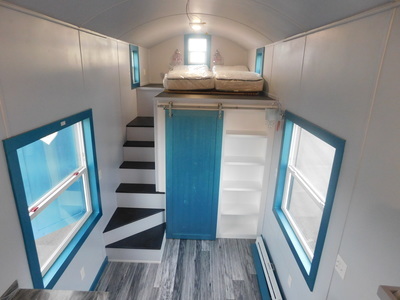 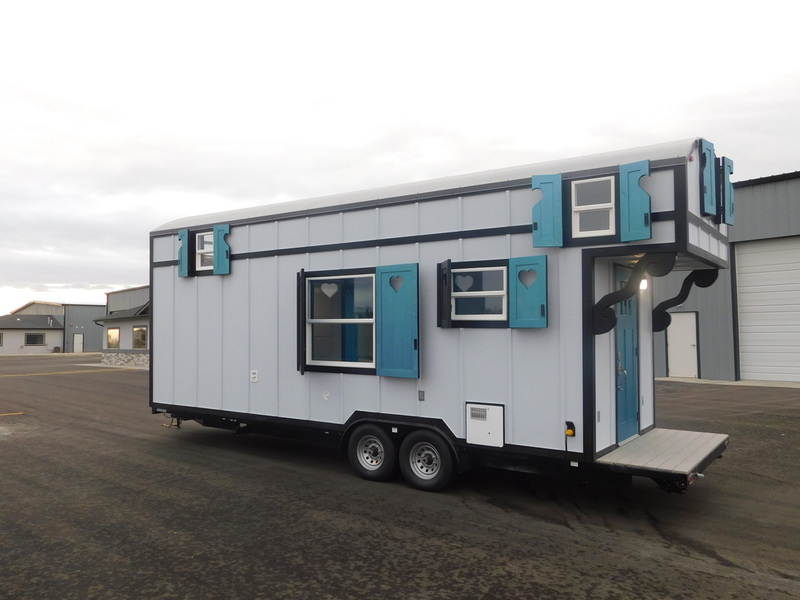 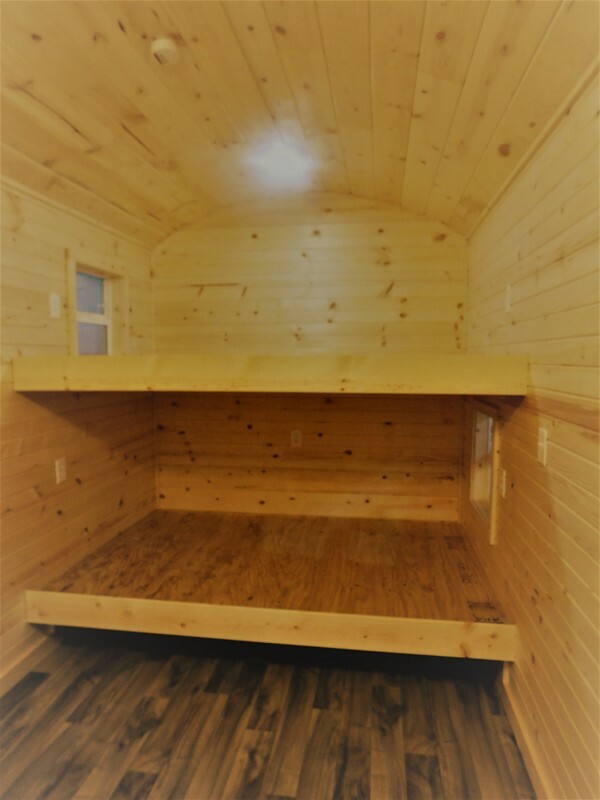 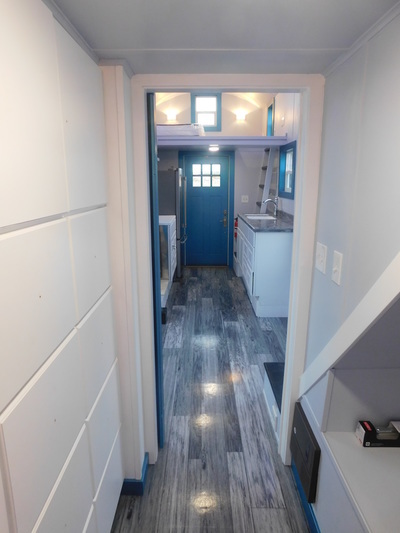 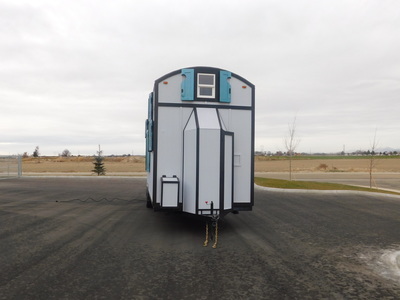 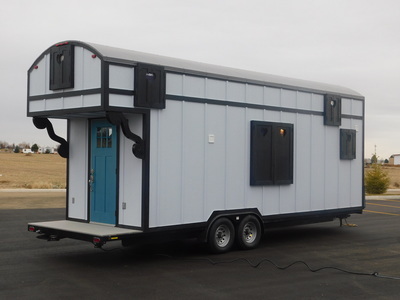 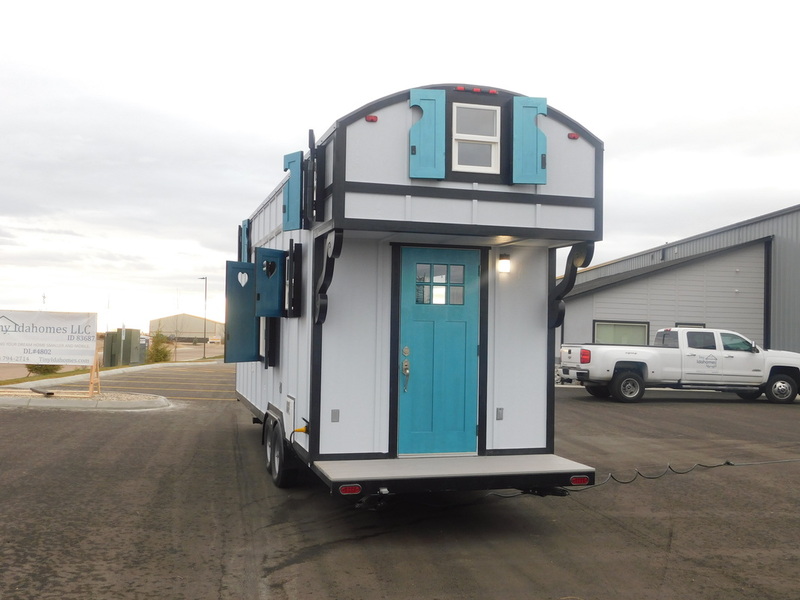 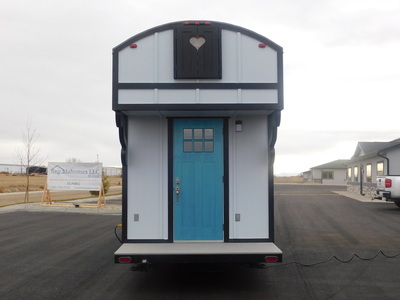 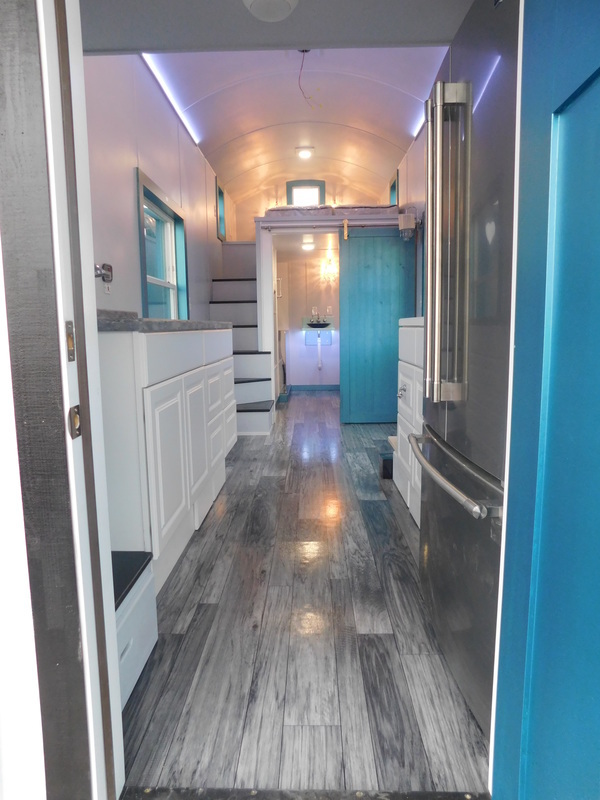 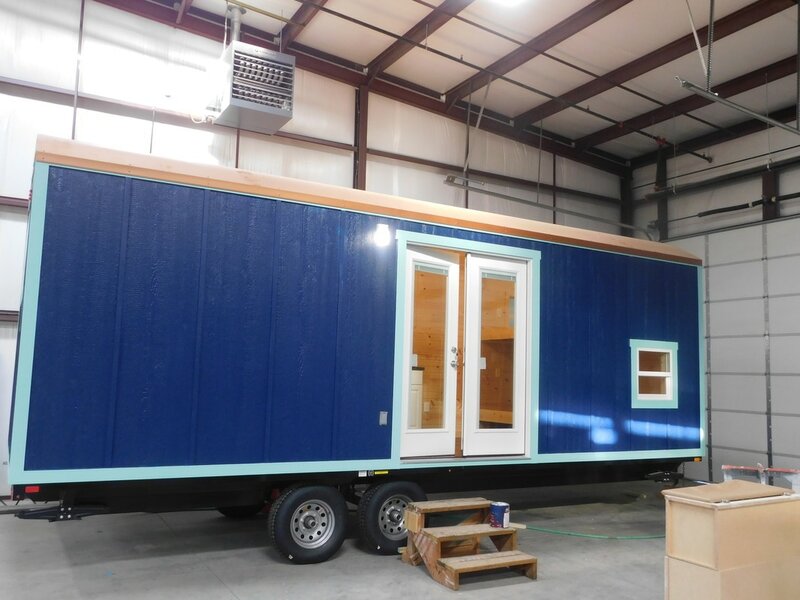 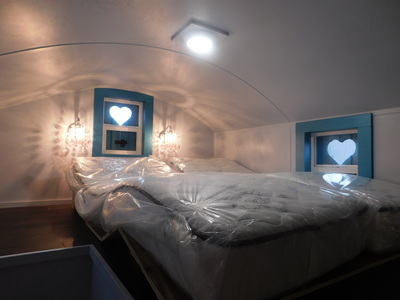 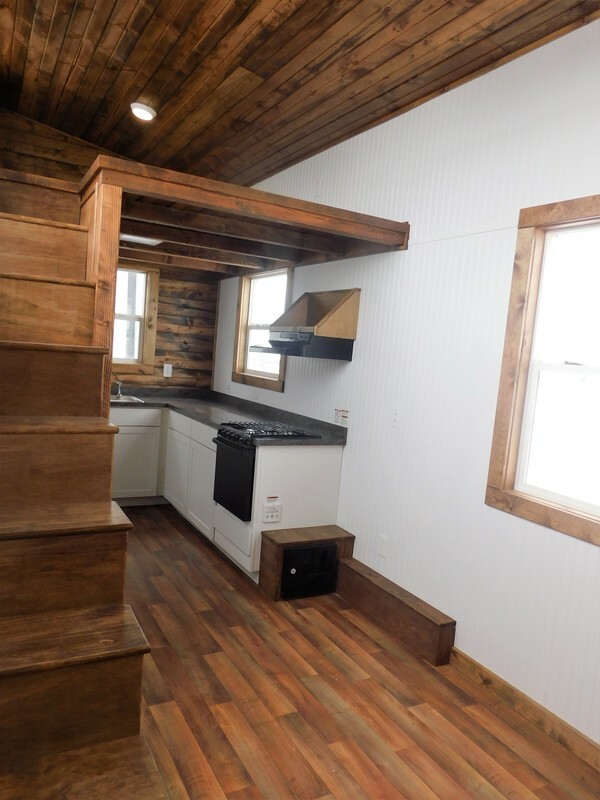 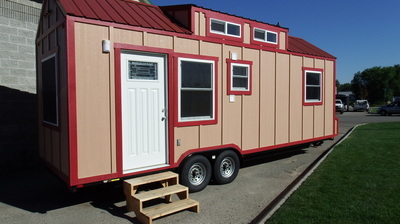 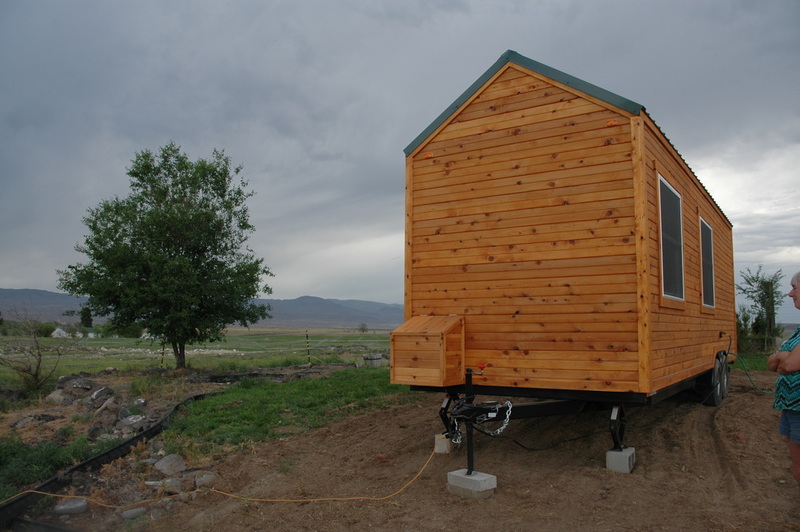 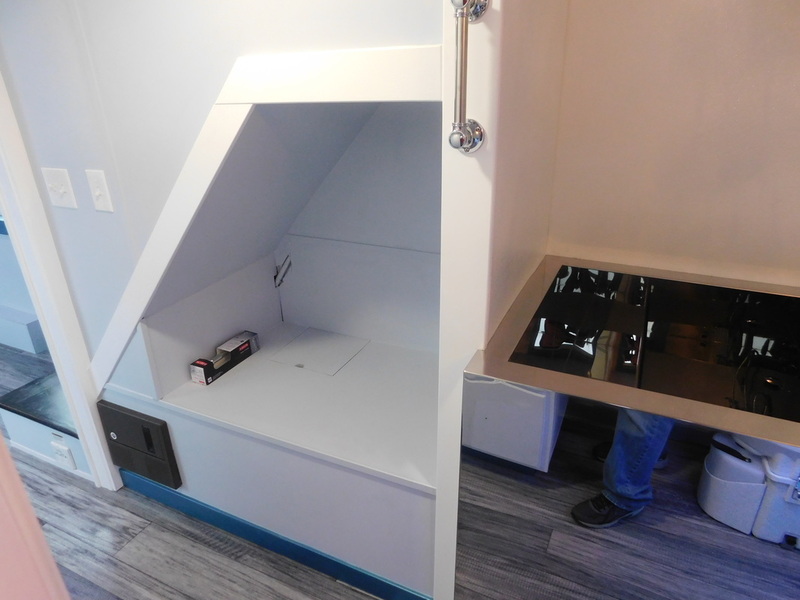 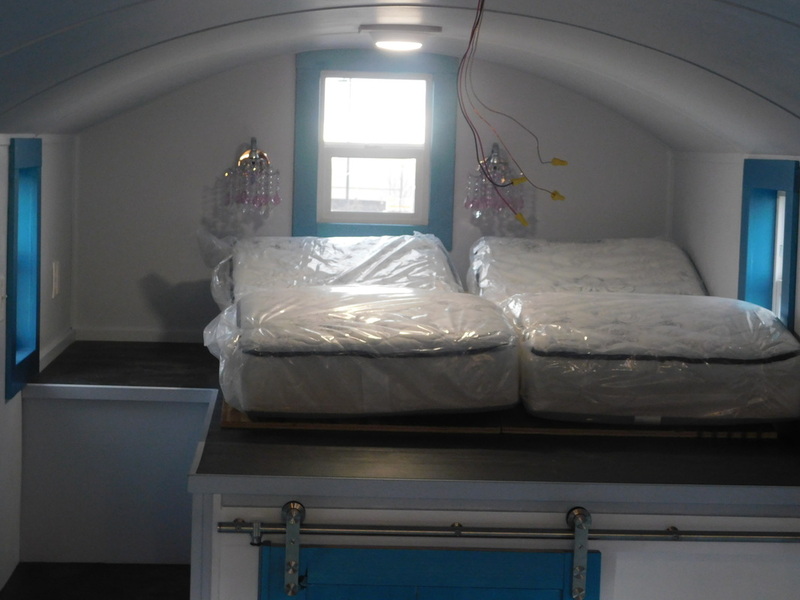 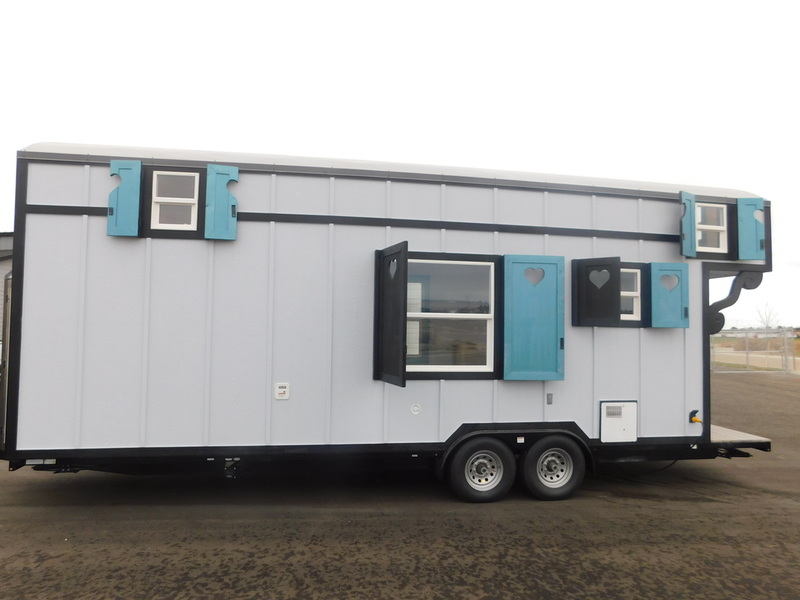 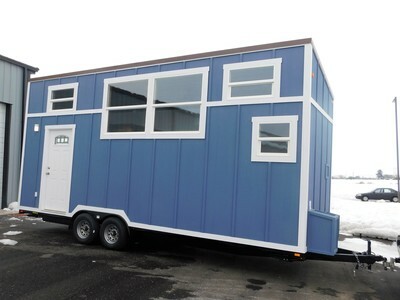 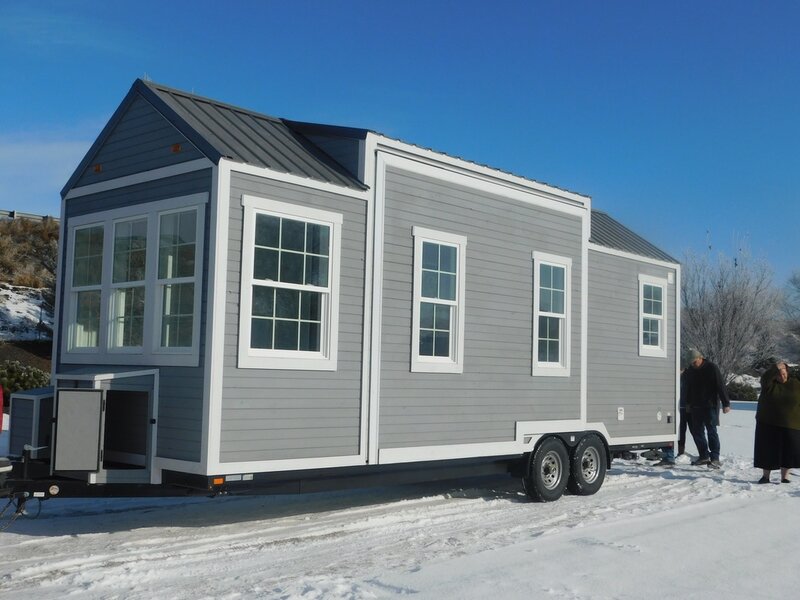 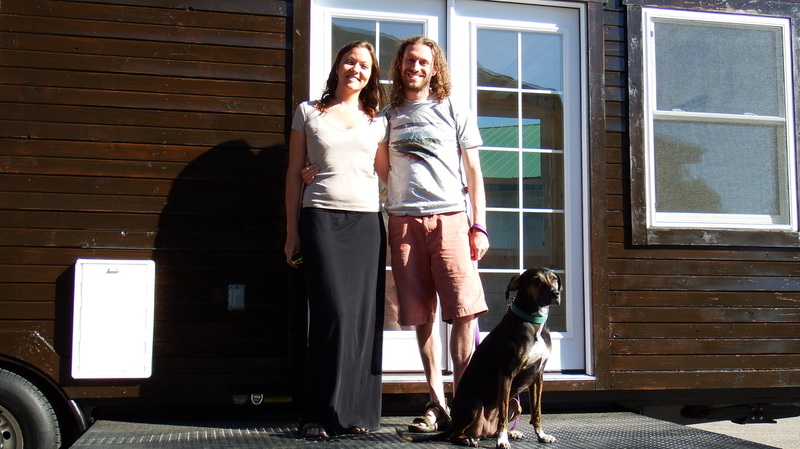 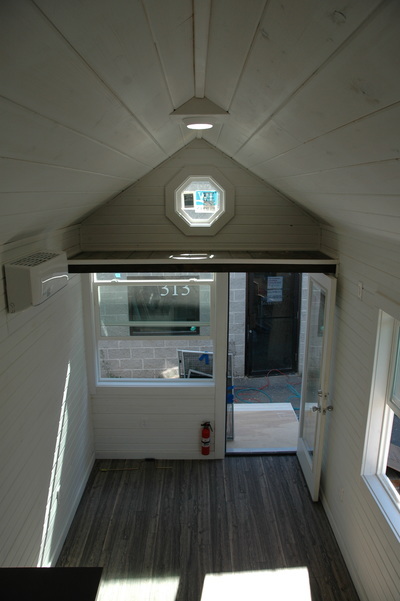 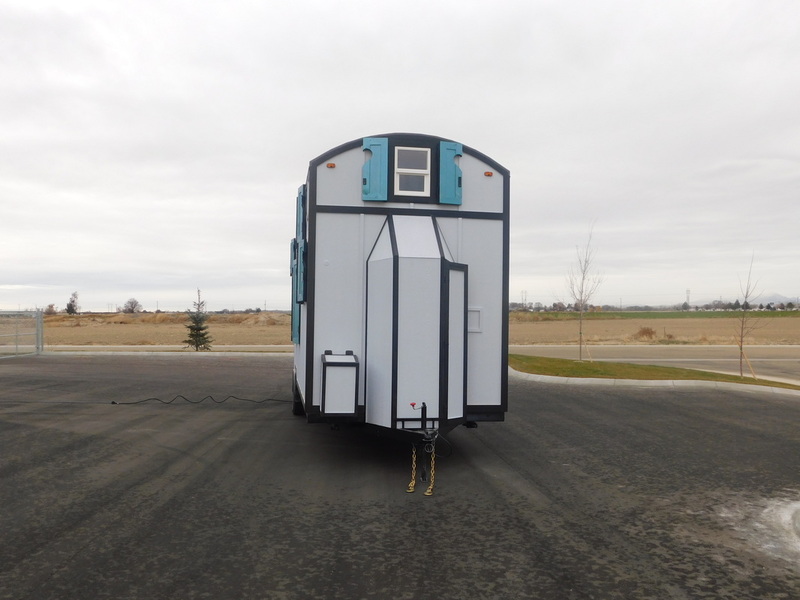 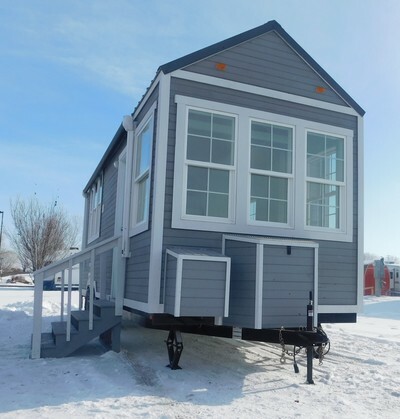 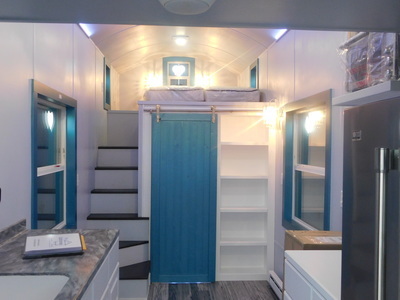 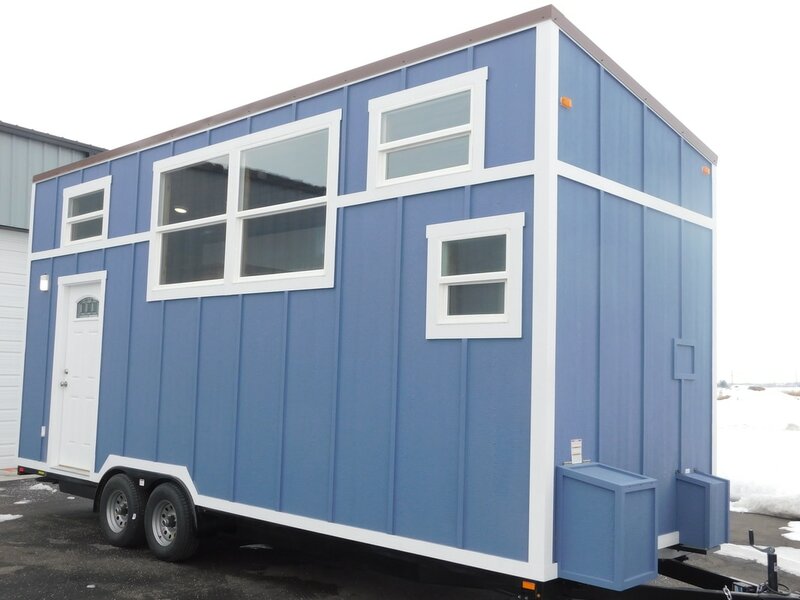 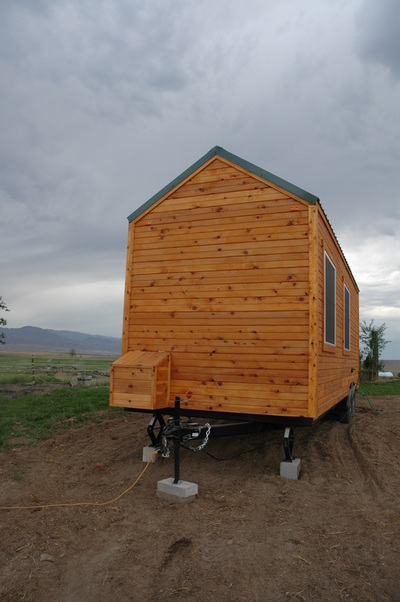 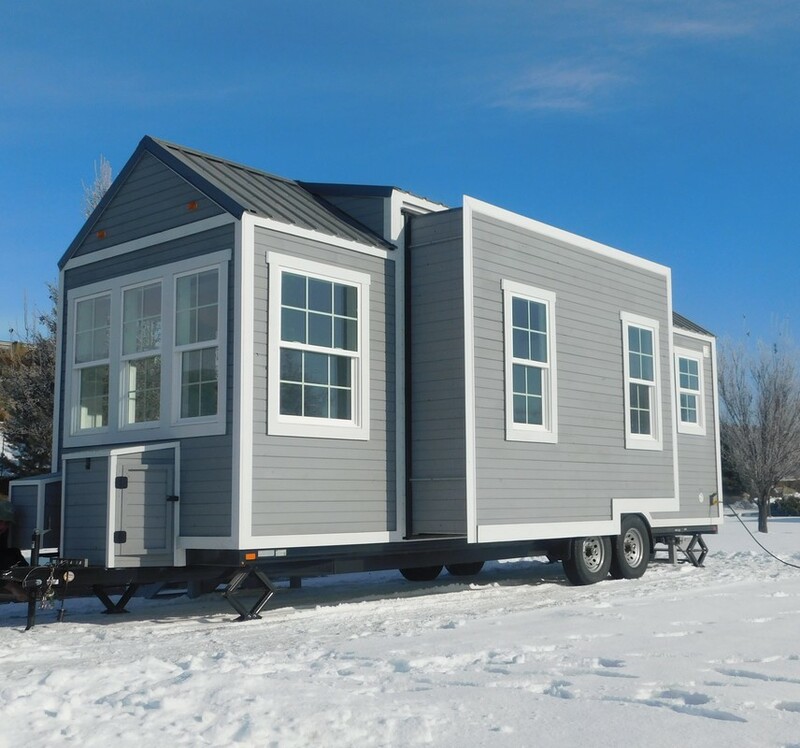 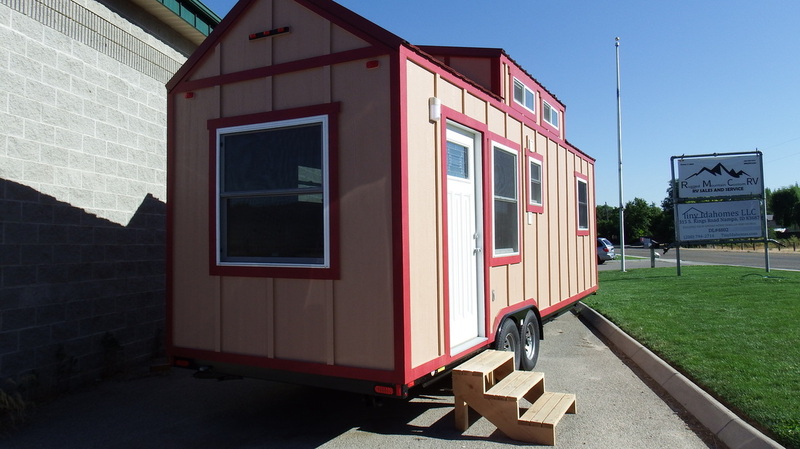 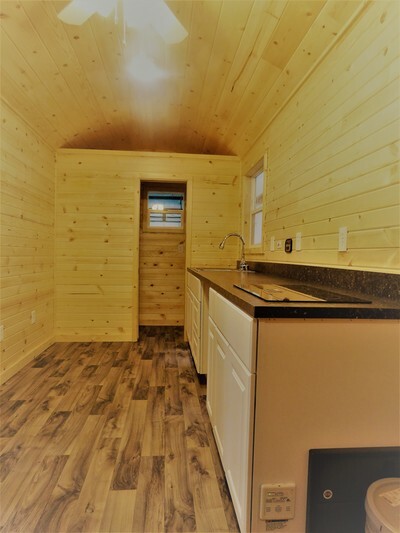 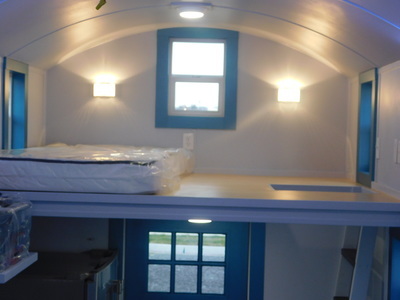 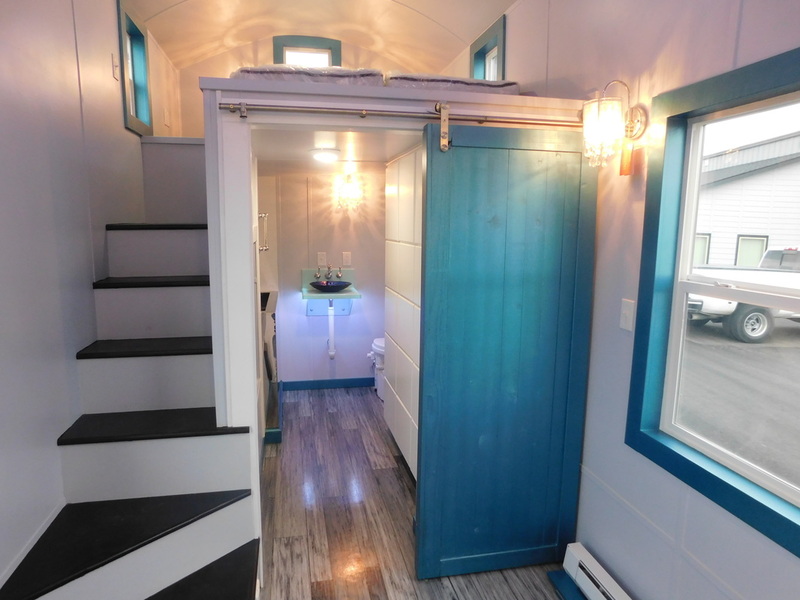 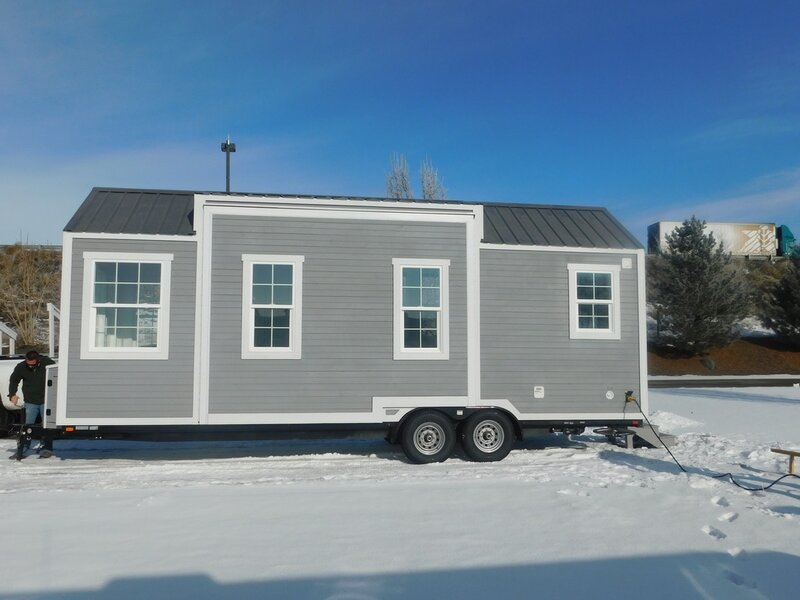 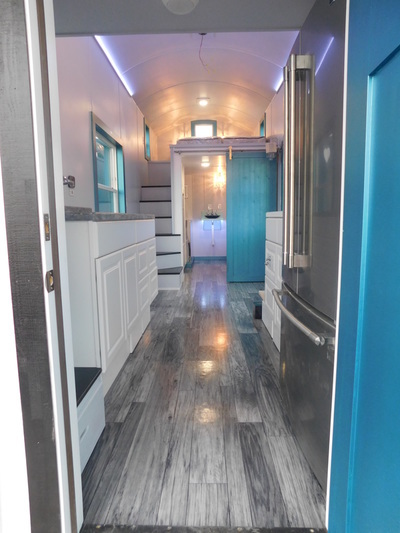 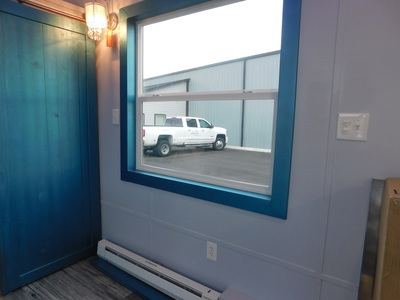 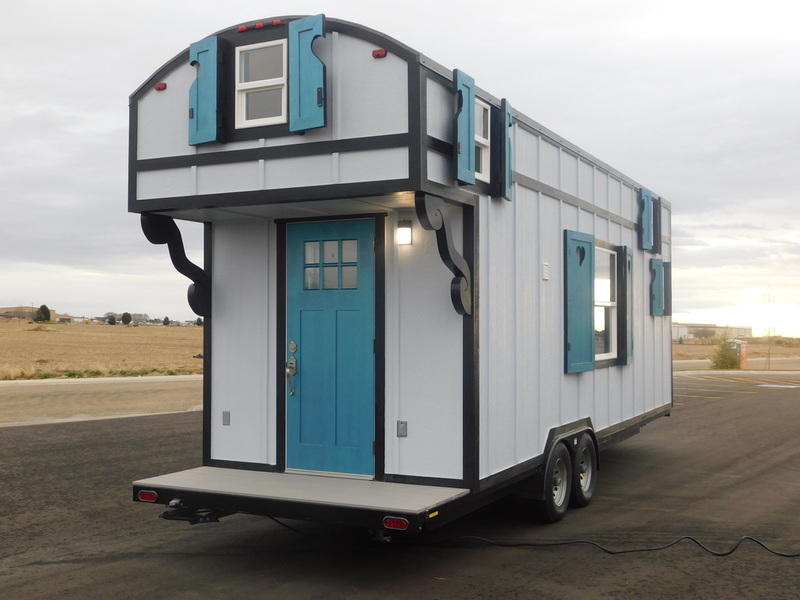 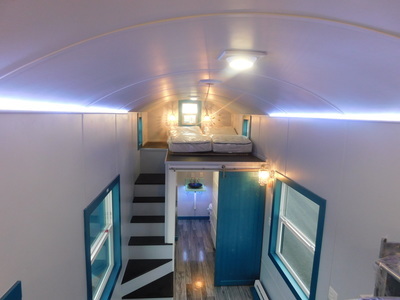 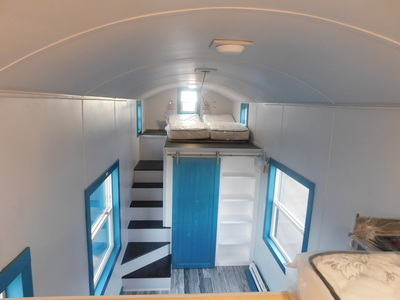 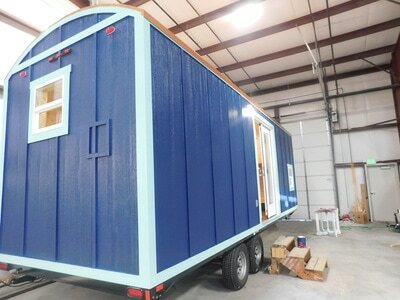 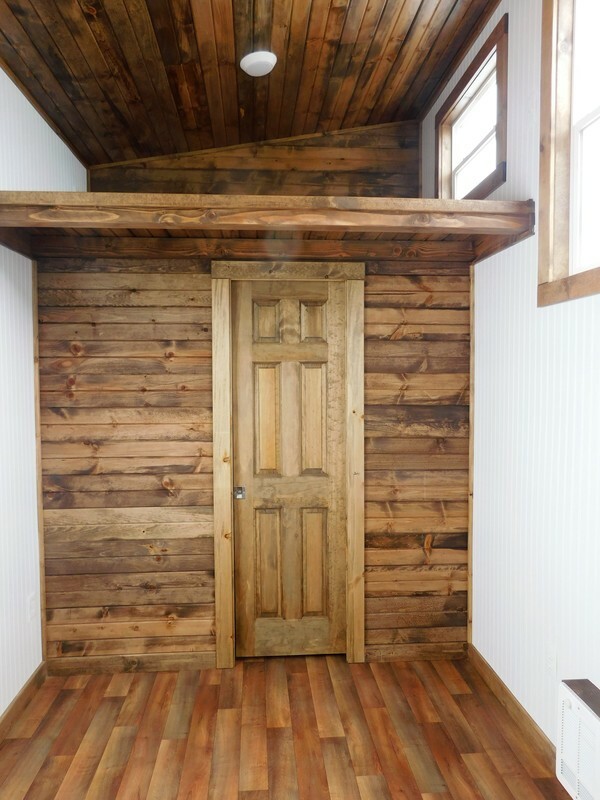 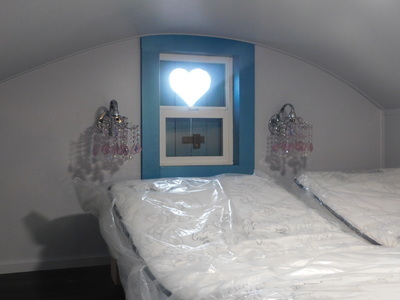 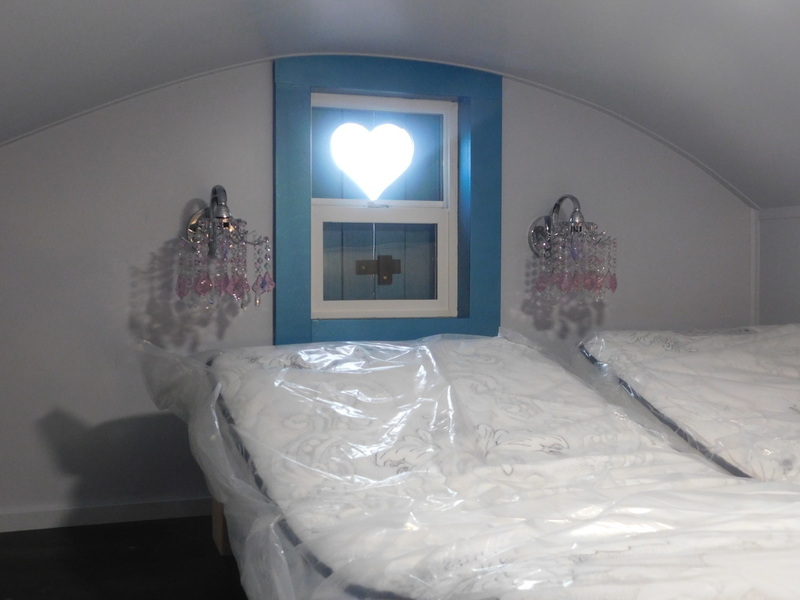 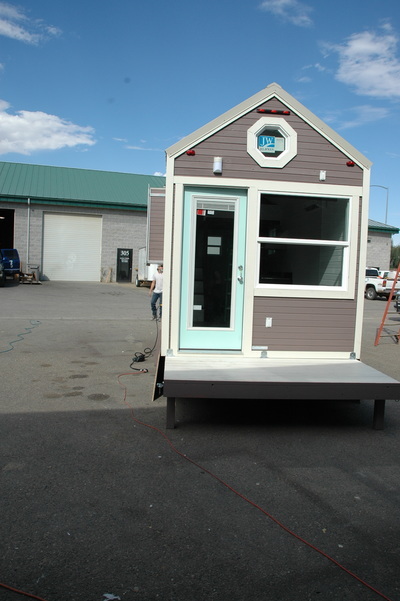 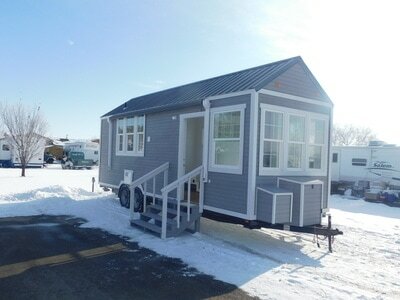 A few months ago Carmen and Tim came into our office asking us if we would be able to build them their dream tiny house that looks and feels like the old French Storyteller with lots of chandeliers and special touches. 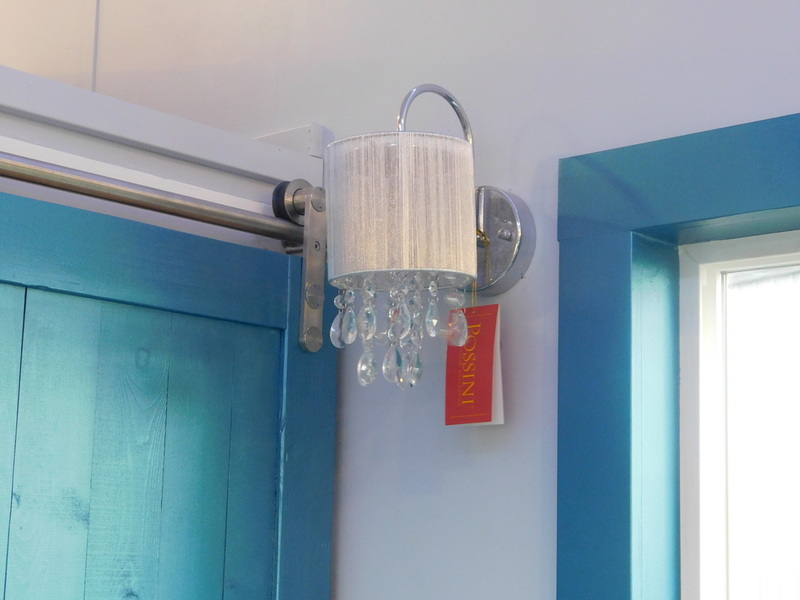 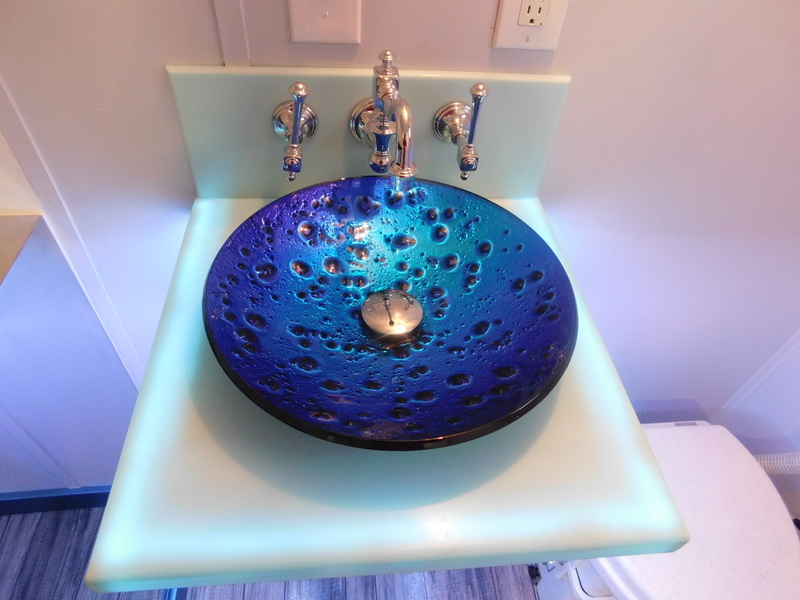 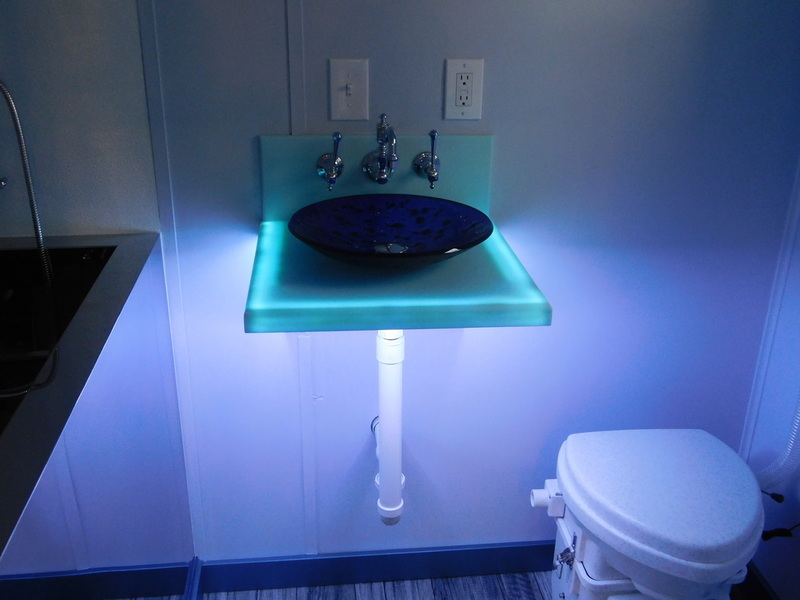 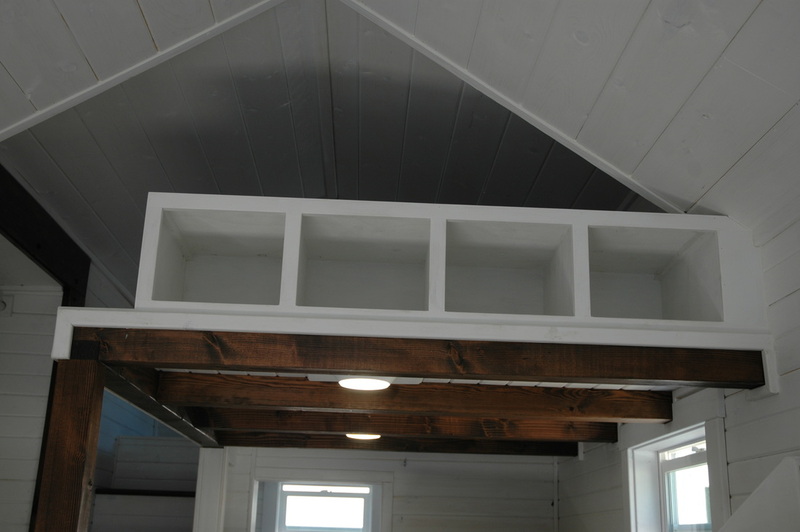 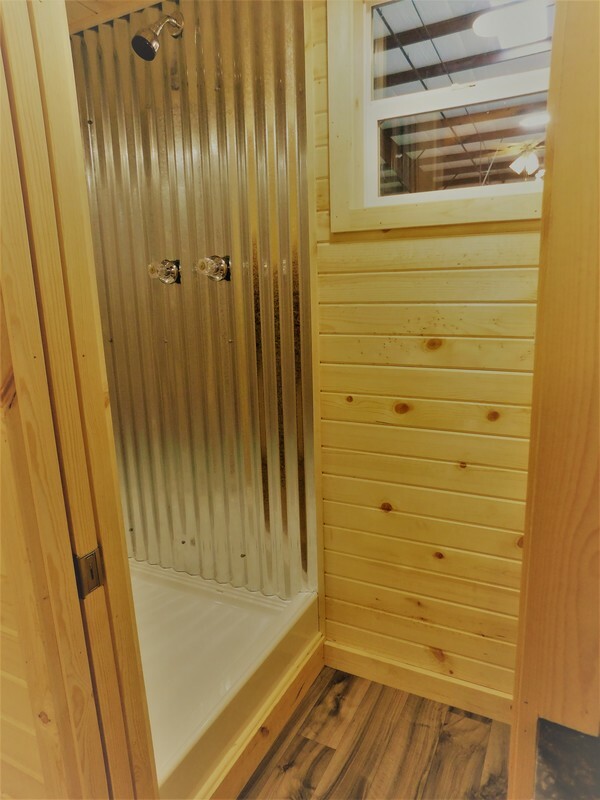 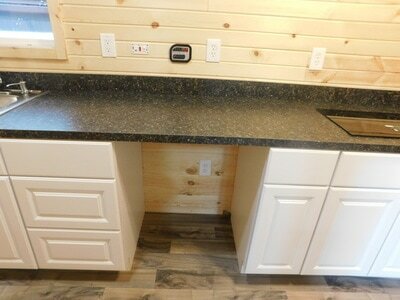 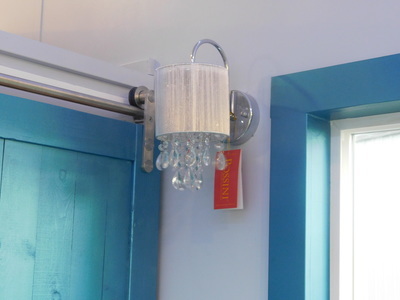 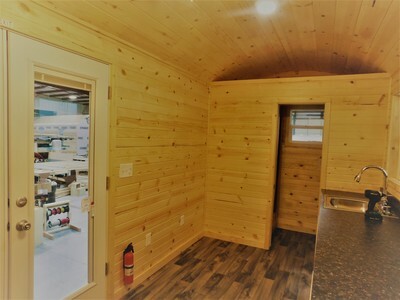 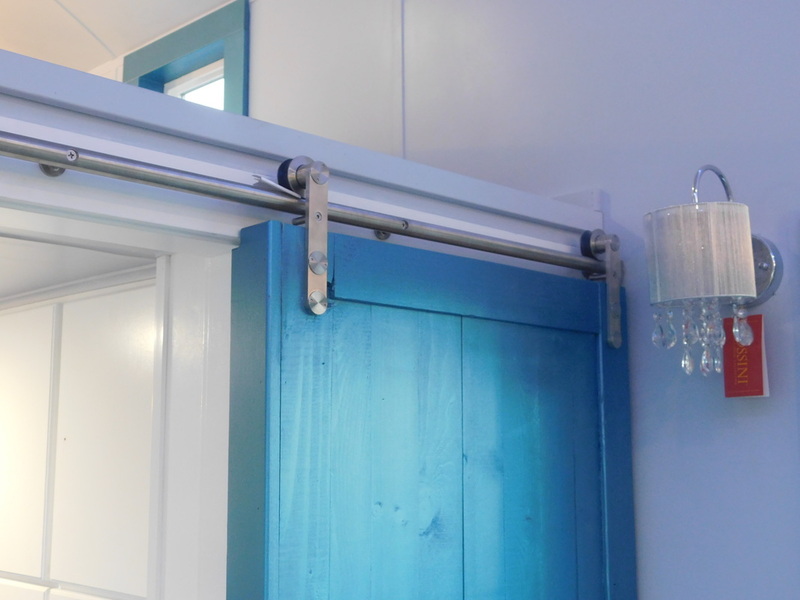 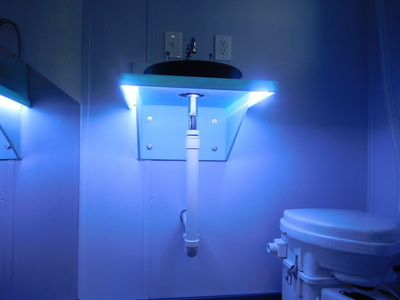 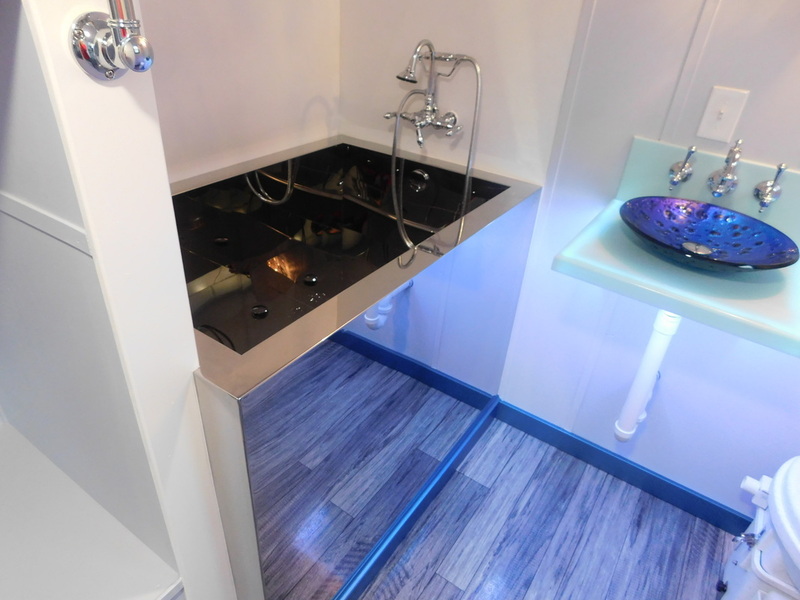 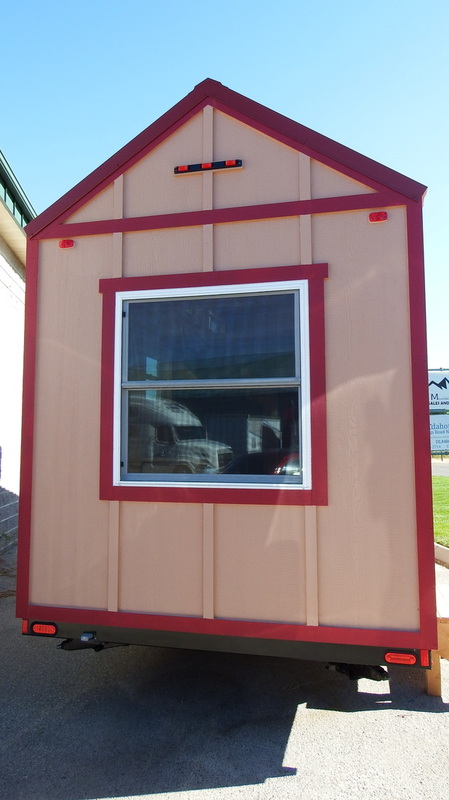 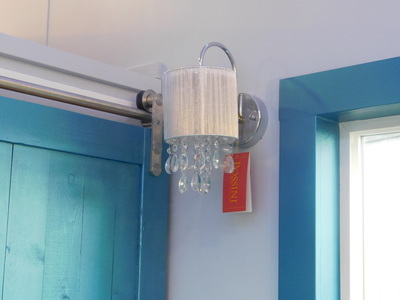 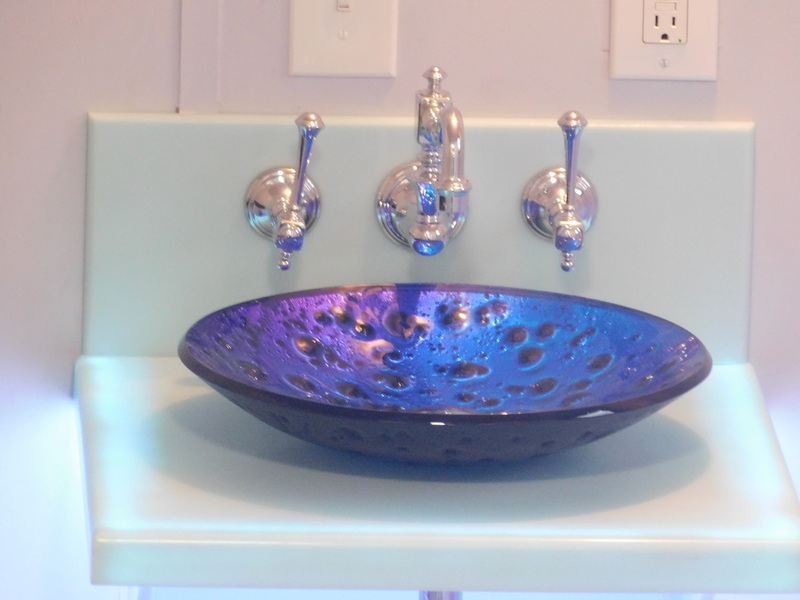 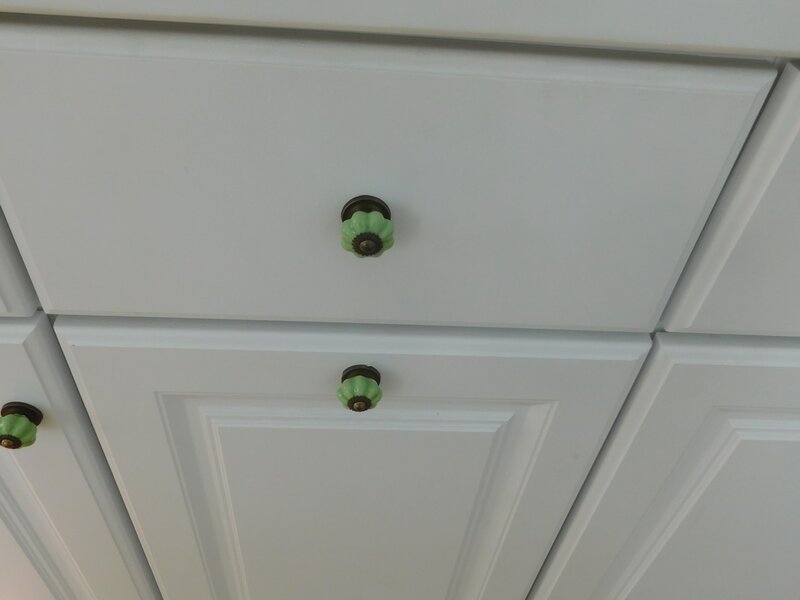 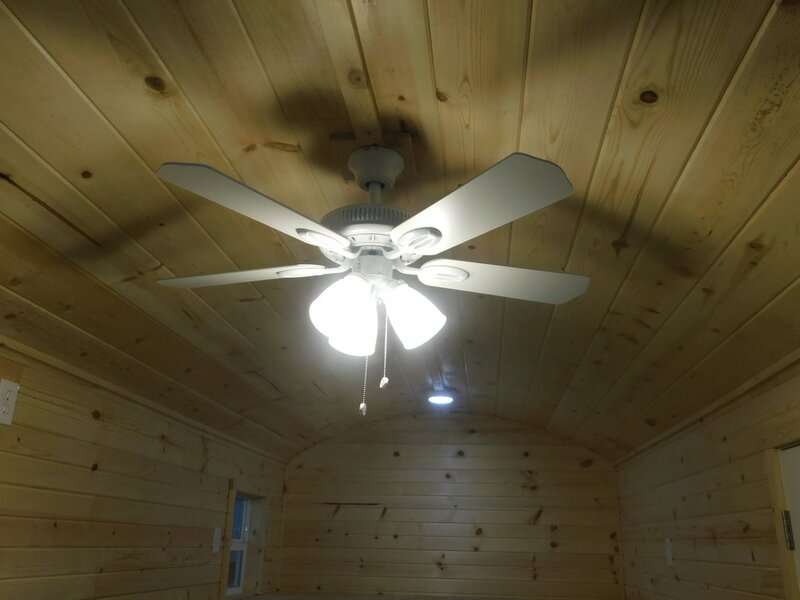 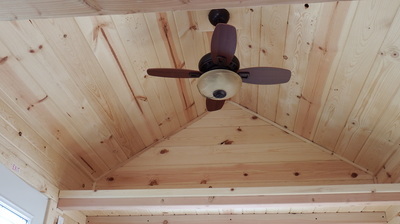 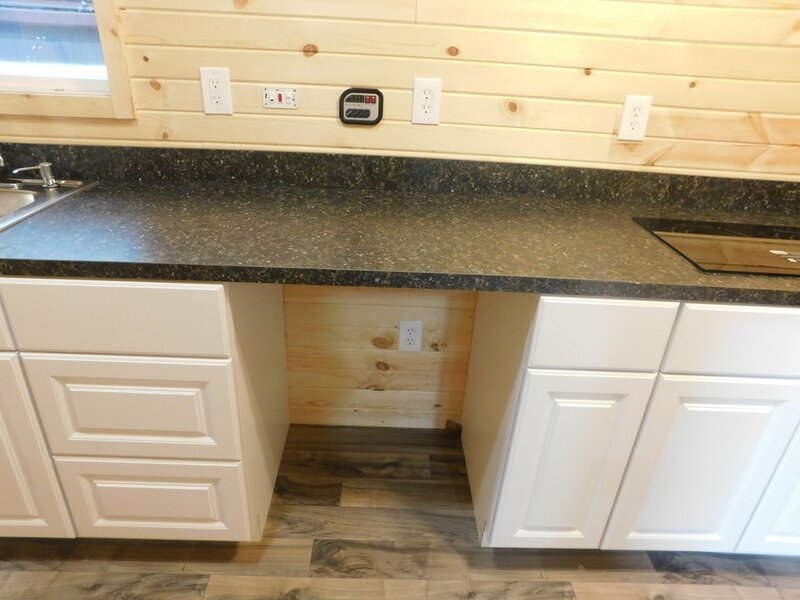 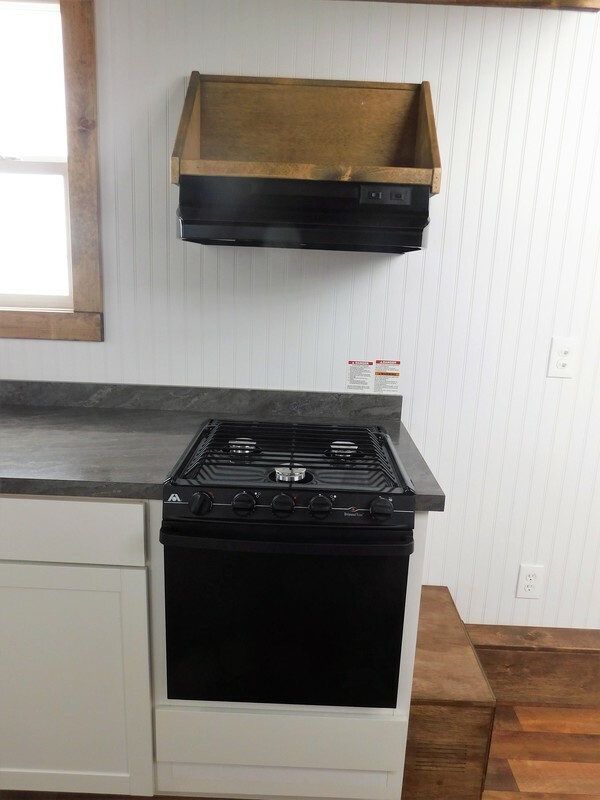 It was definitely a different request that required a lot of customization but intrigued us as a builder as it was something different than what we have built before. 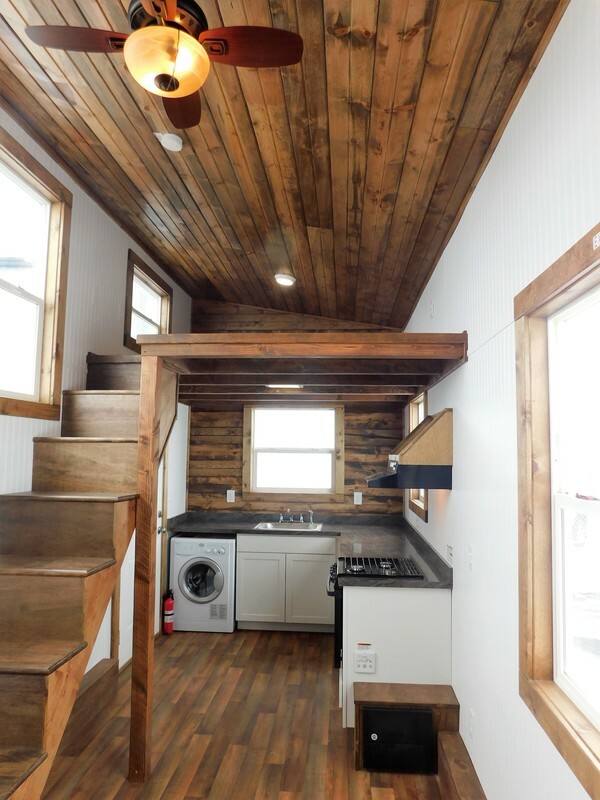 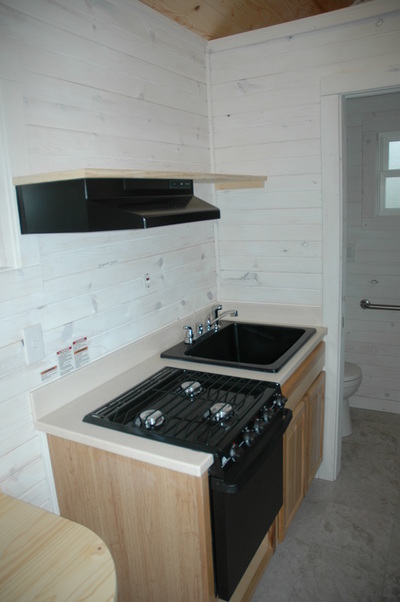 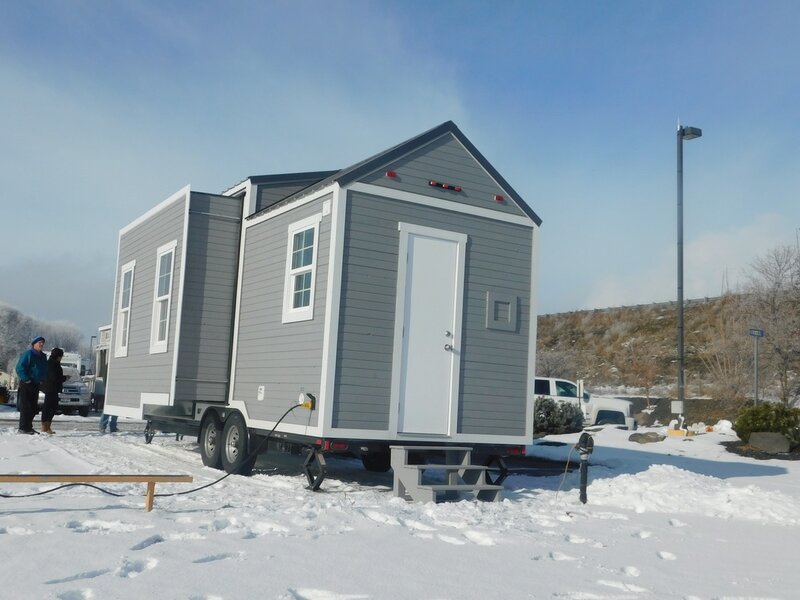 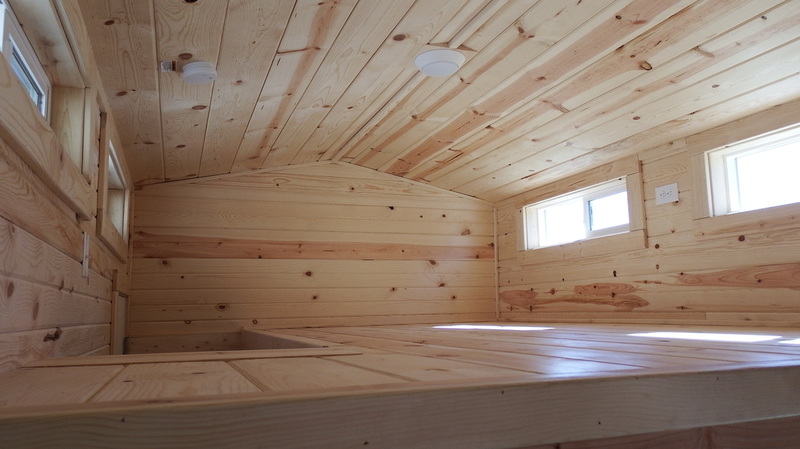 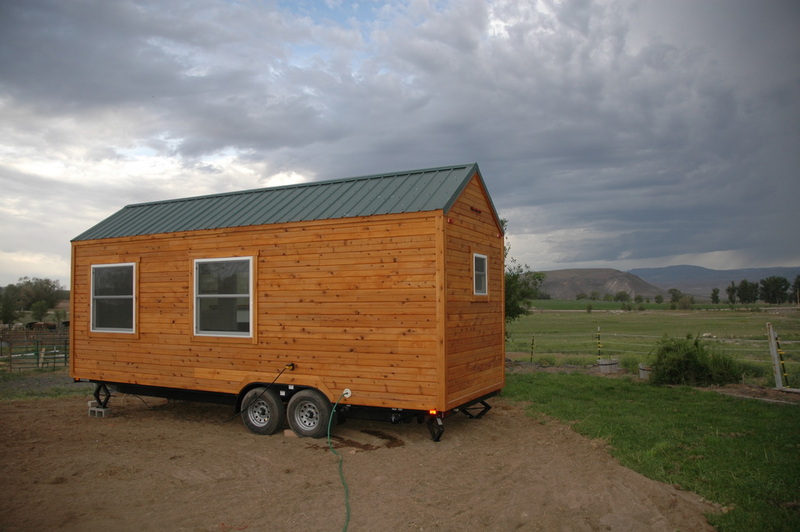 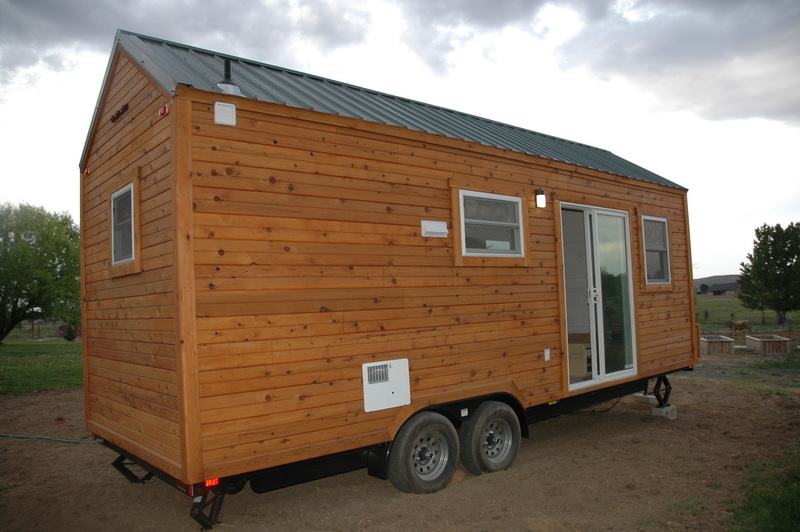 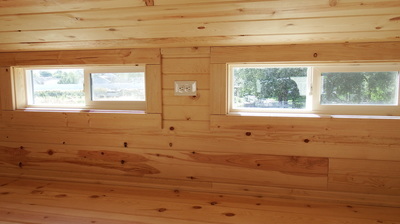 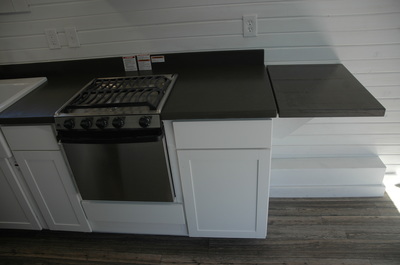 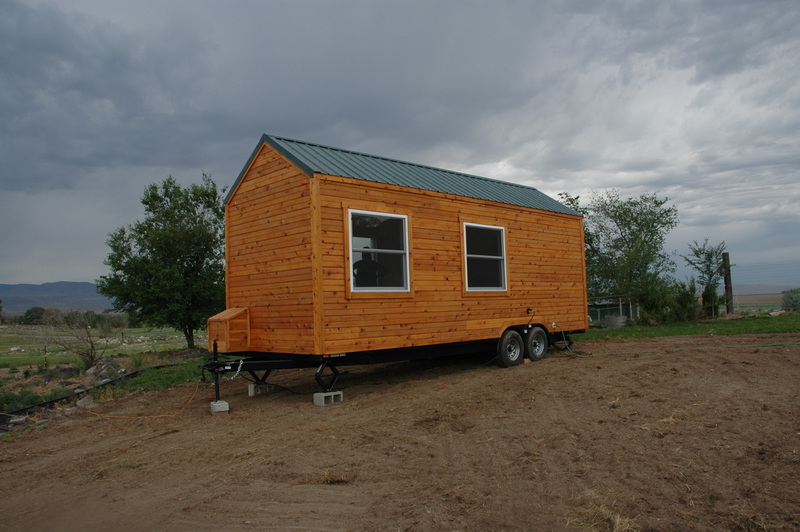 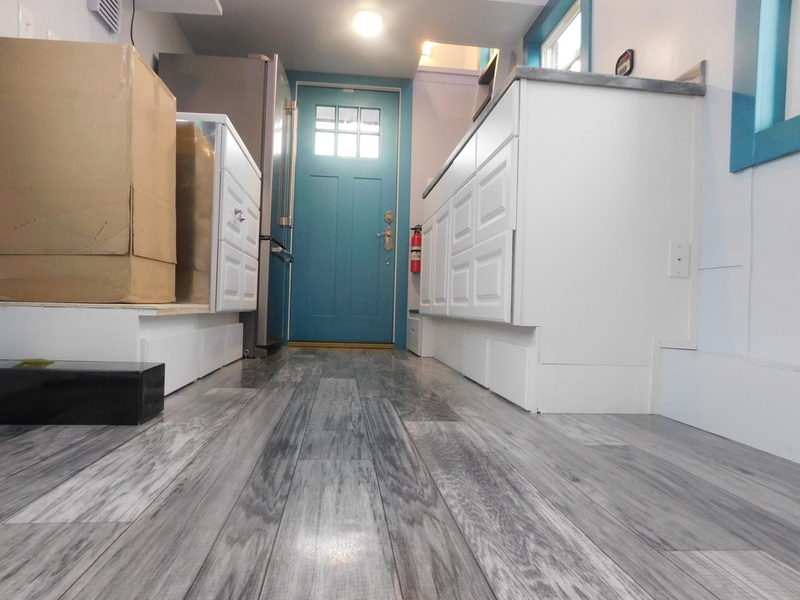 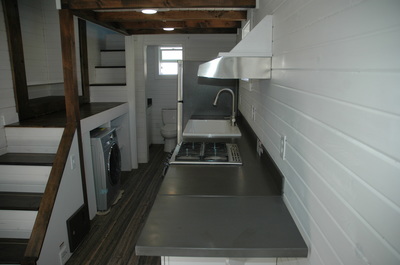 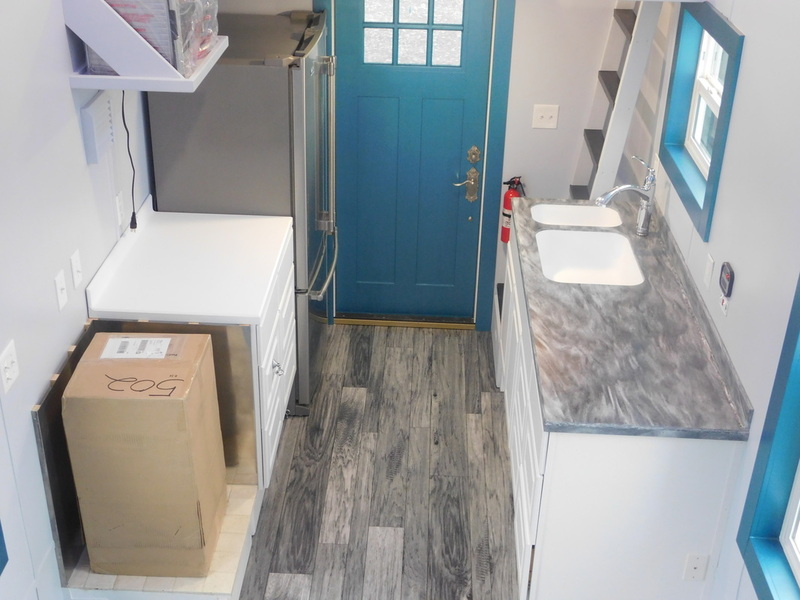 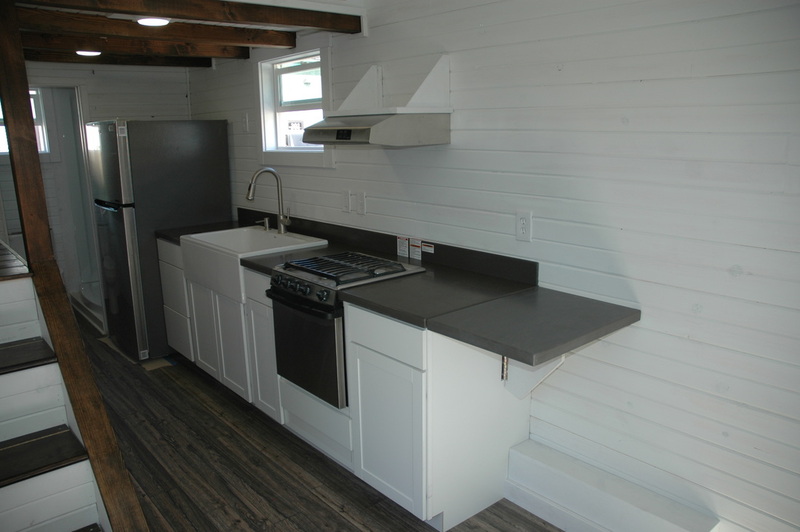 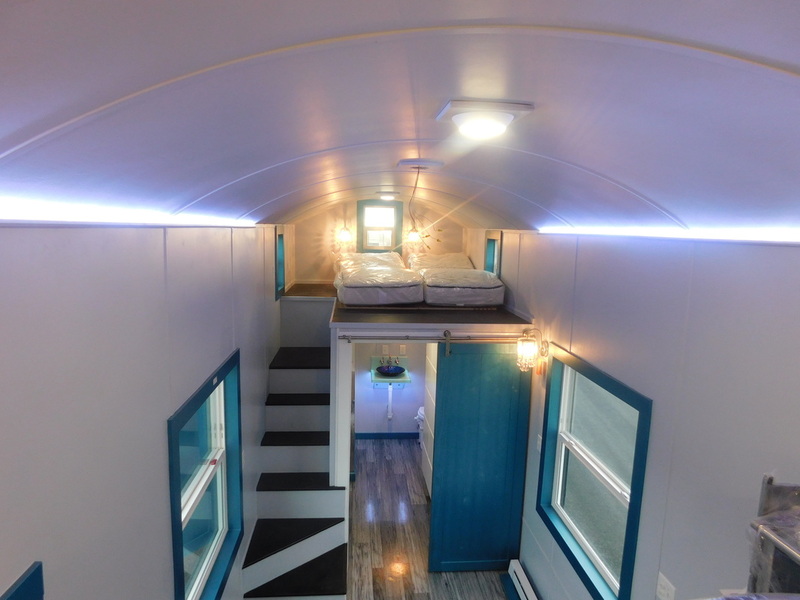 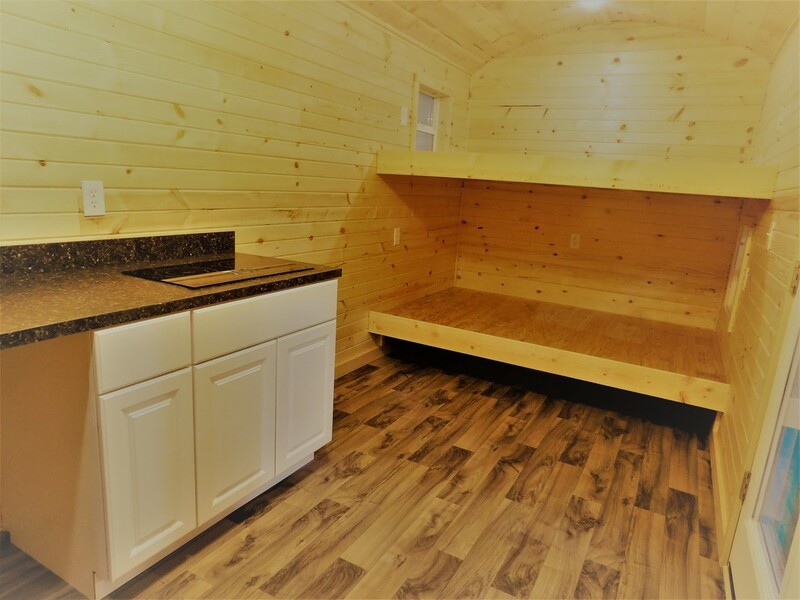 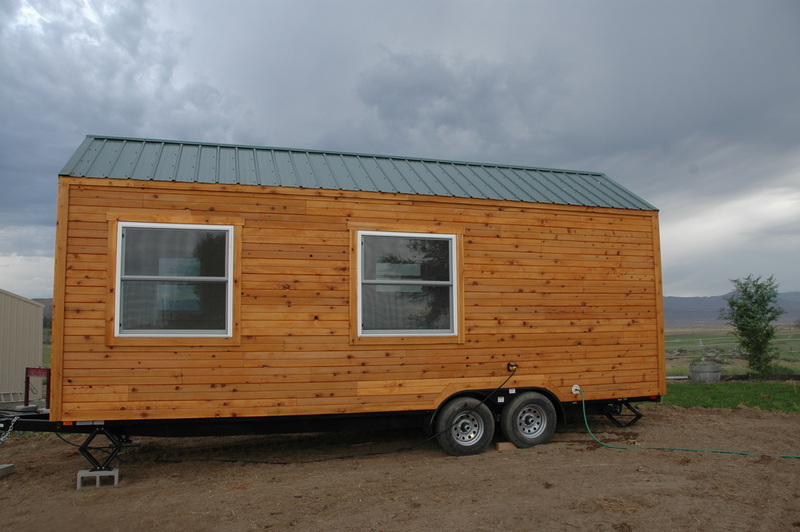 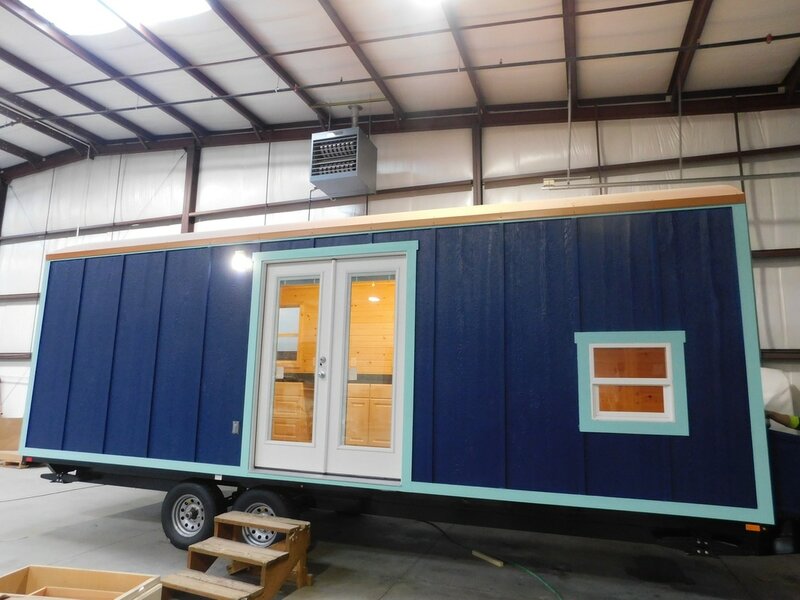 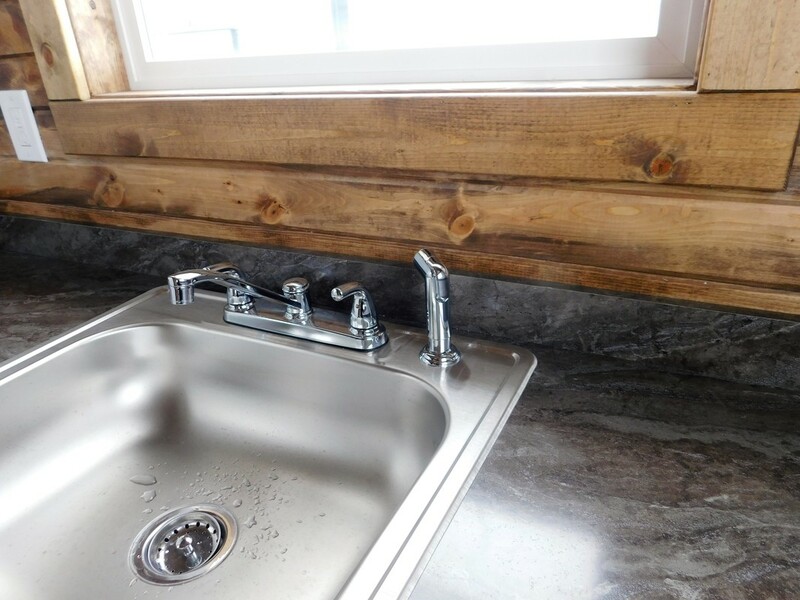 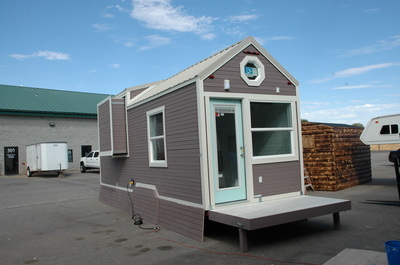 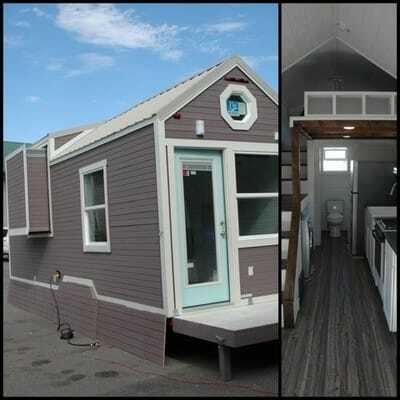 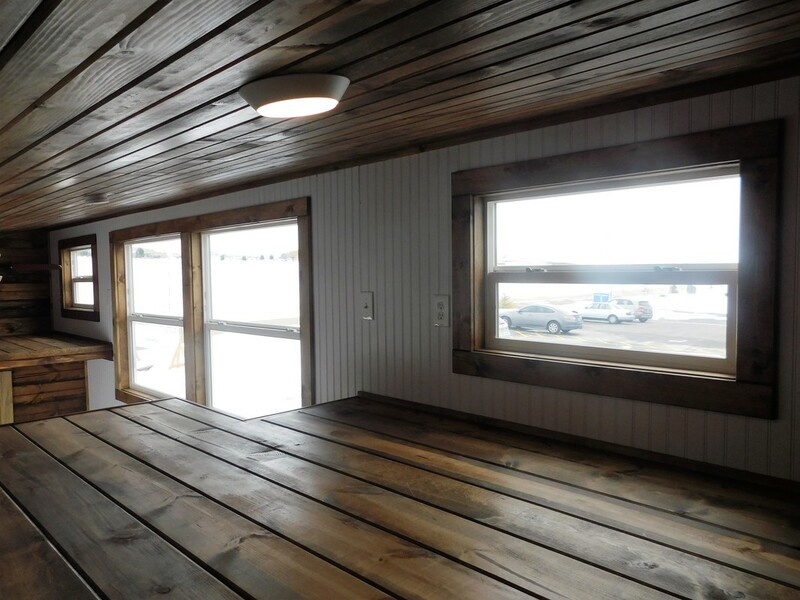 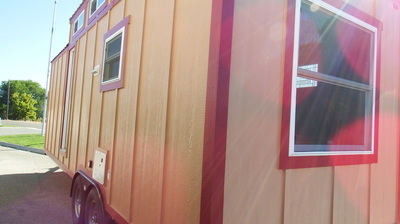 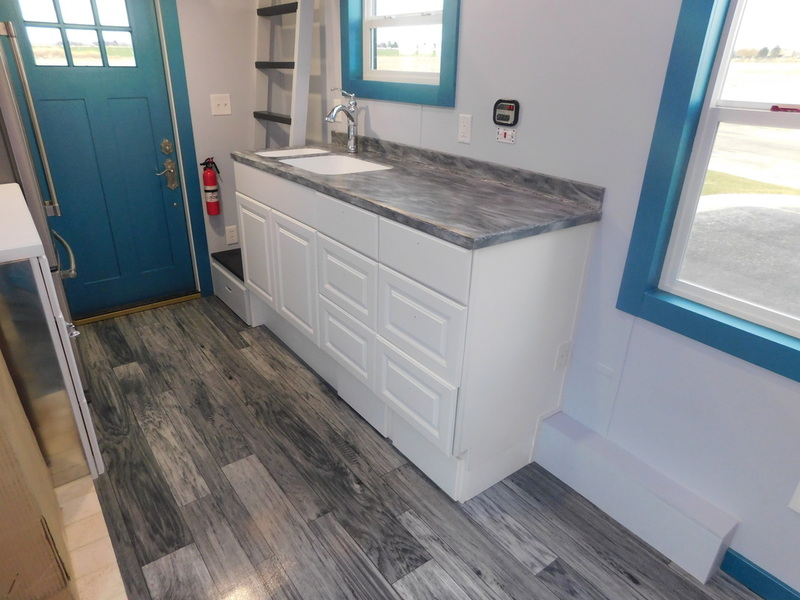 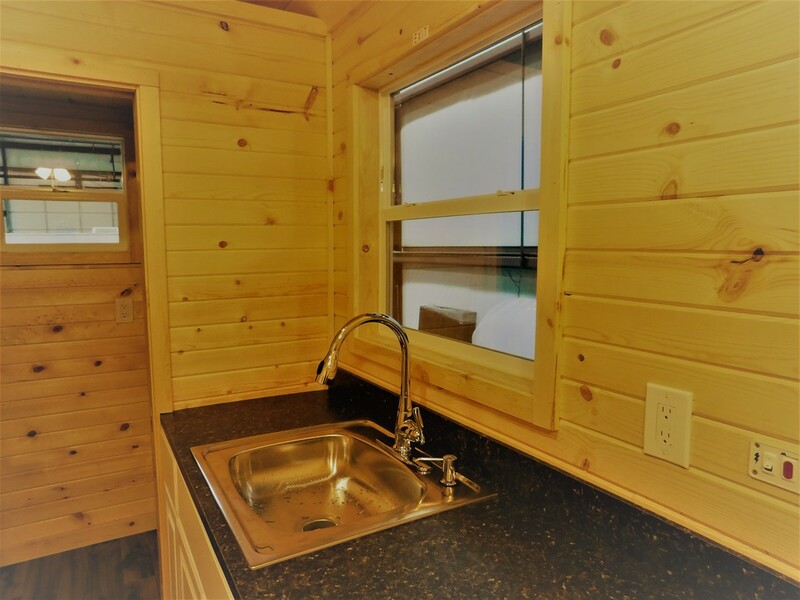 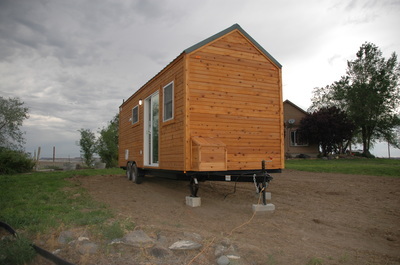 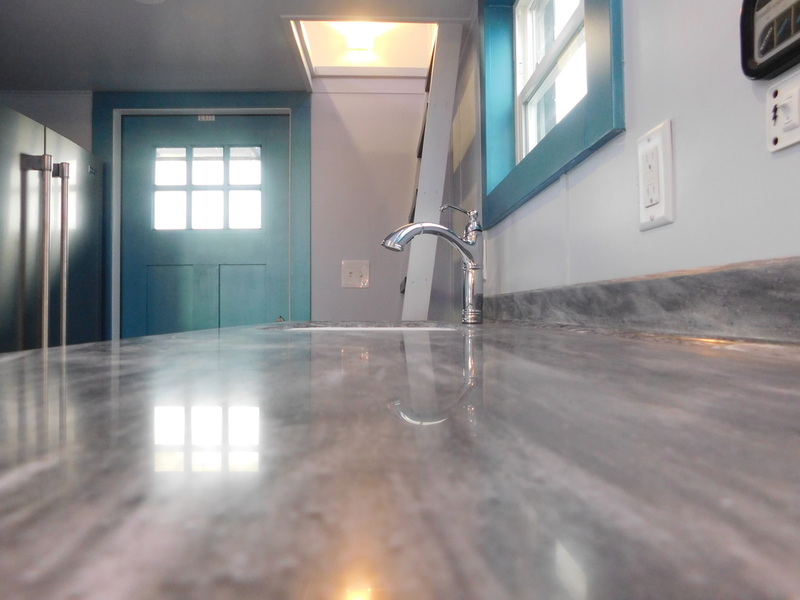 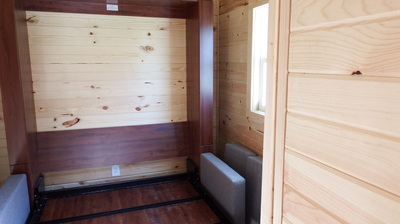 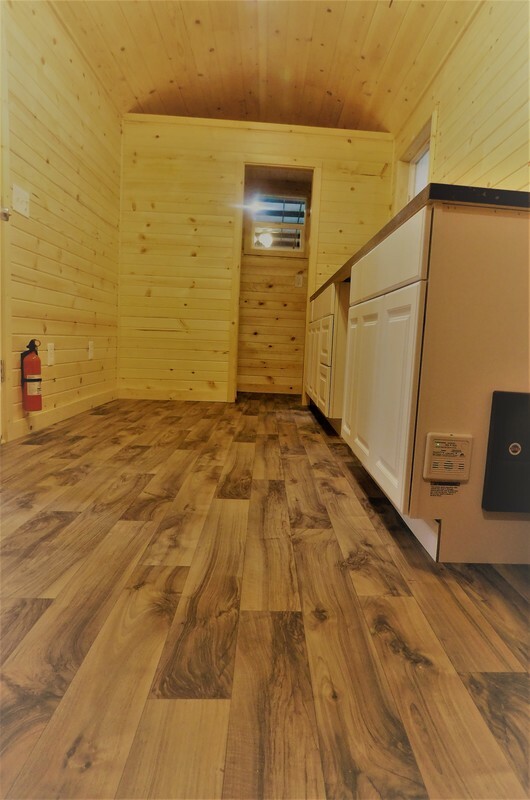 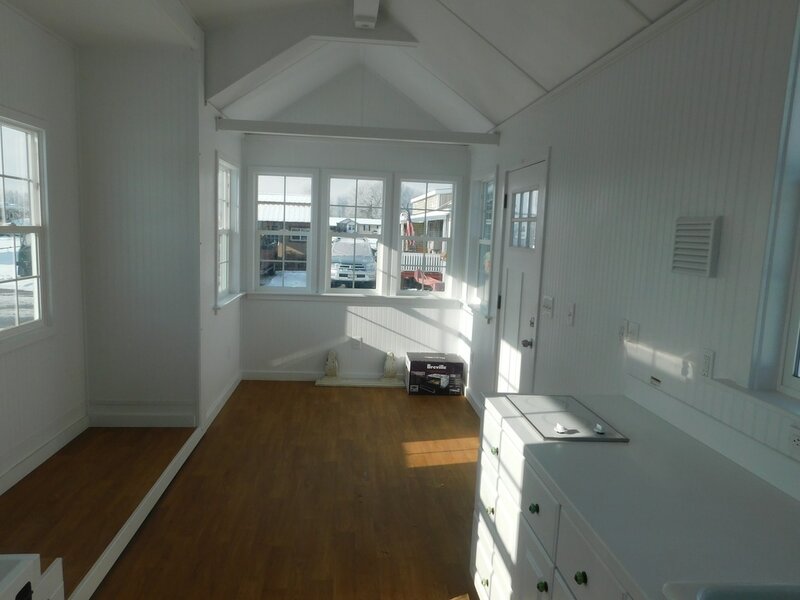 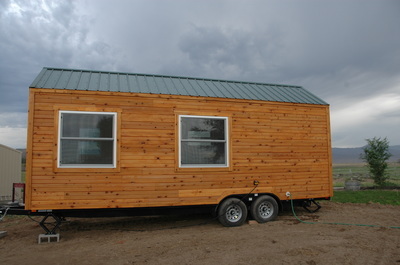 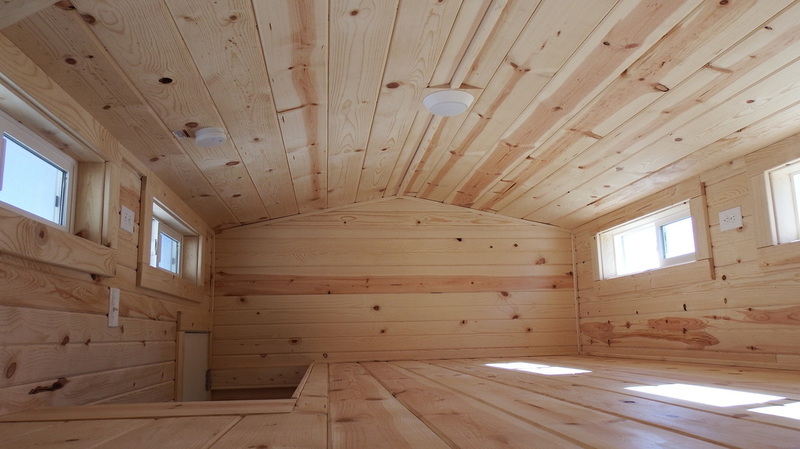 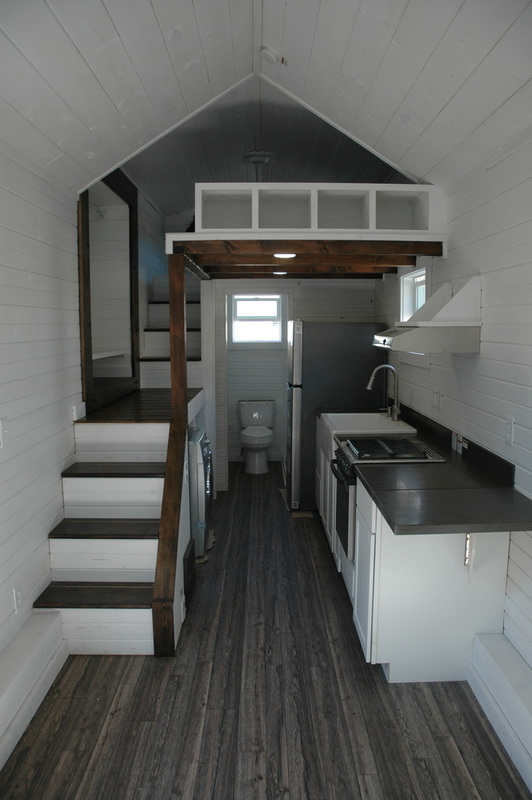 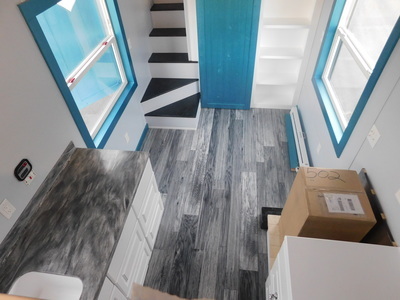 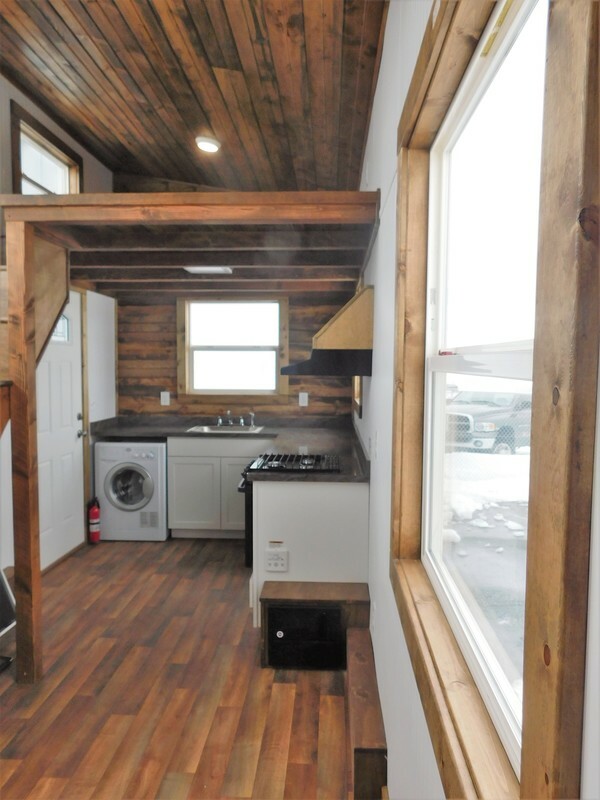 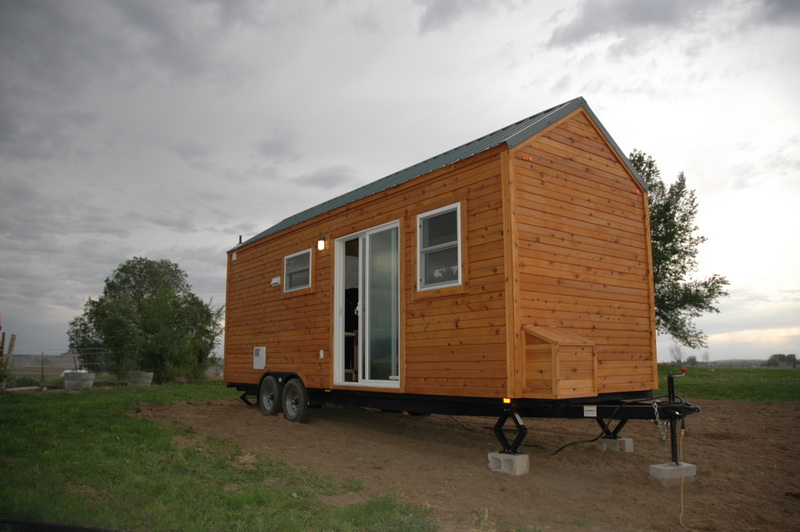 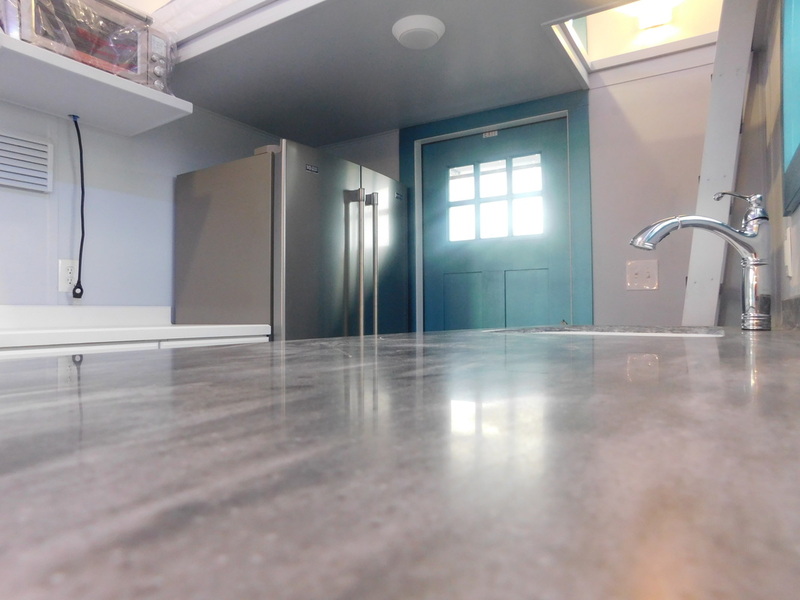 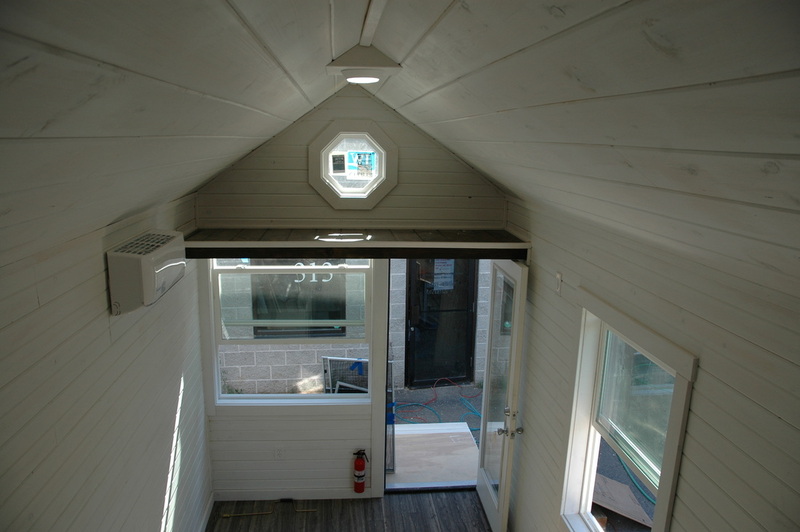 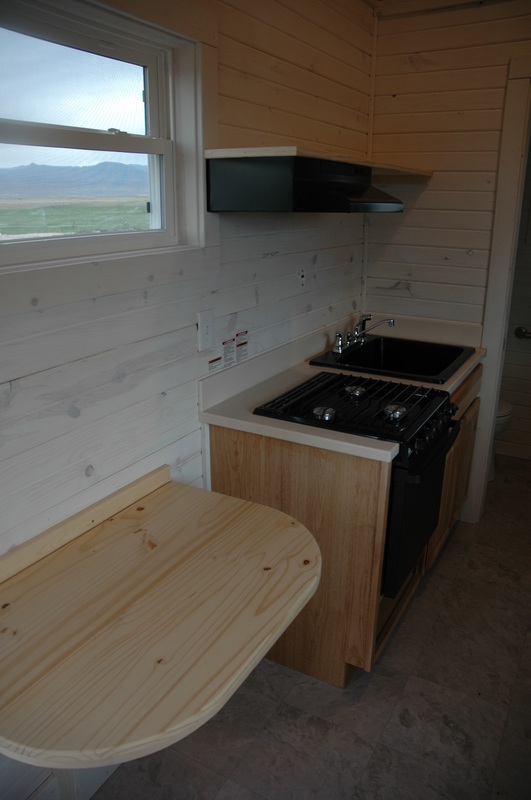 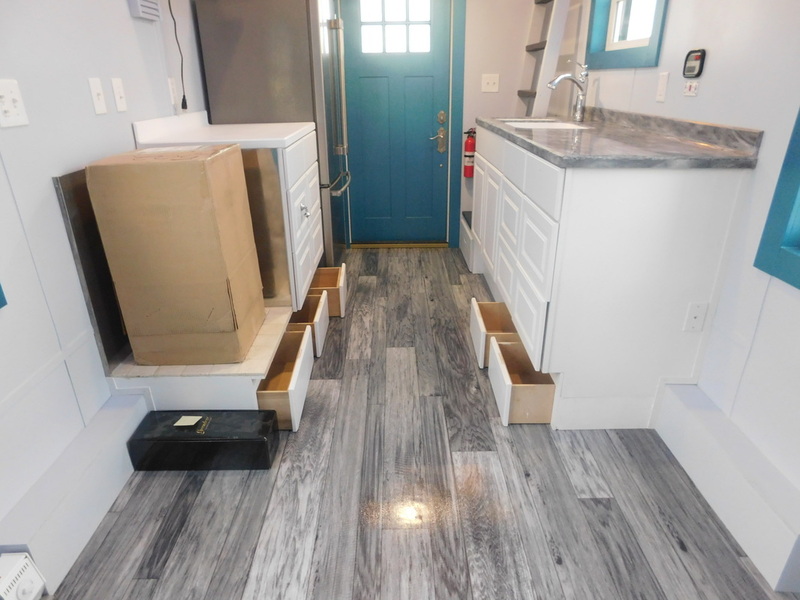 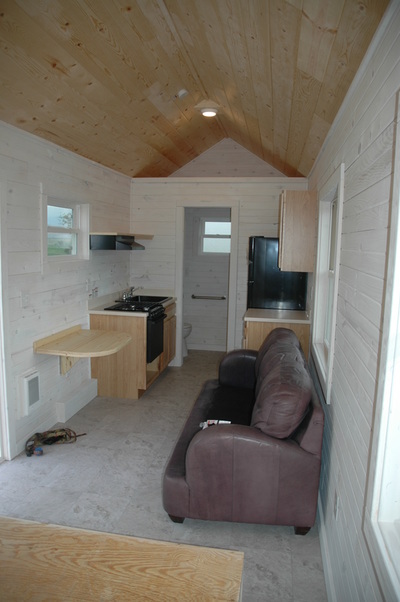 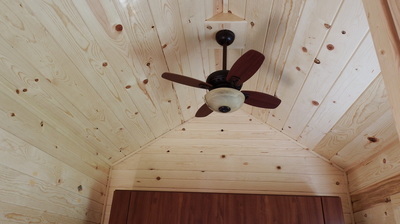 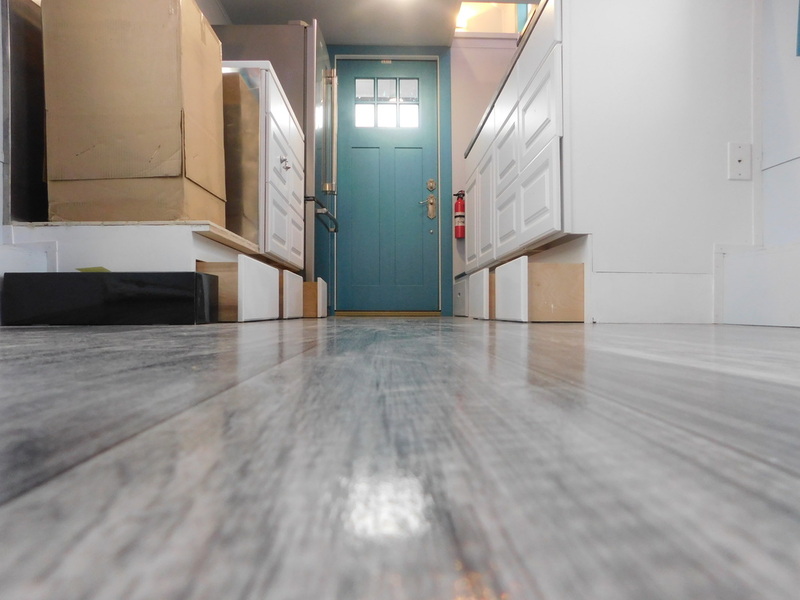 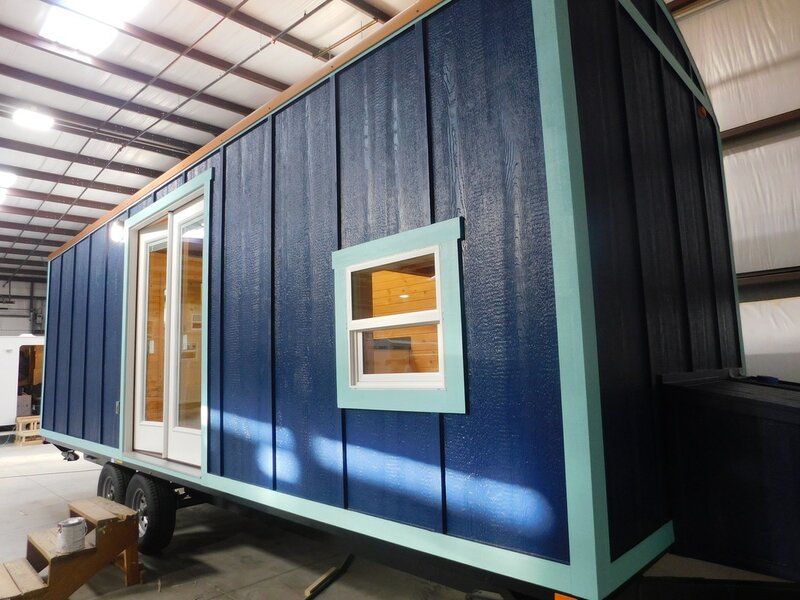 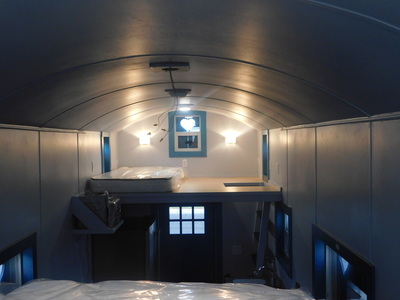 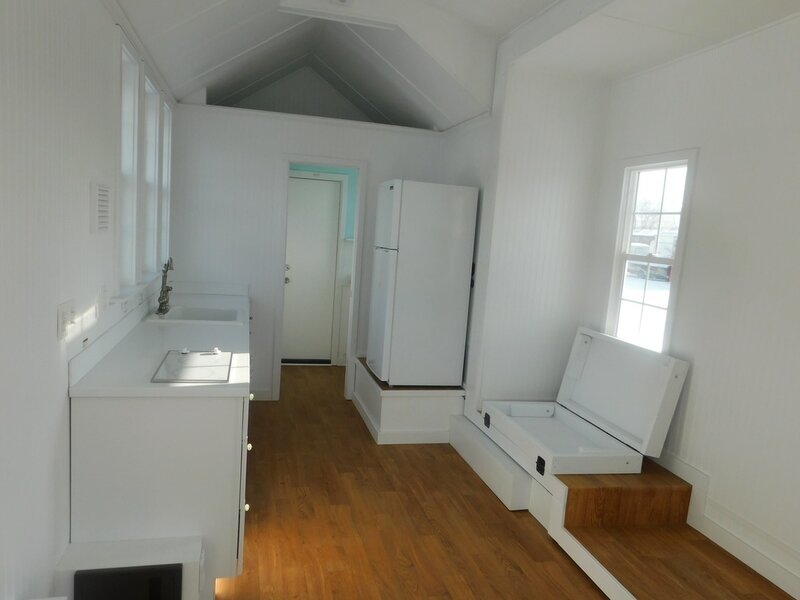 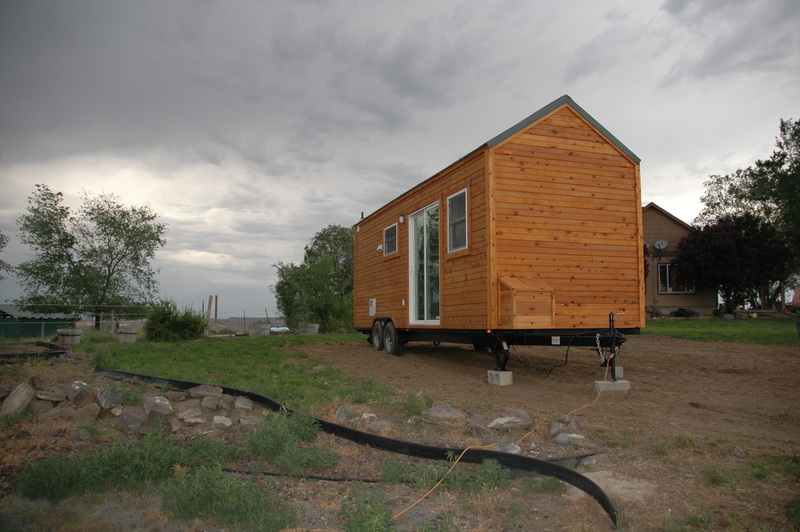 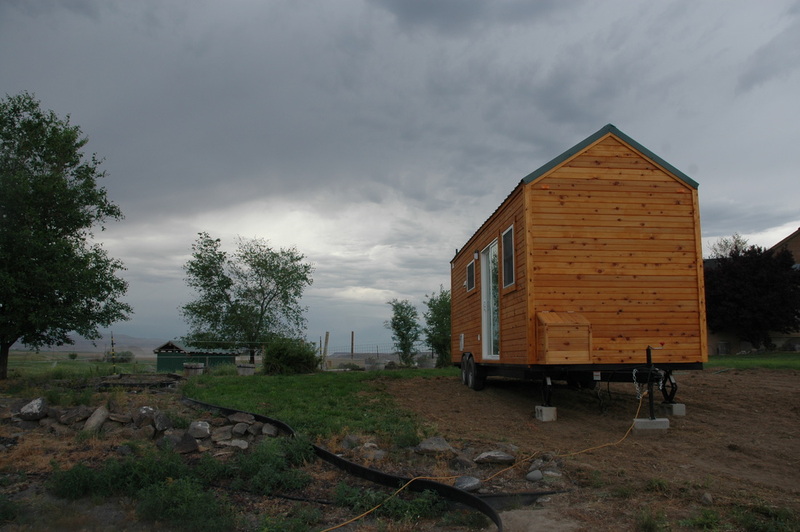 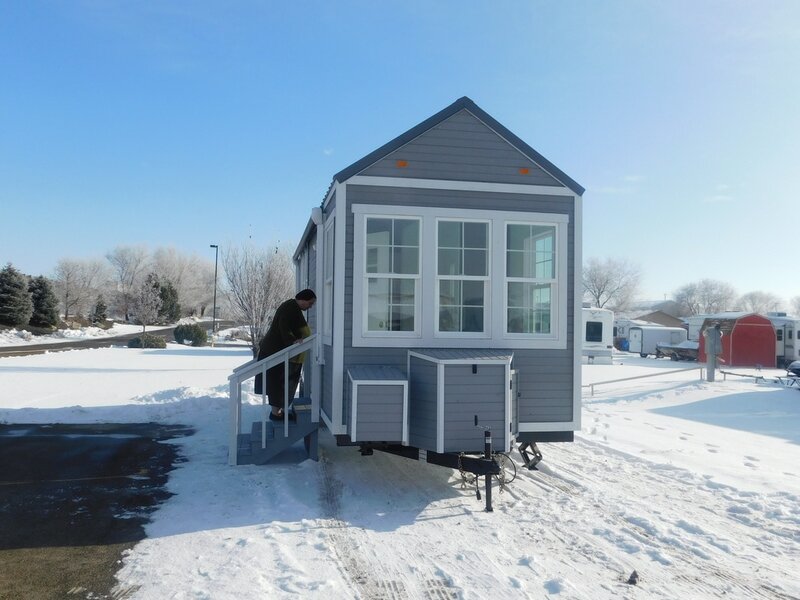 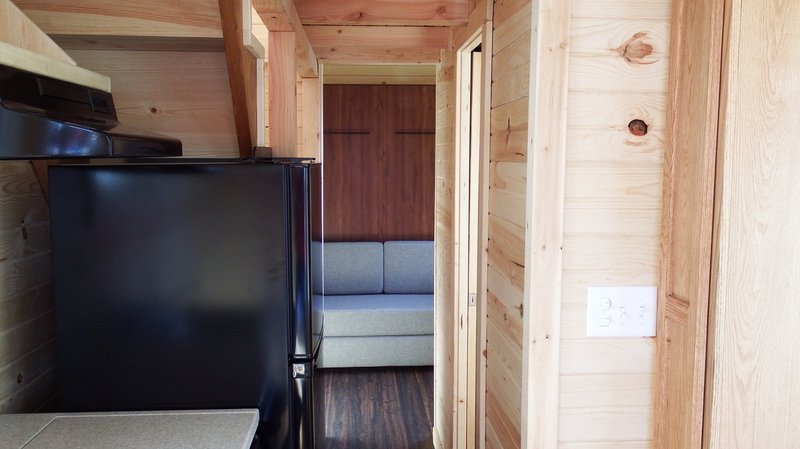 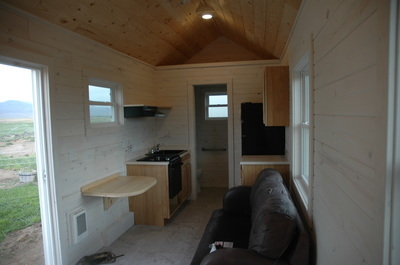 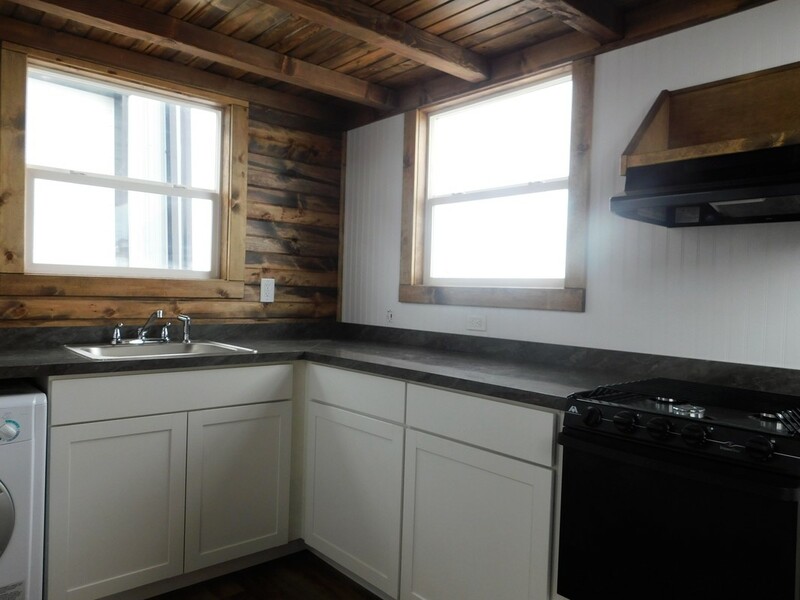 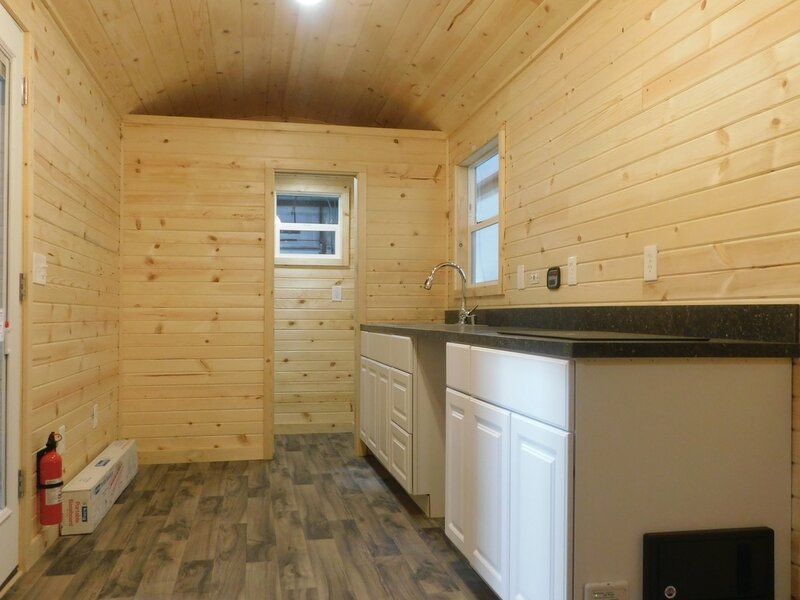 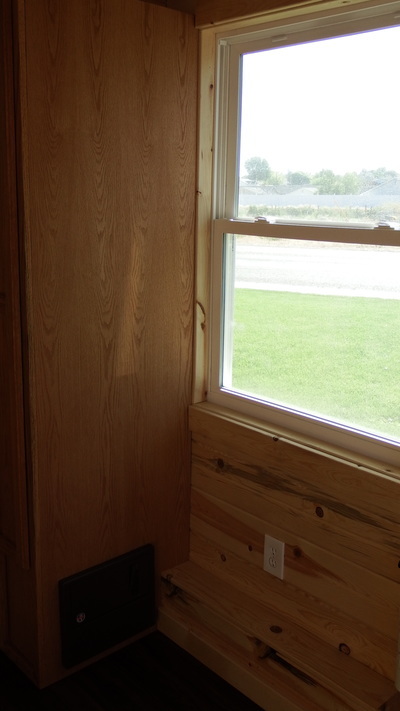 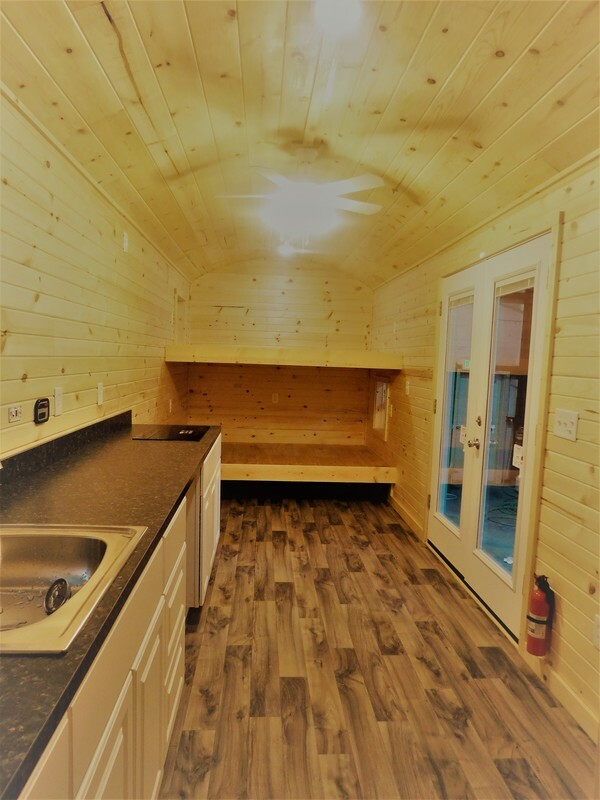 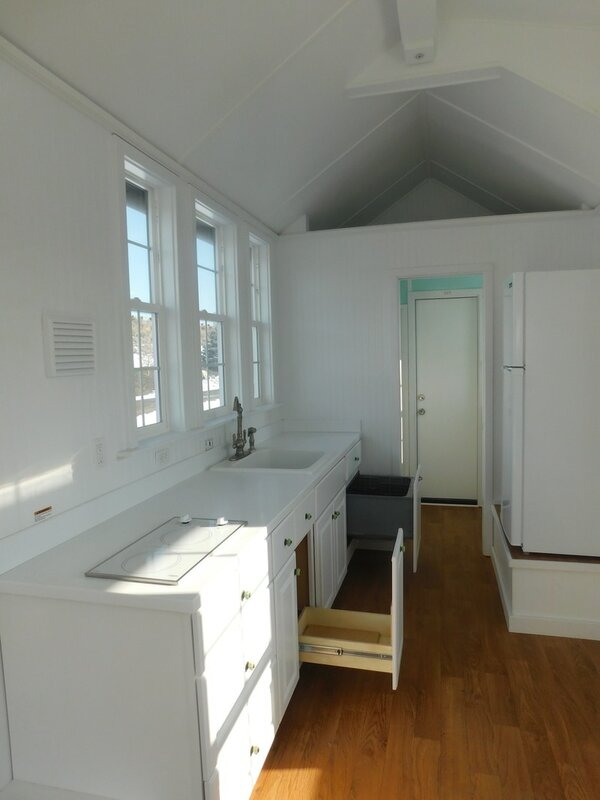 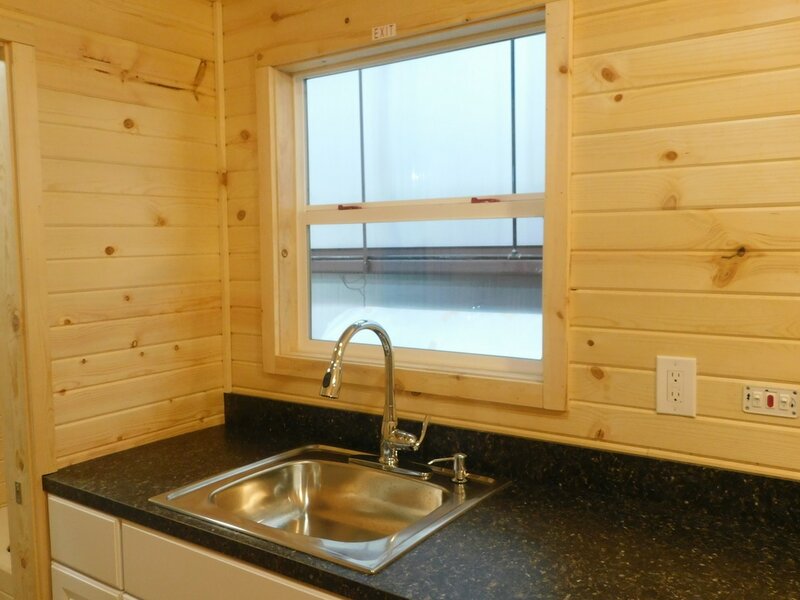 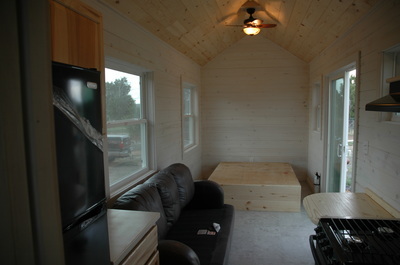 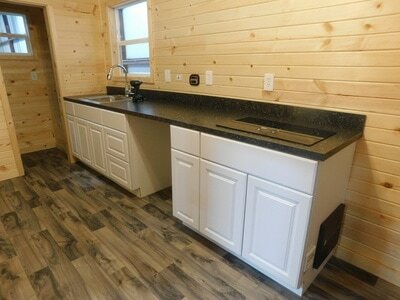 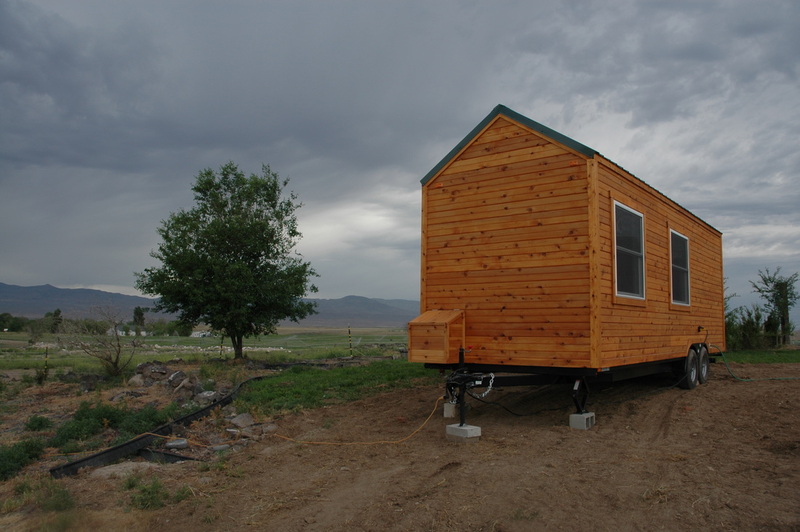 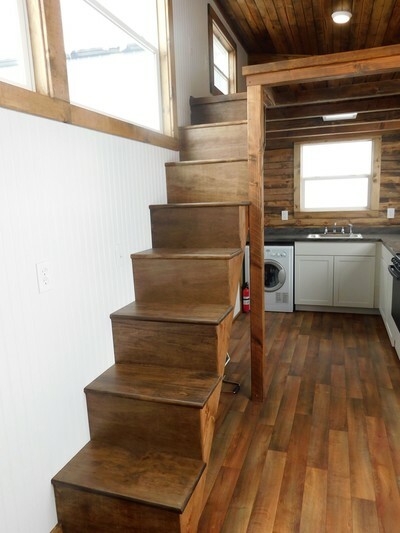 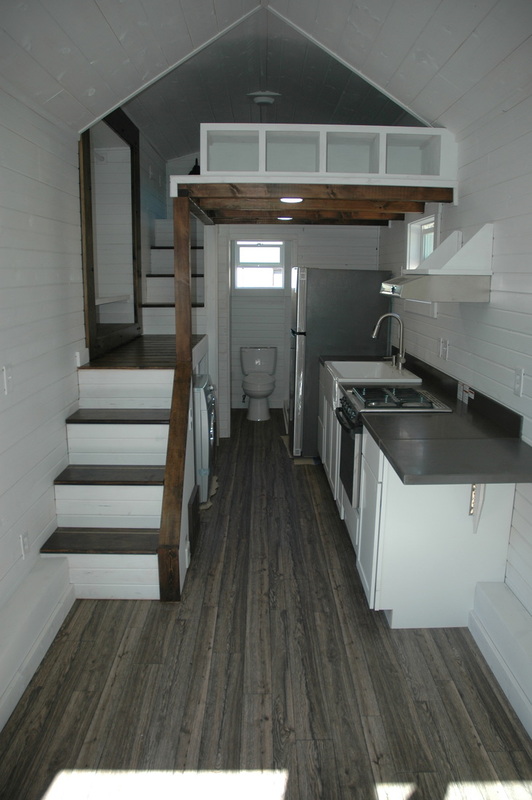 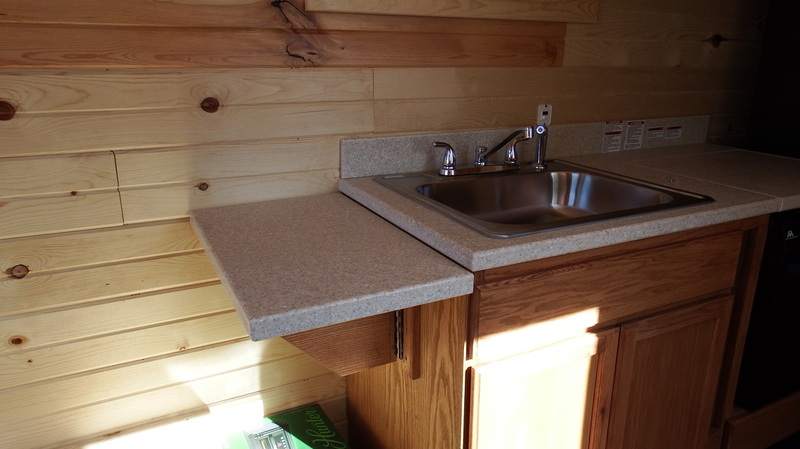 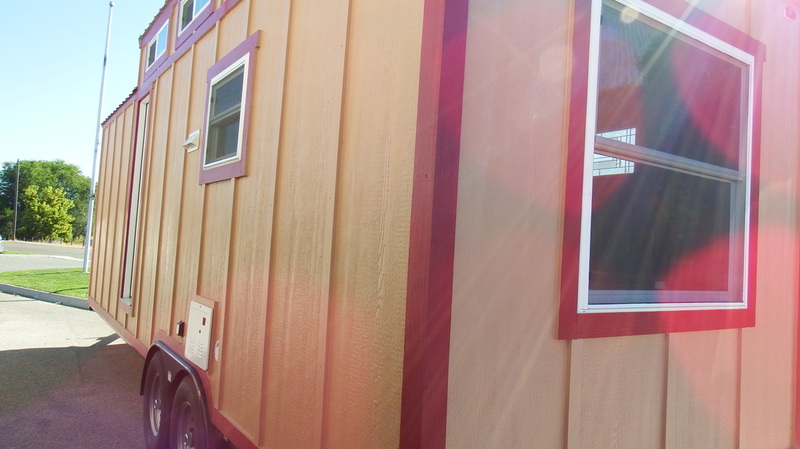 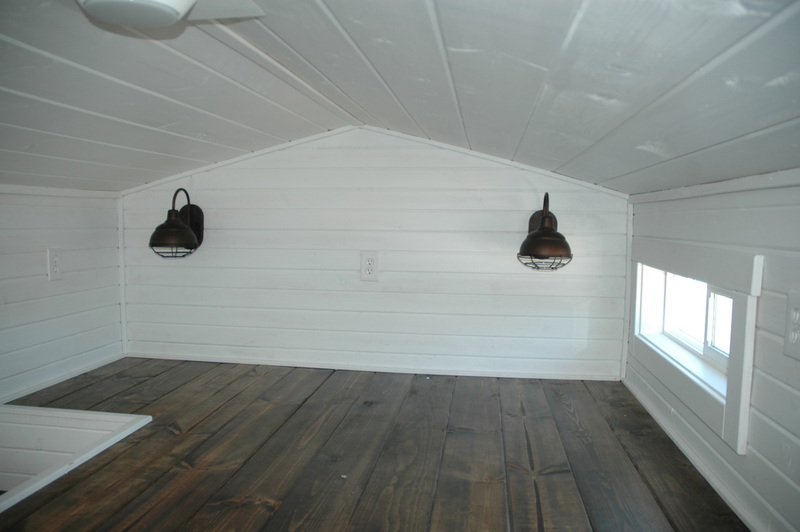 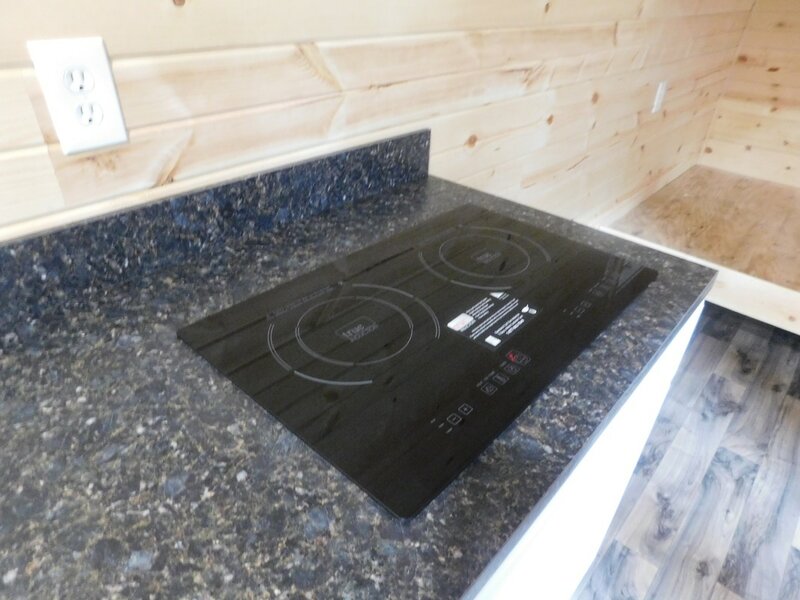 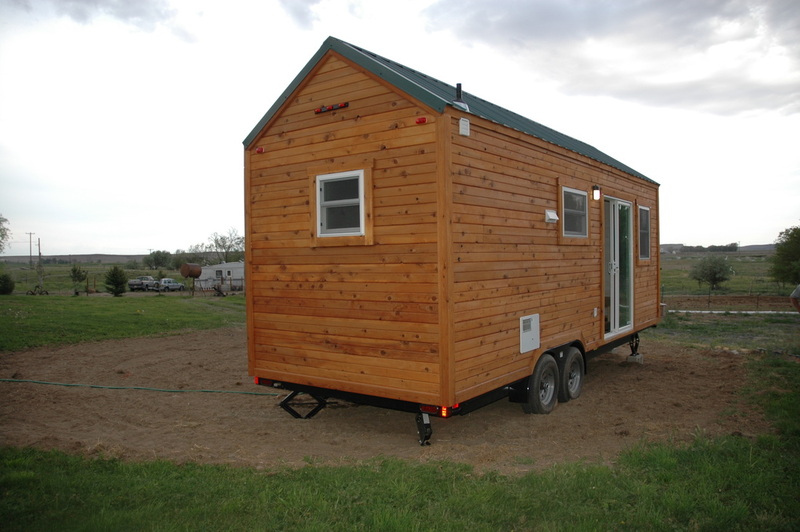 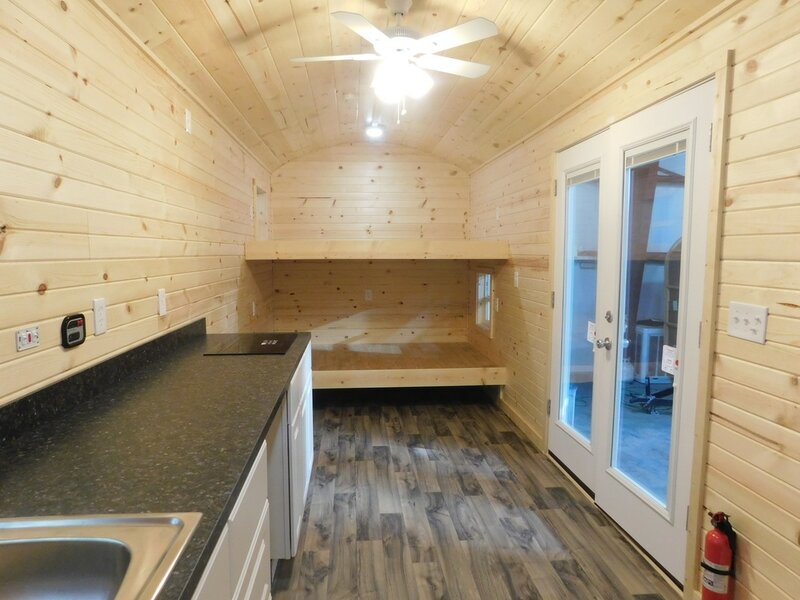 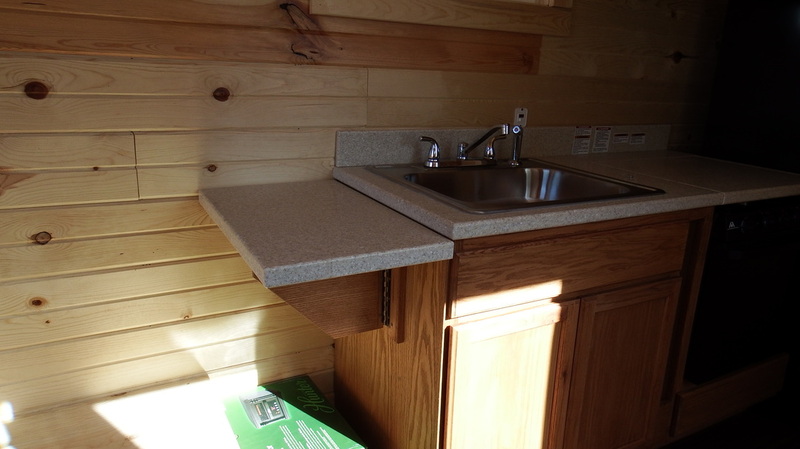 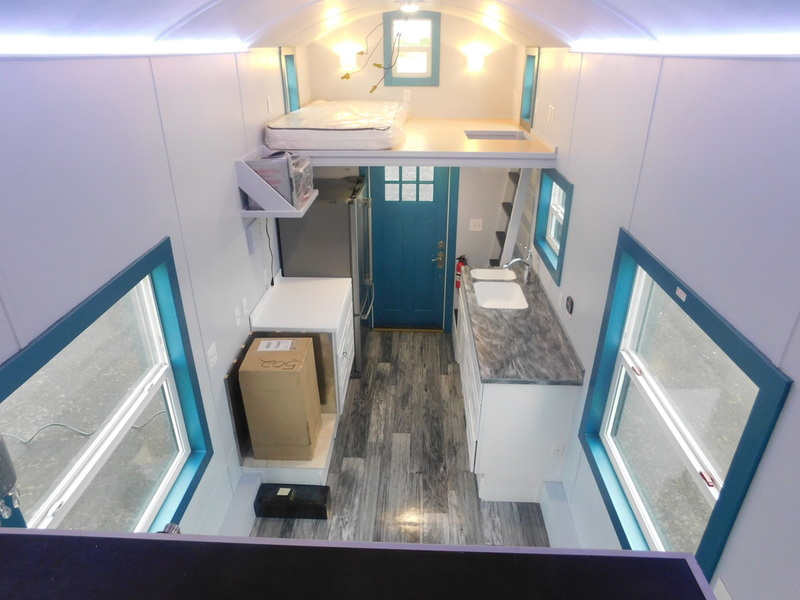 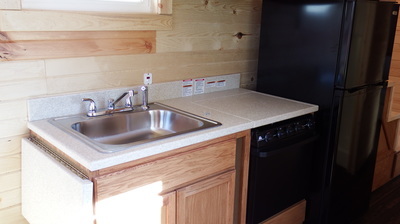 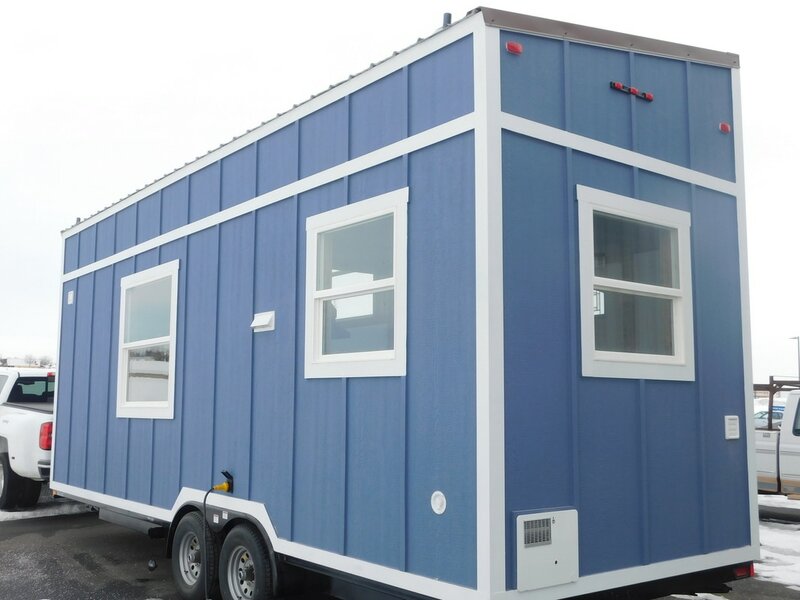 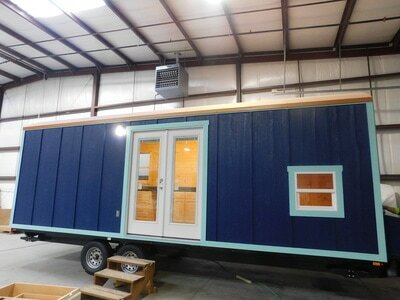 We sat down and talked to them and, after a little while of intense work, we all came up with th floor plan that worked the best and moved on to building the tiny house. It took us about 3 months to build it – beginning to end and we think we have achieved the look they were going for. What do you think? 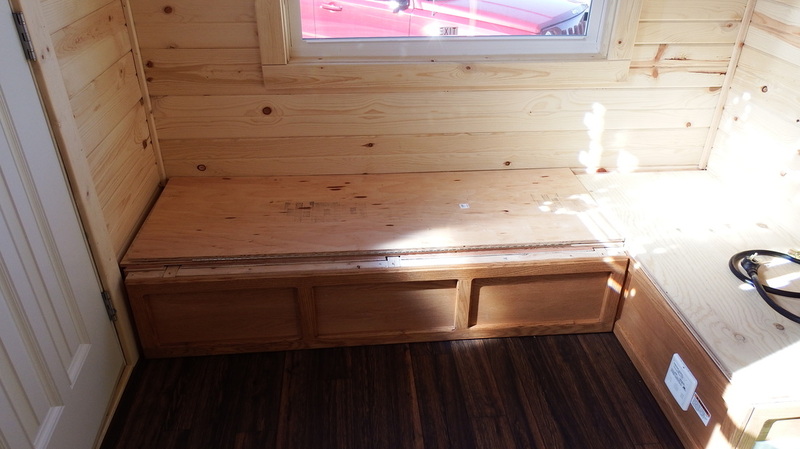 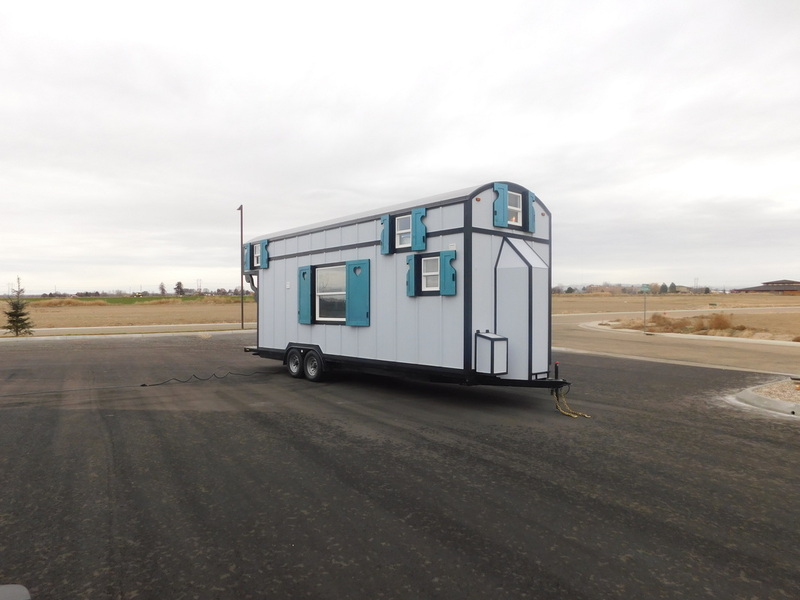 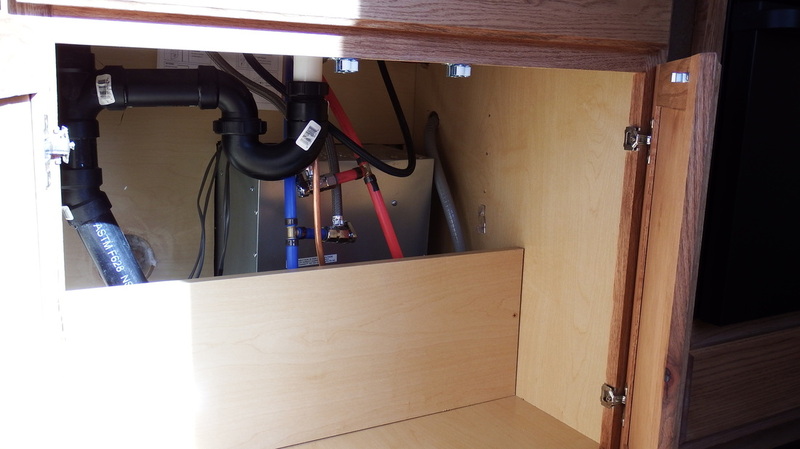 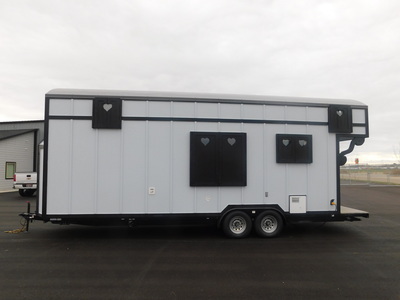 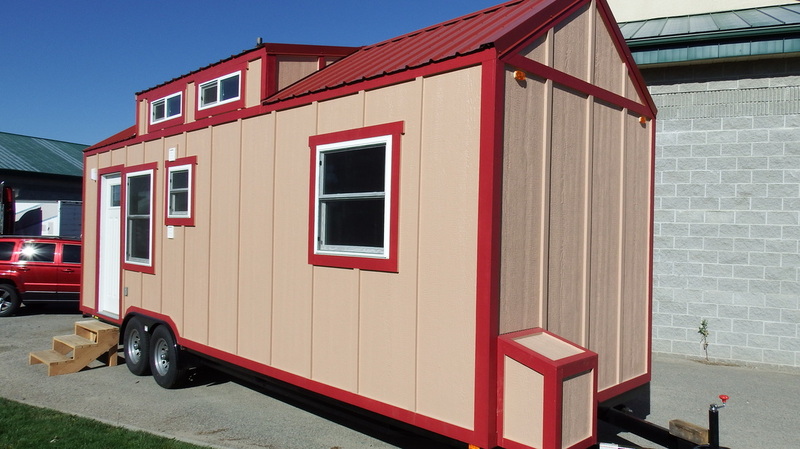 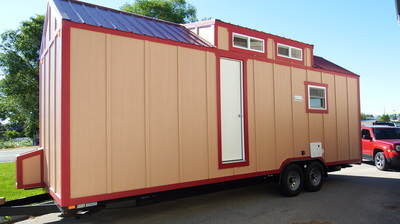 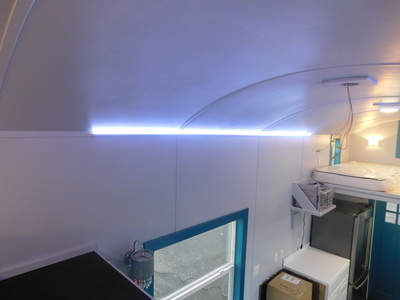 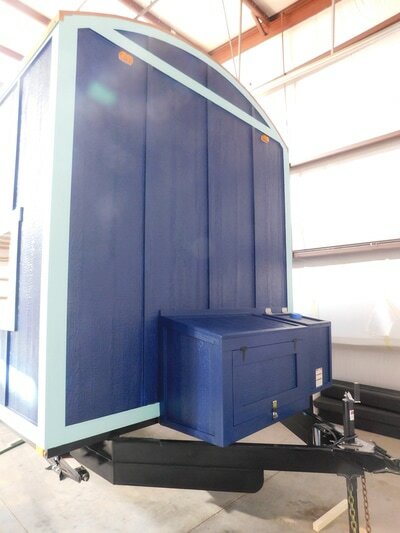 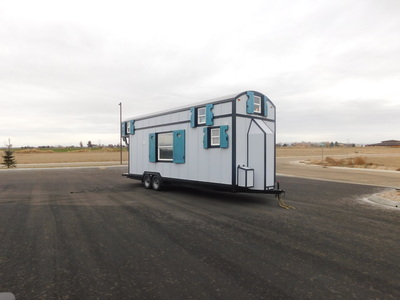 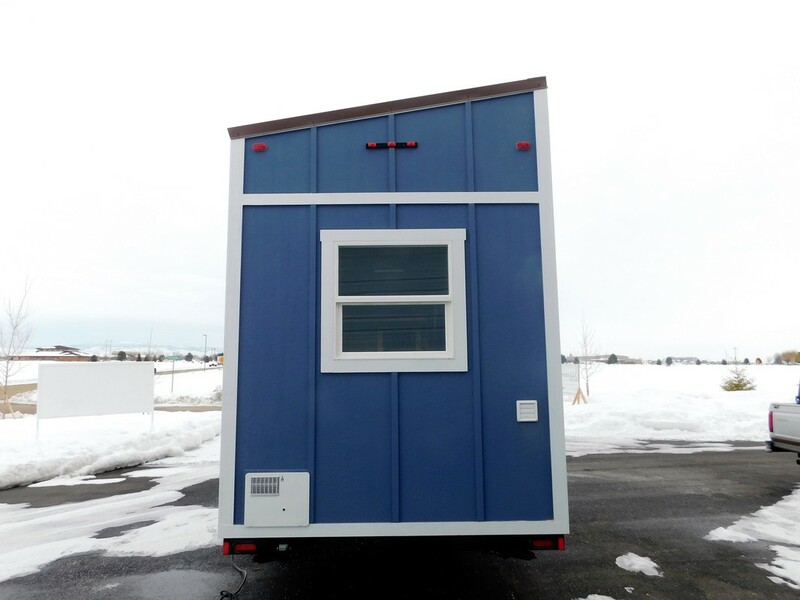 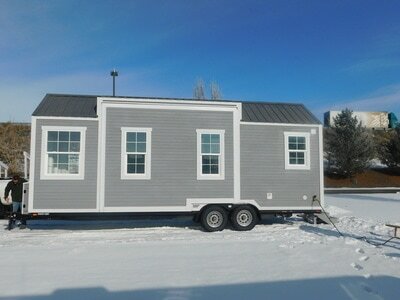 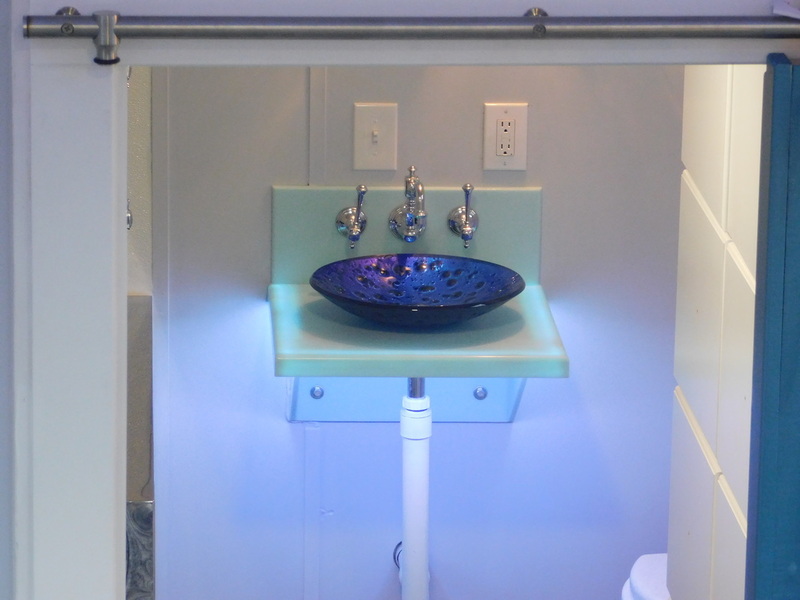 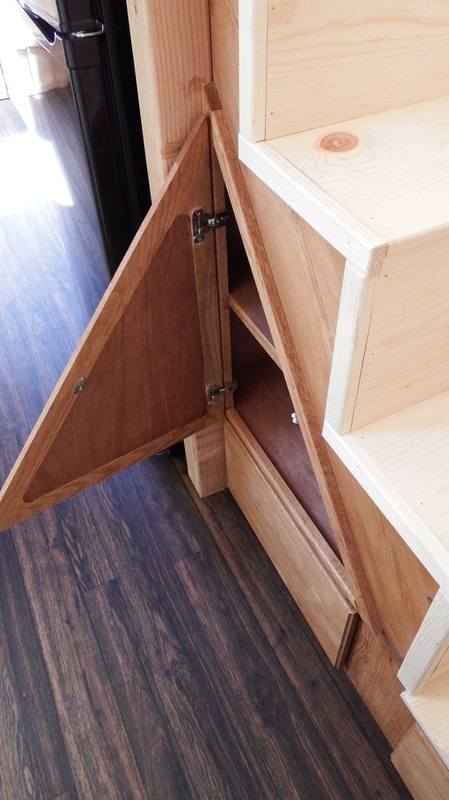 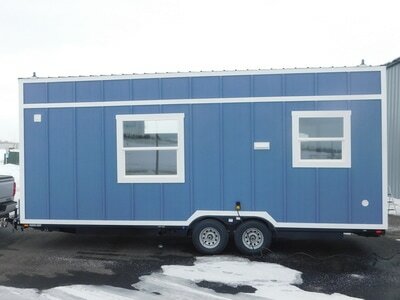 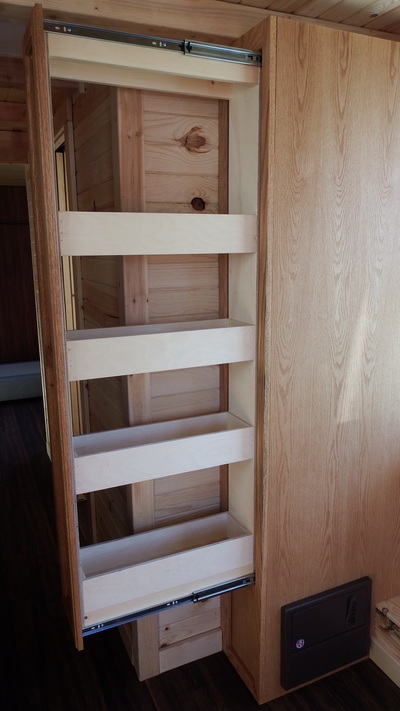 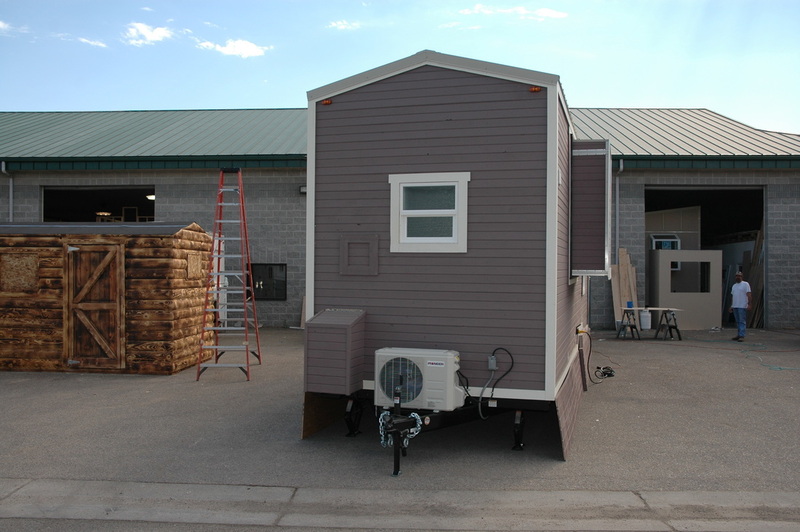 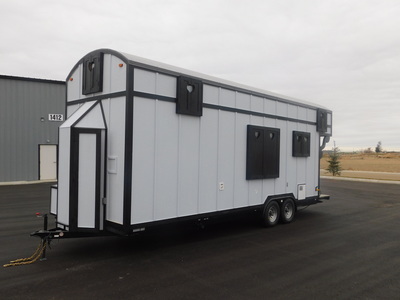 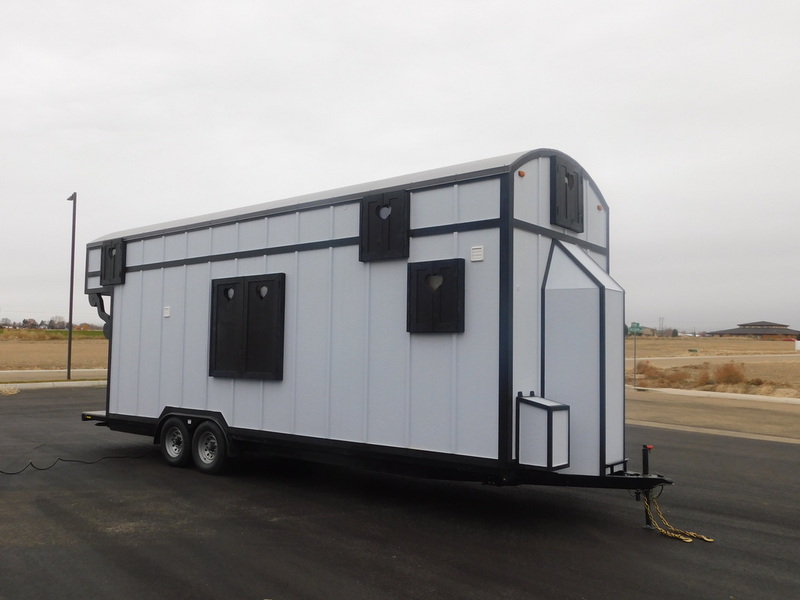 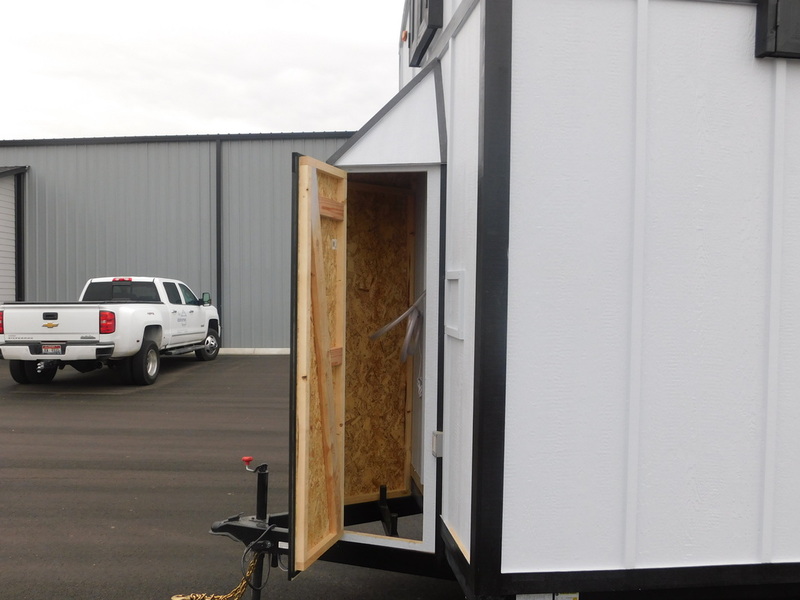 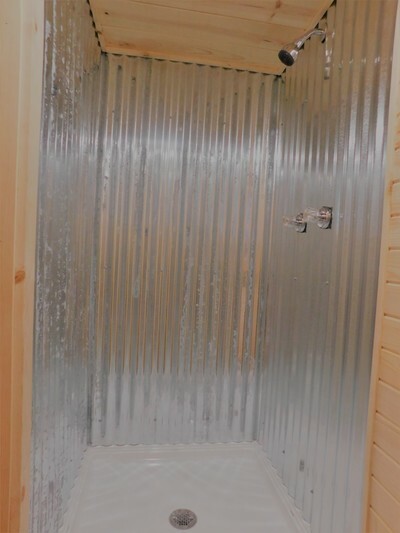 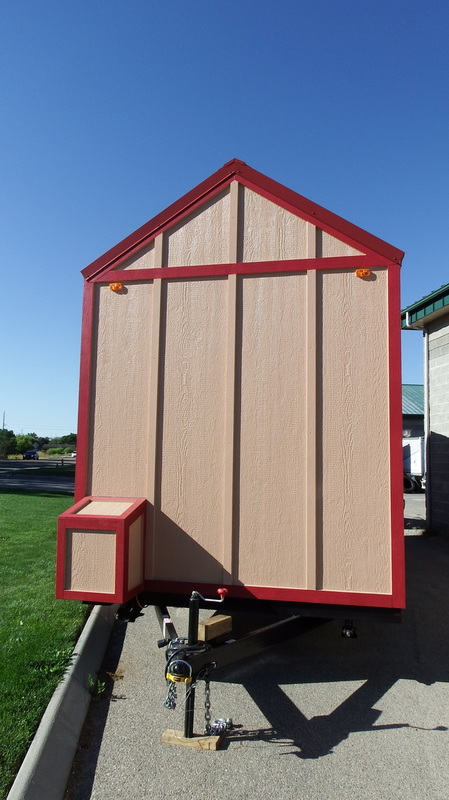 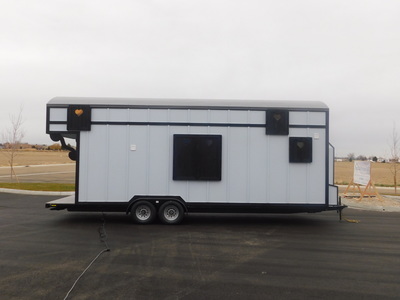 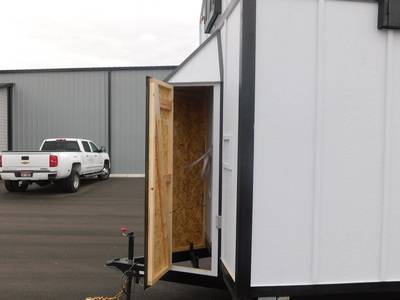 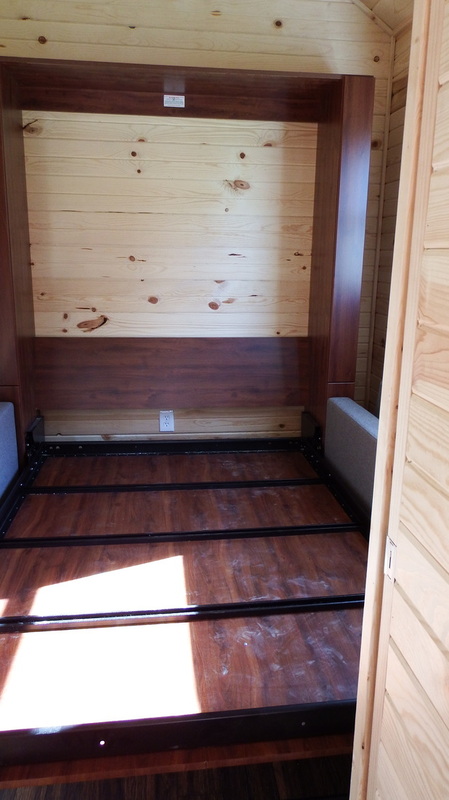 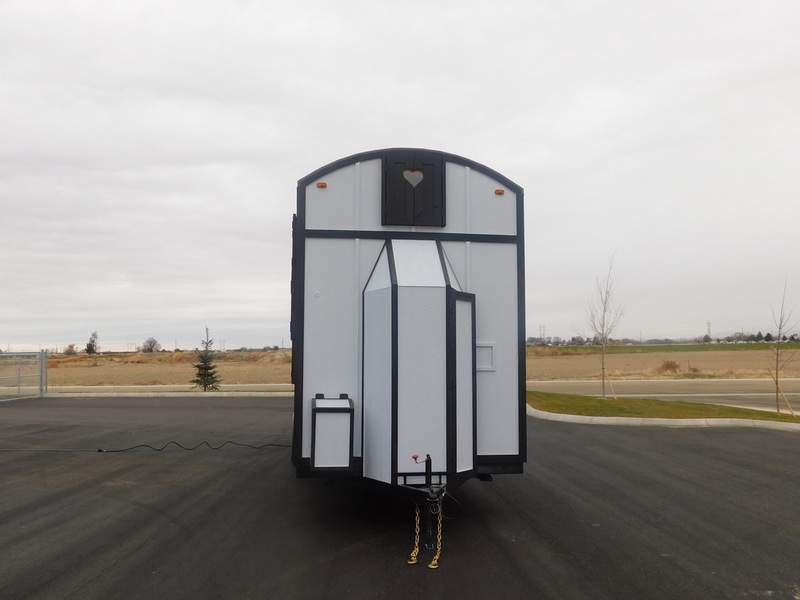 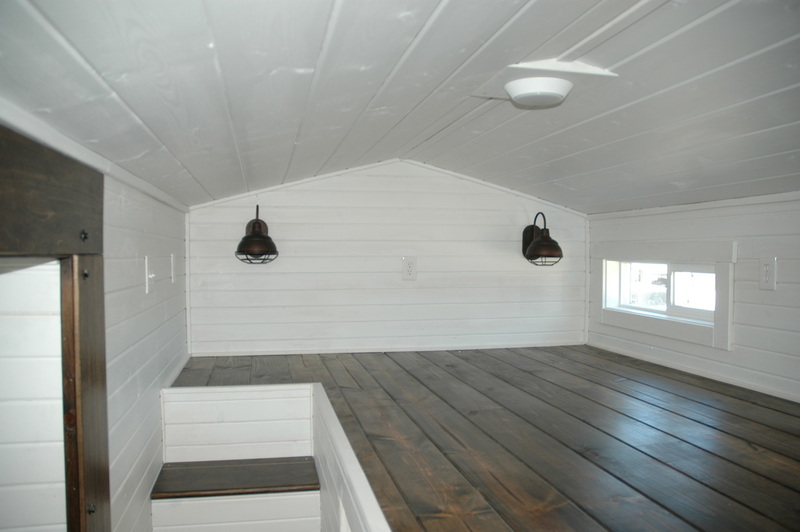 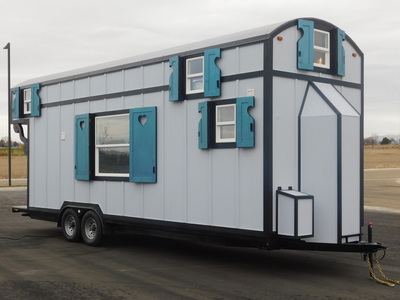 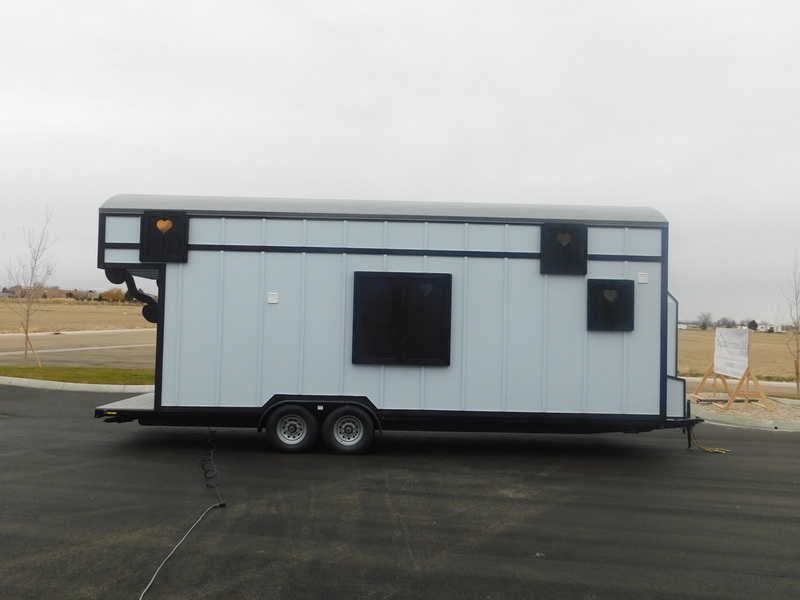 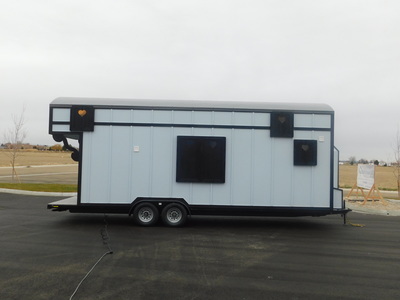 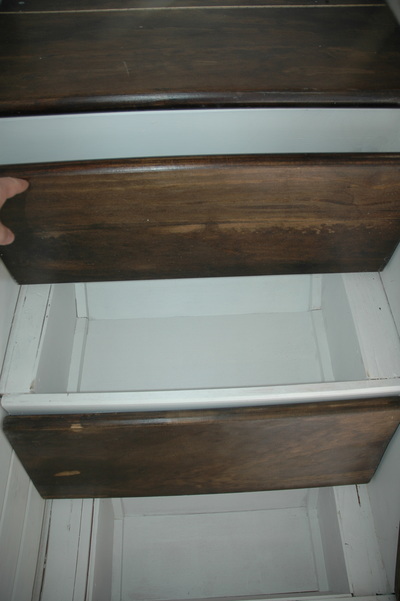 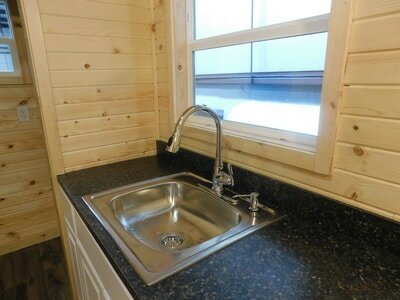 Custom Built Large outside storage over the tongue of the trailer. 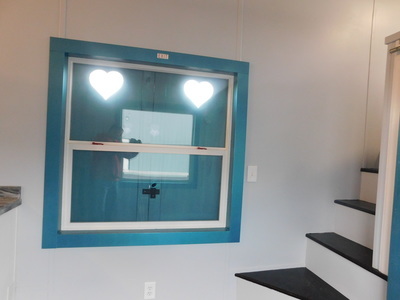 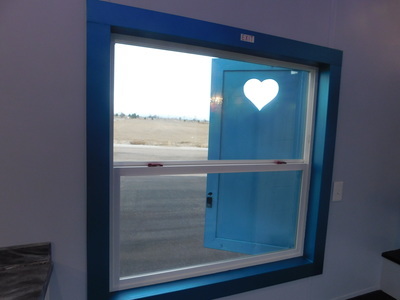 Custom built window shutters with heart cut outs on all windows. 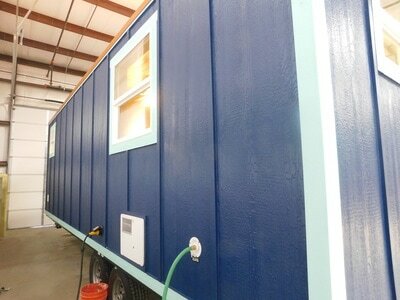 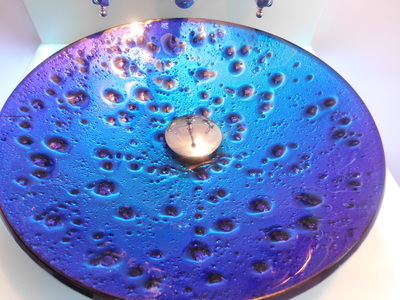 Black on the outside and metallic blue interior. 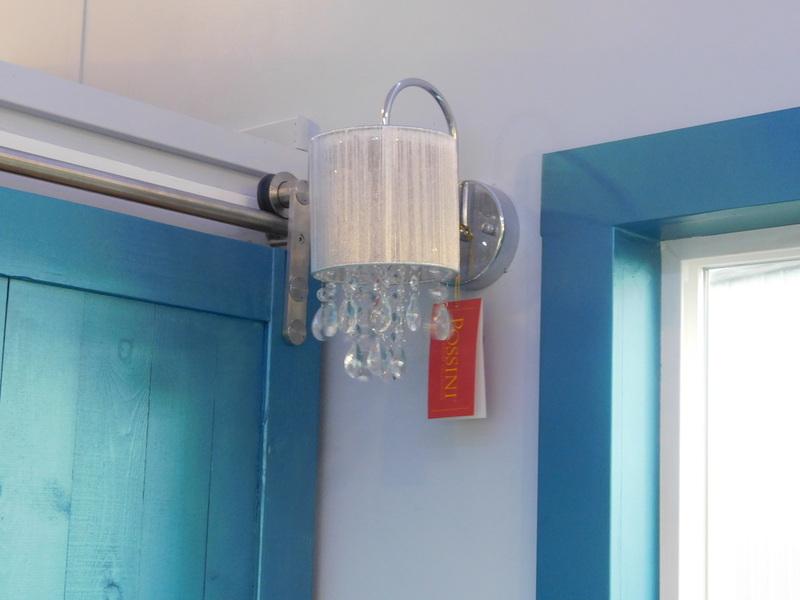 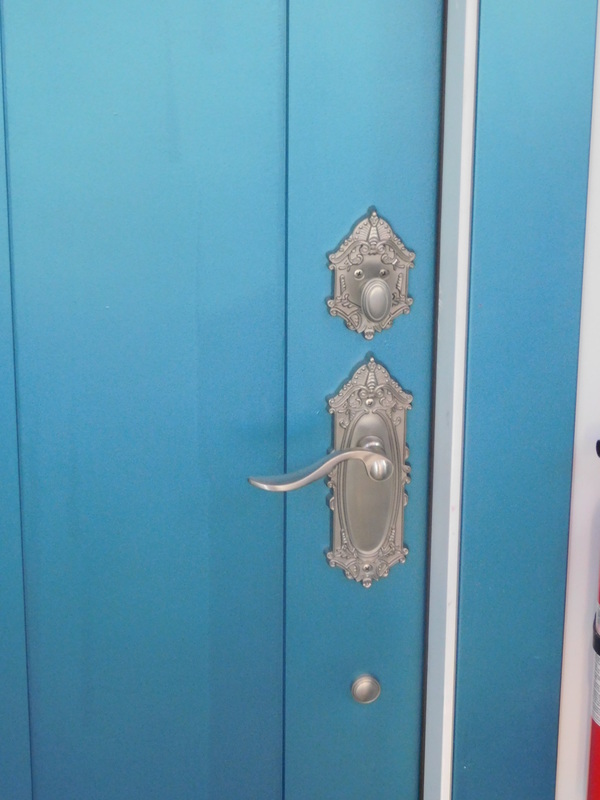 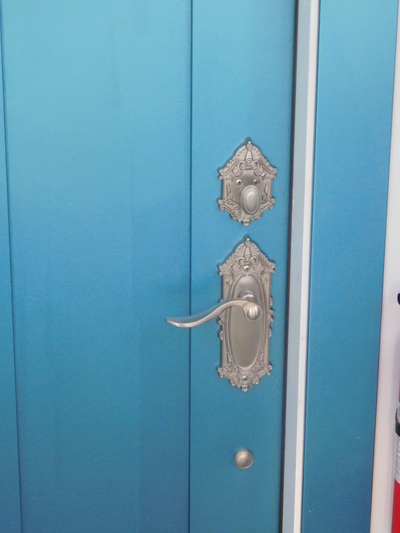 Outswing door with a beautiful Grande Victorian door knob. 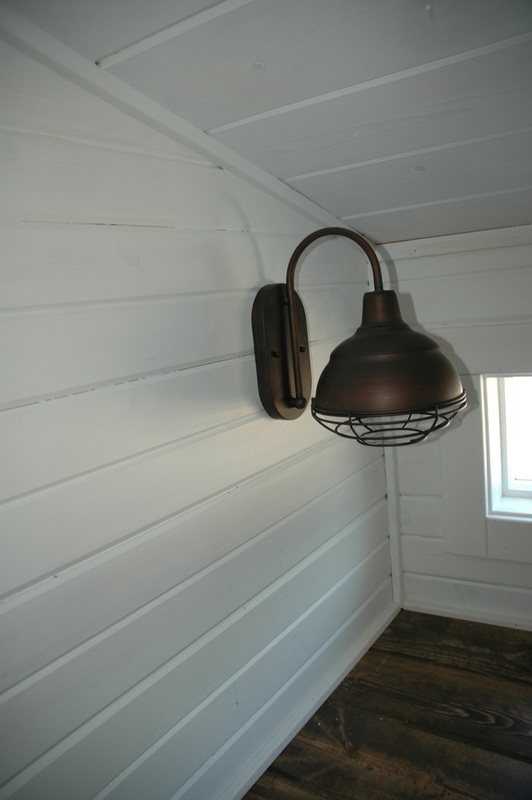 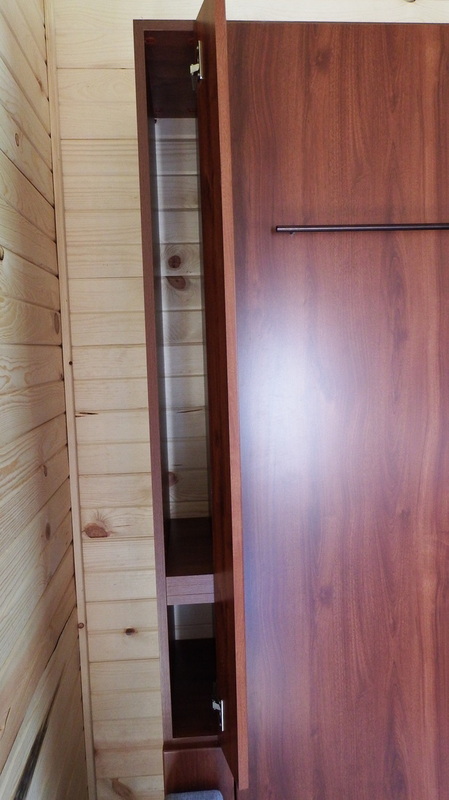 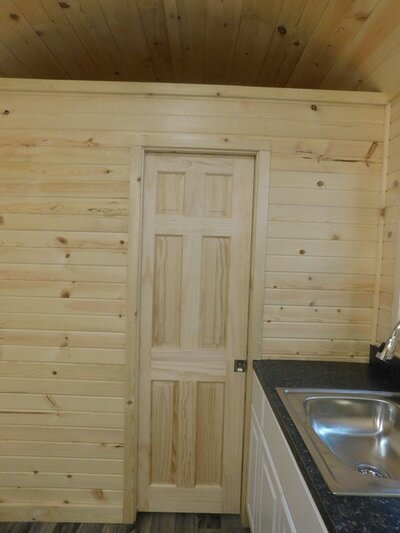 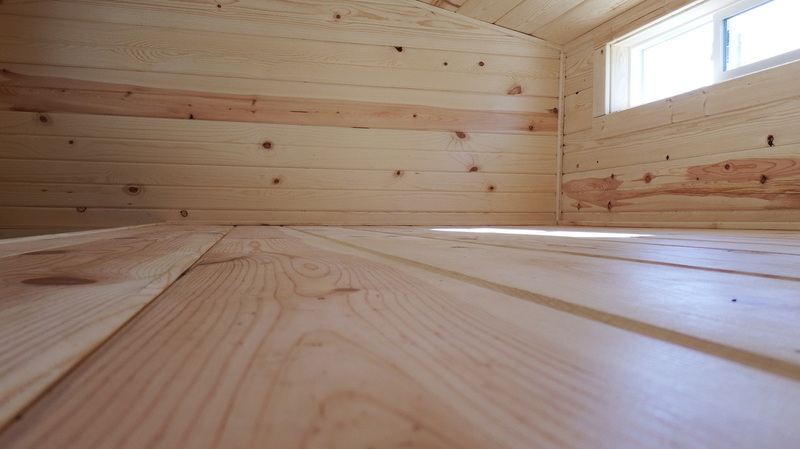 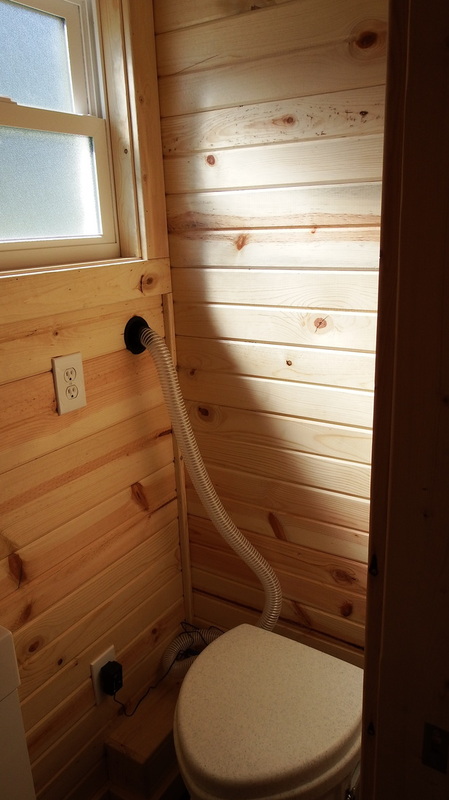 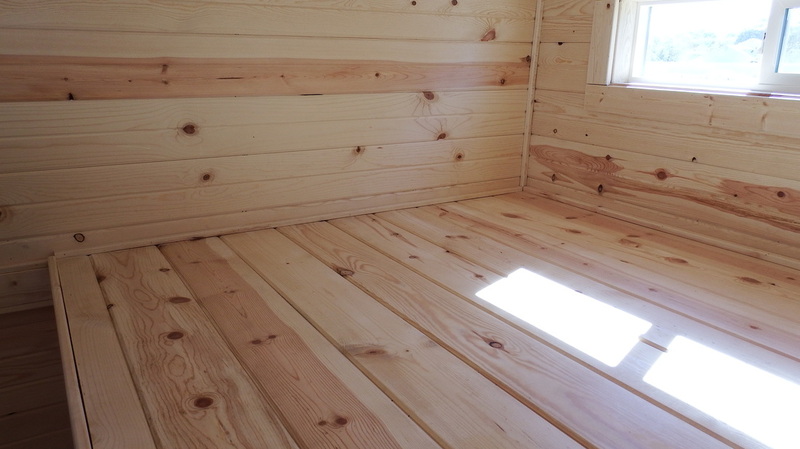 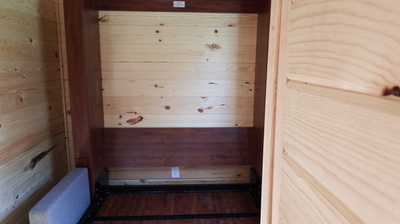 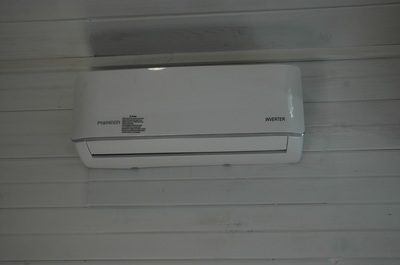 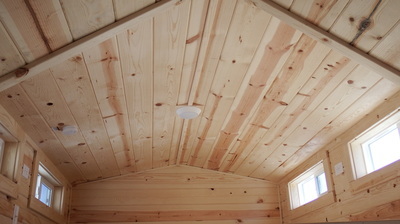 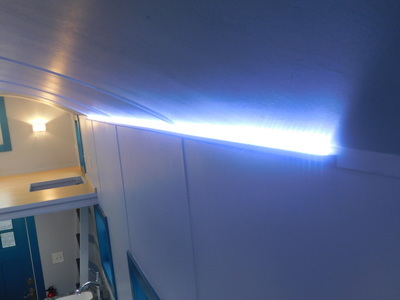 All the interior wall is paintable plywood which offers the smooth inside wall interior. 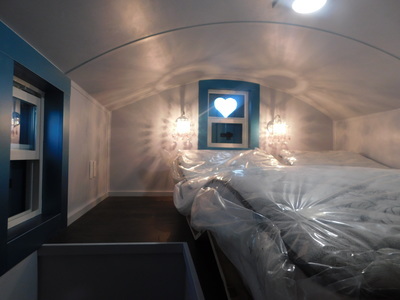 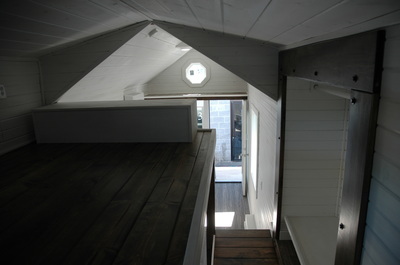 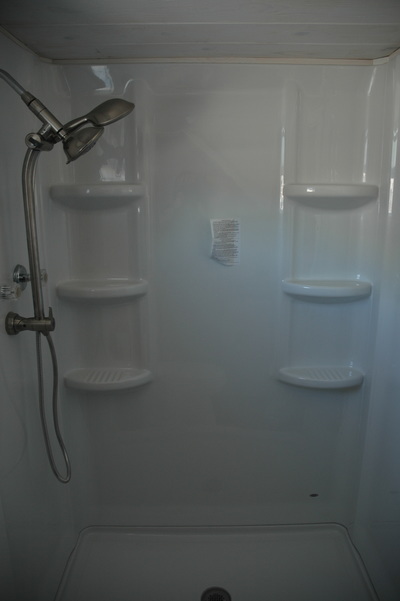 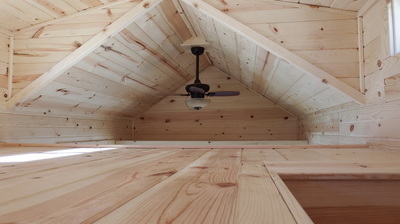 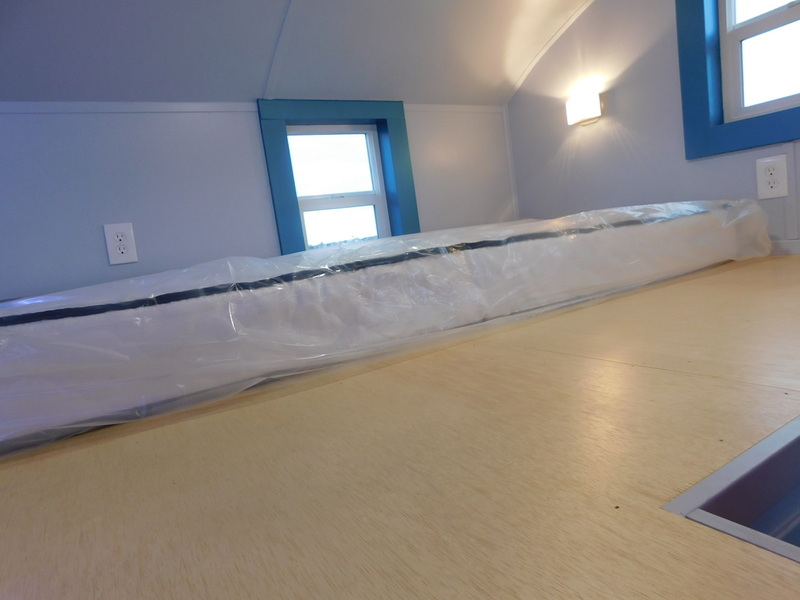 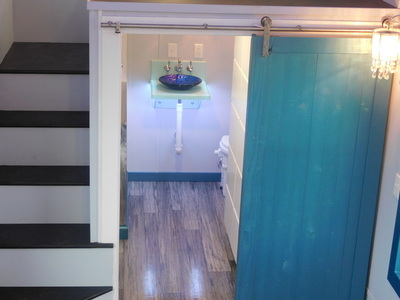 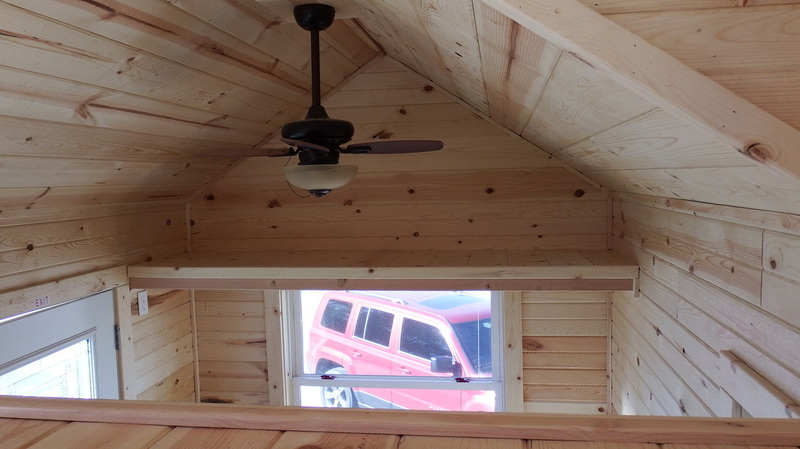 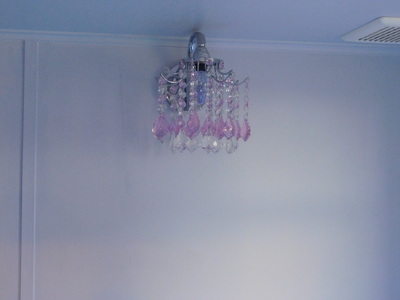 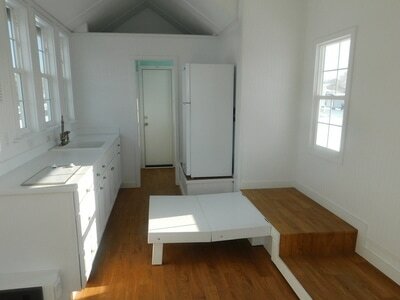 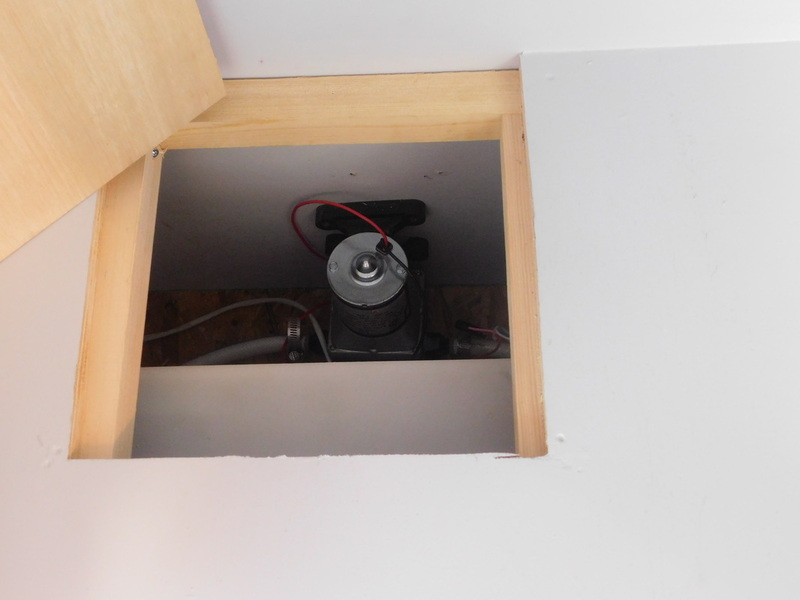 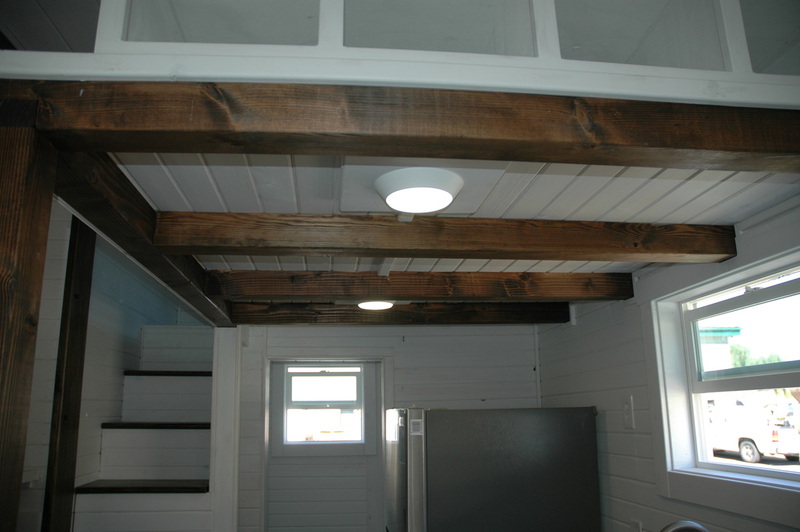 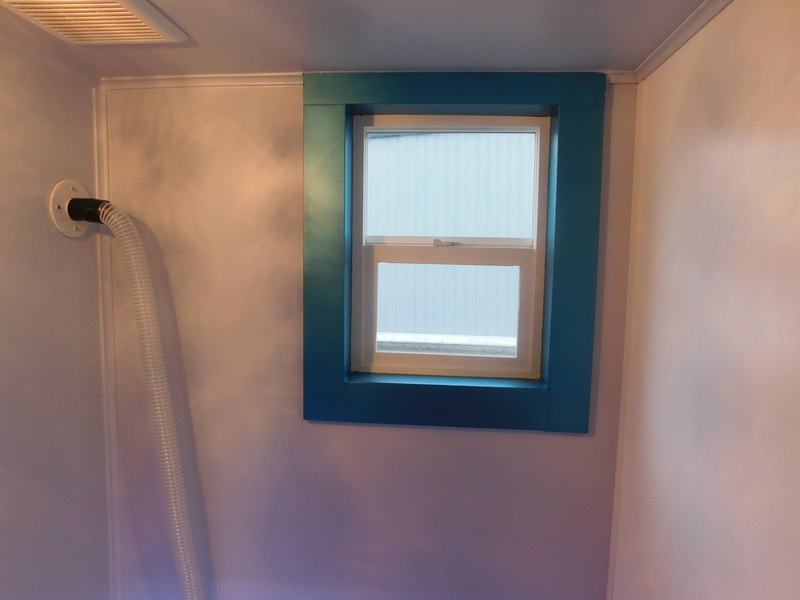 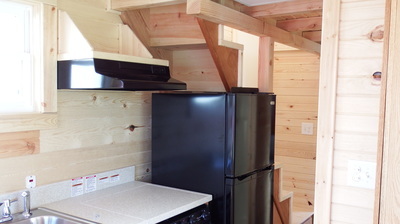 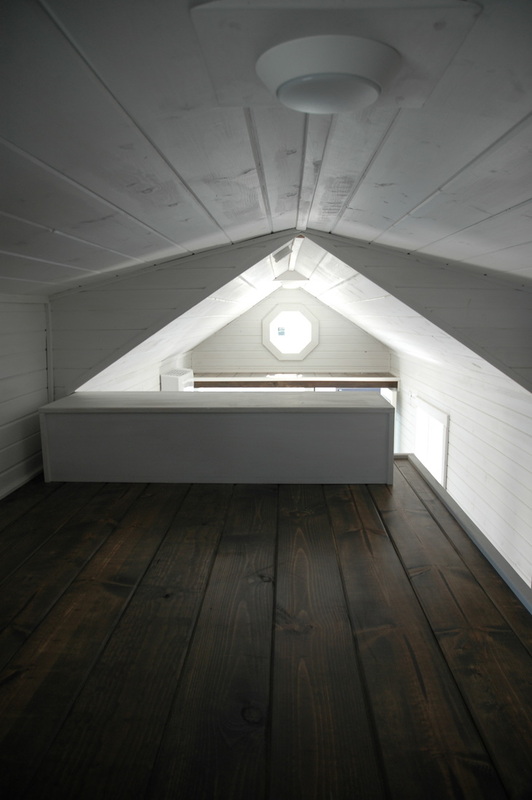 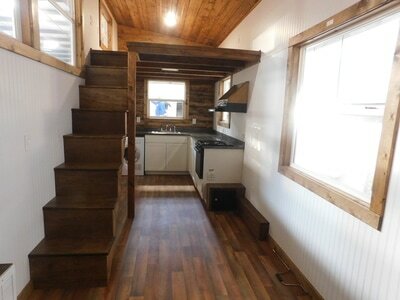 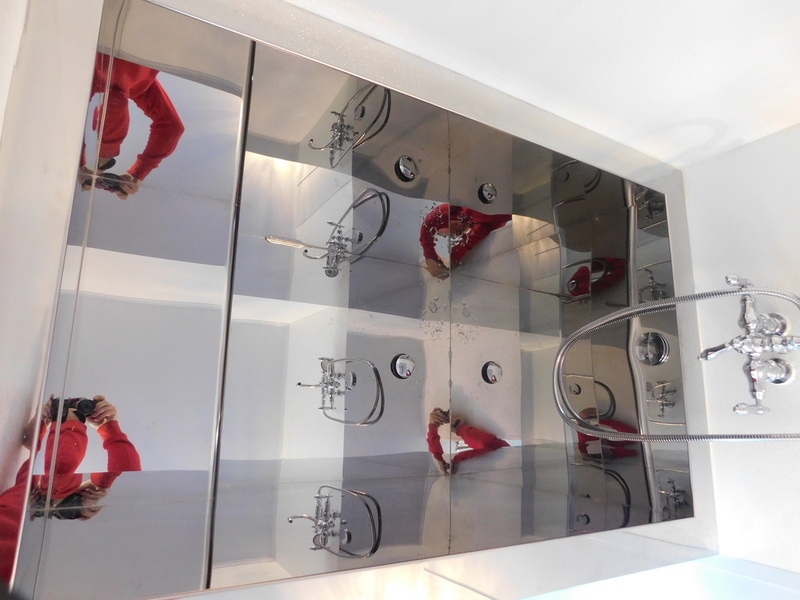 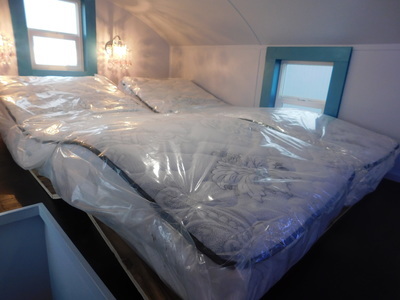 Second loft is the master loft – 9’ long – located over the bathroom. 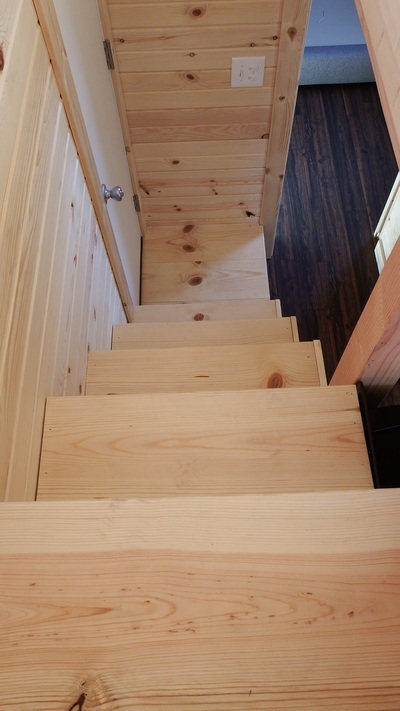 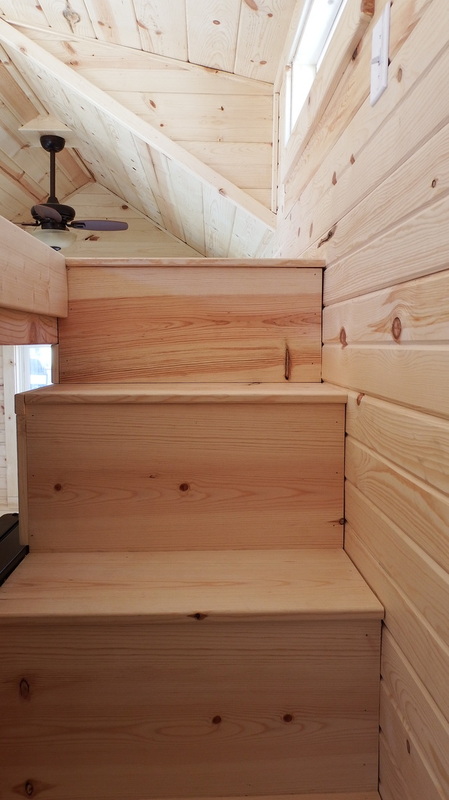 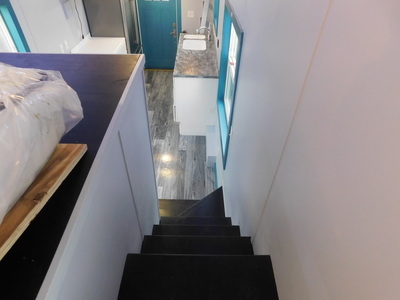 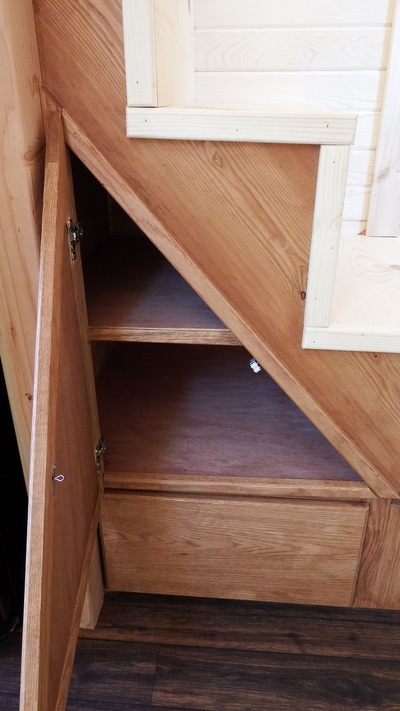 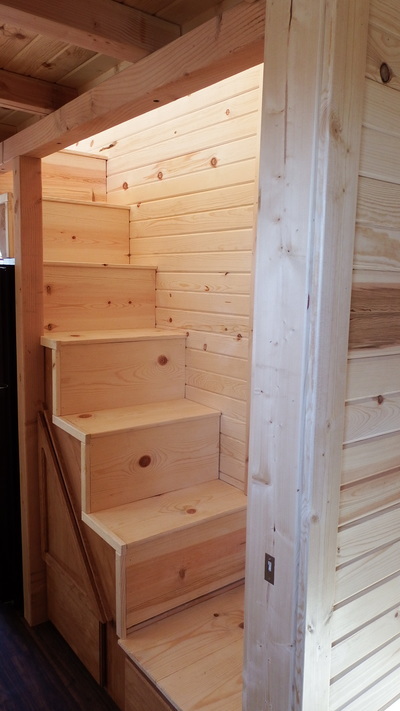 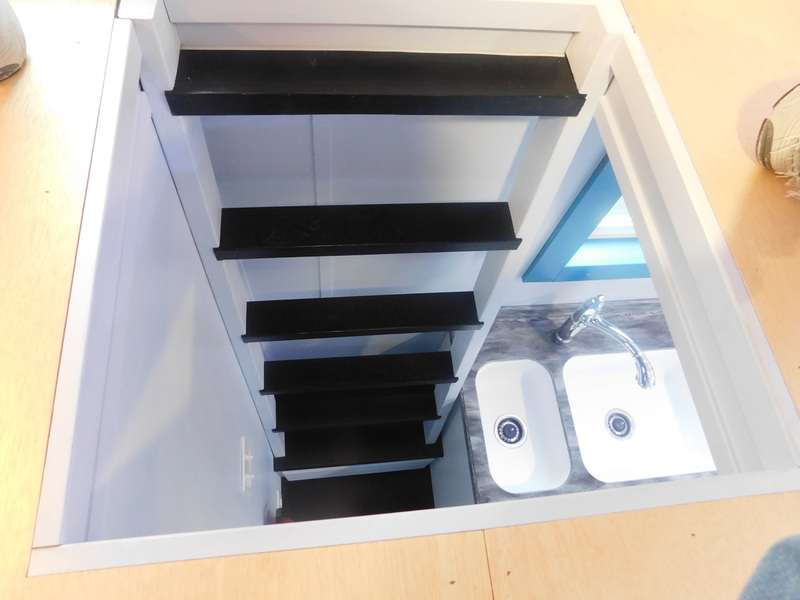 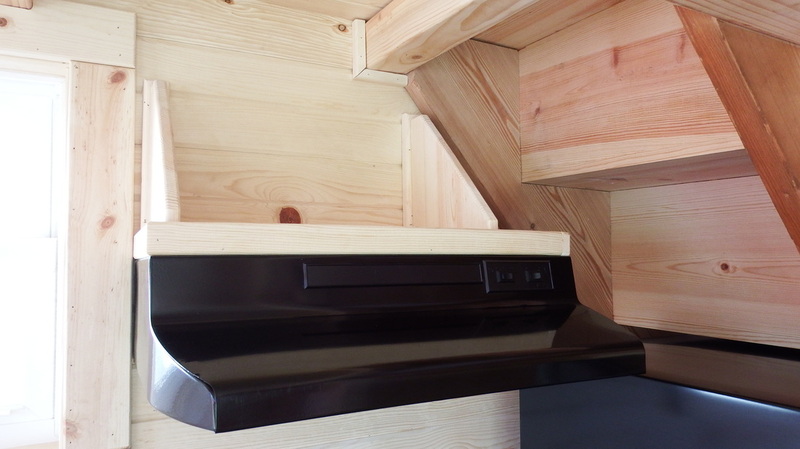 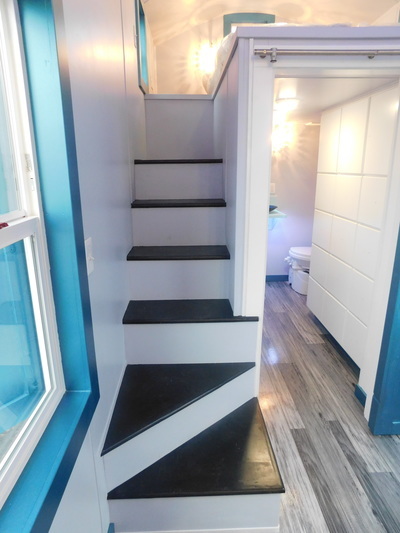 Custom built L shape recessed stairs to the loft. 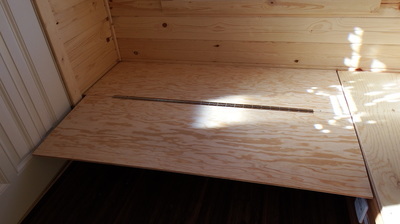 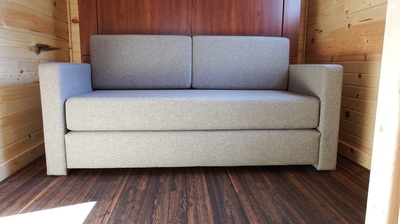 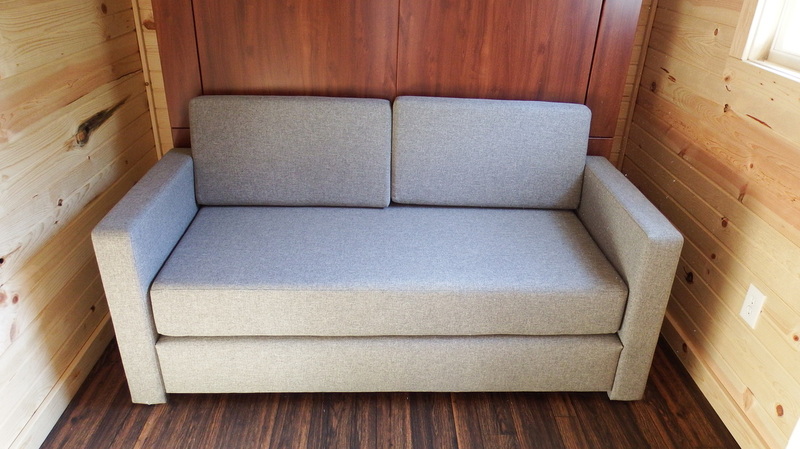 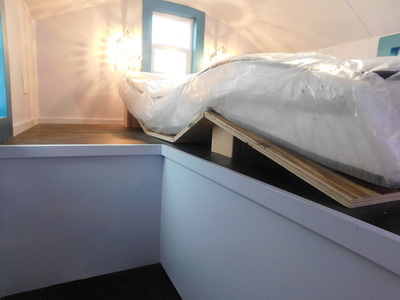 Split queen bed with individual adjustments for custom articulation for zero gravity position. 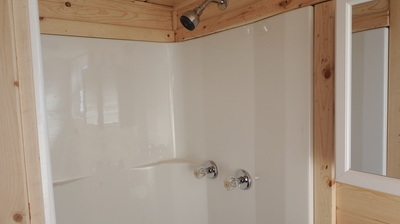 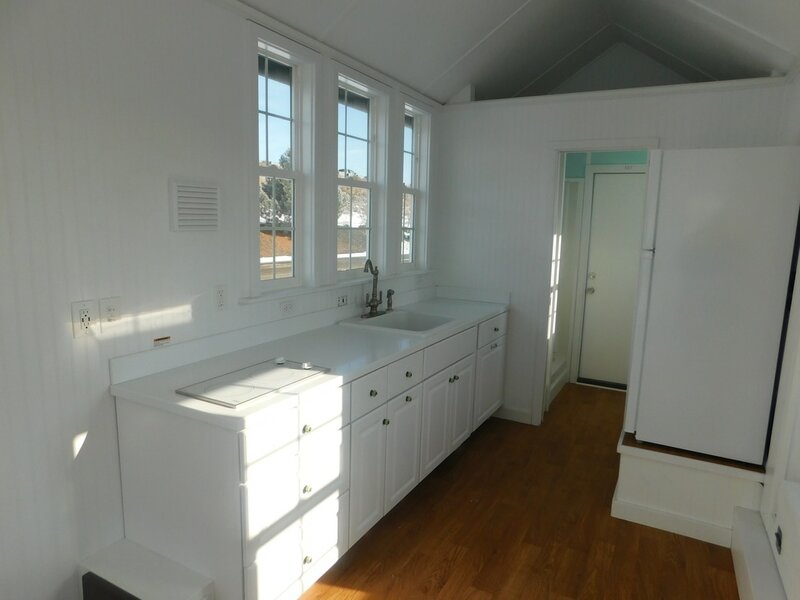 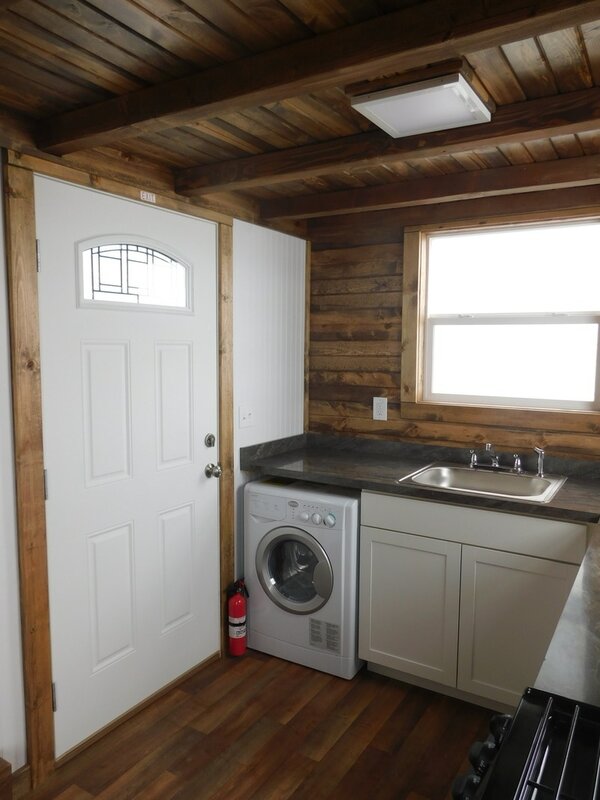 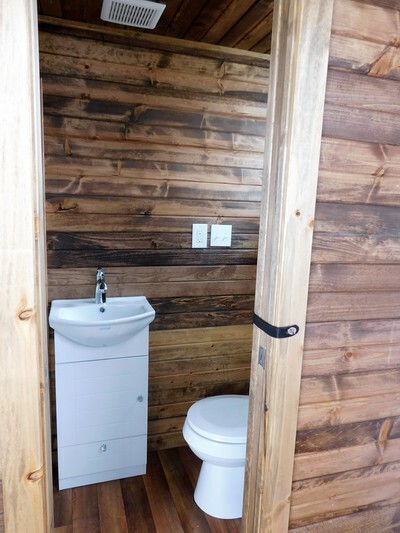 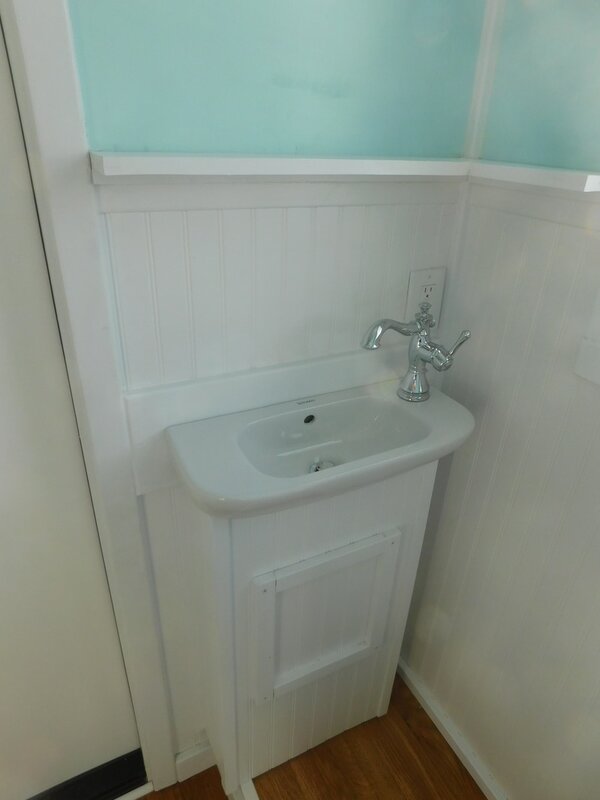 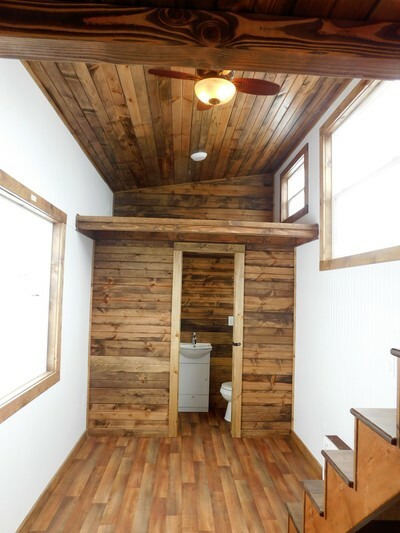 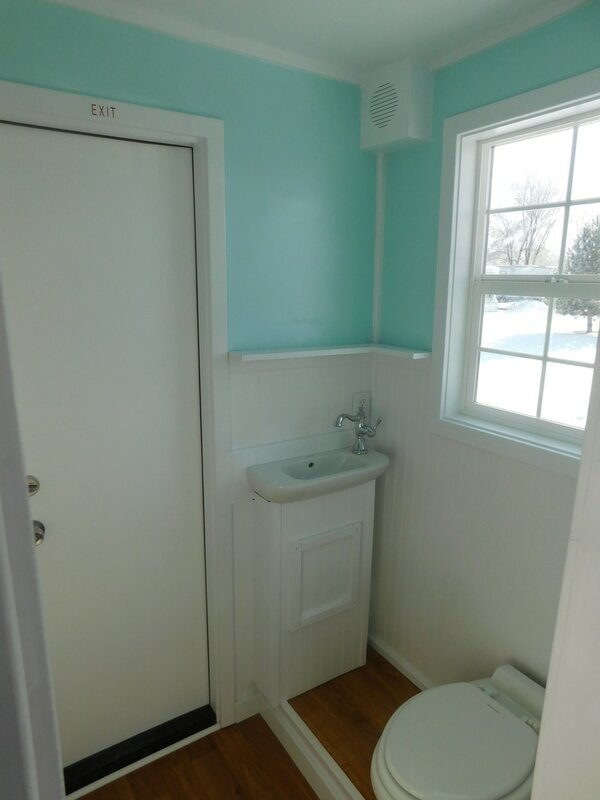 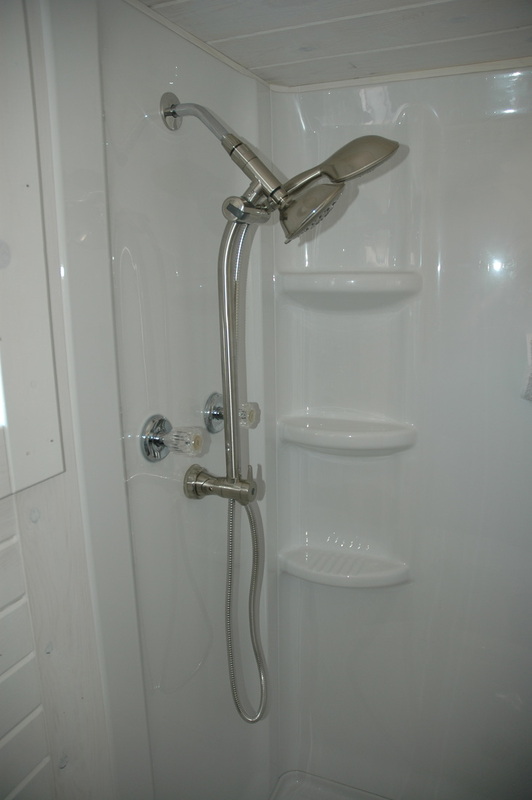 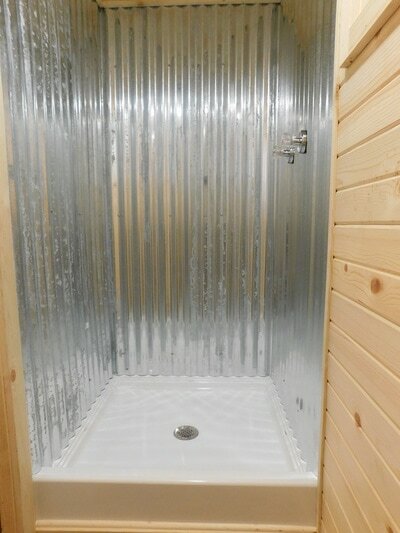 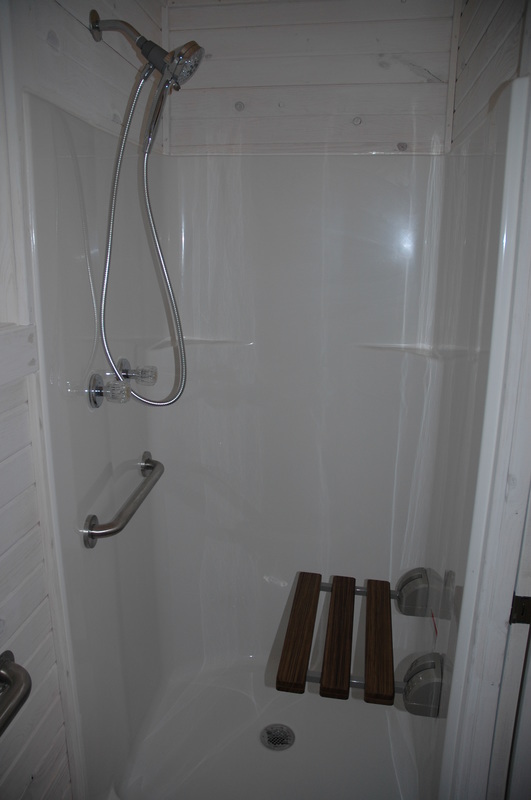 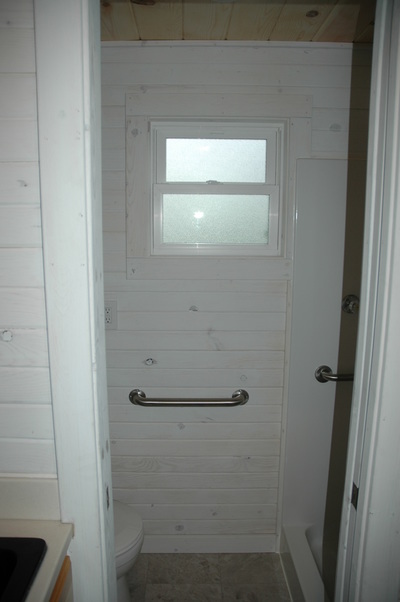 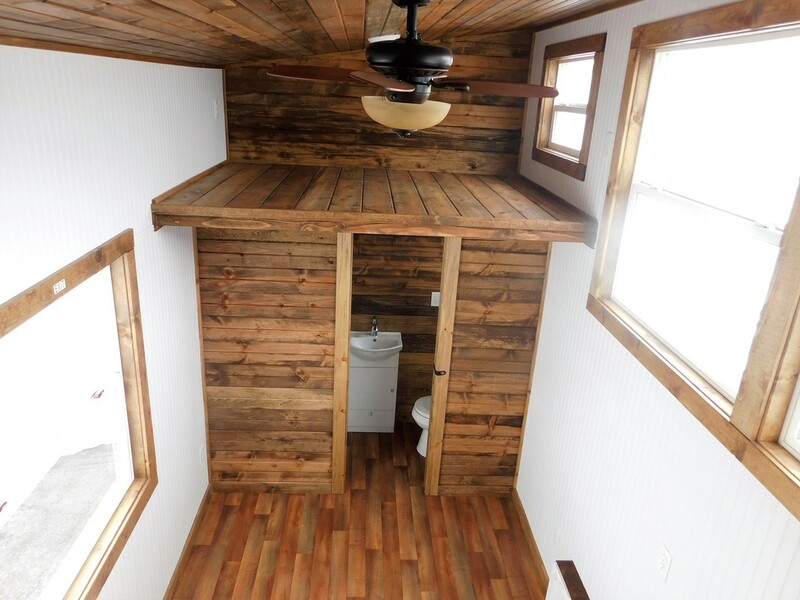 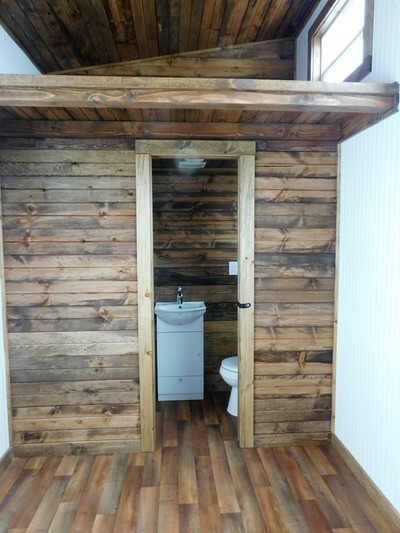 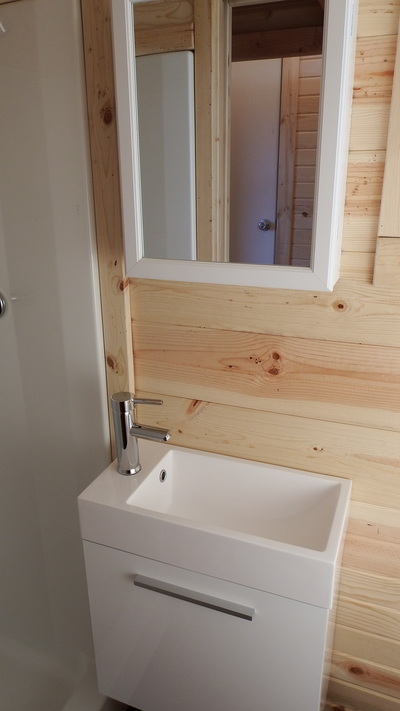 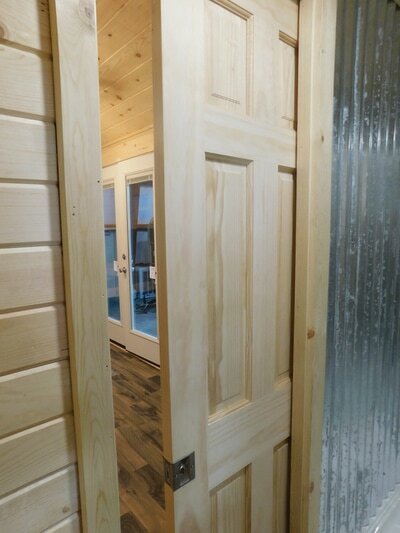 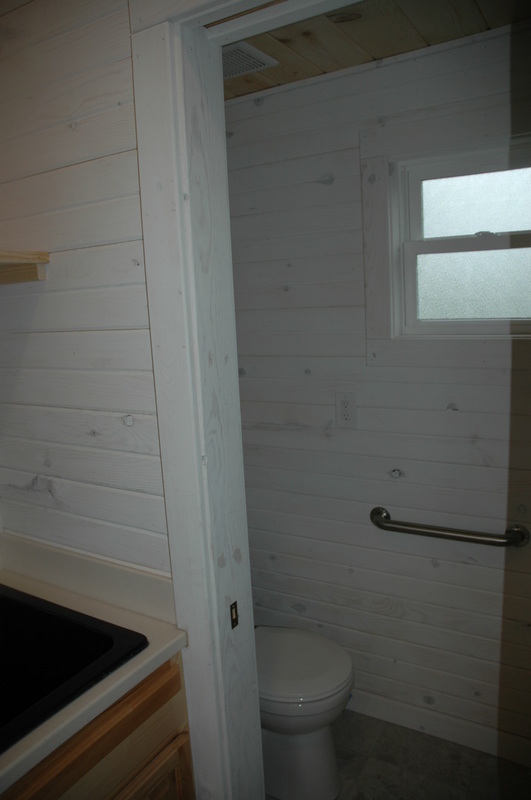 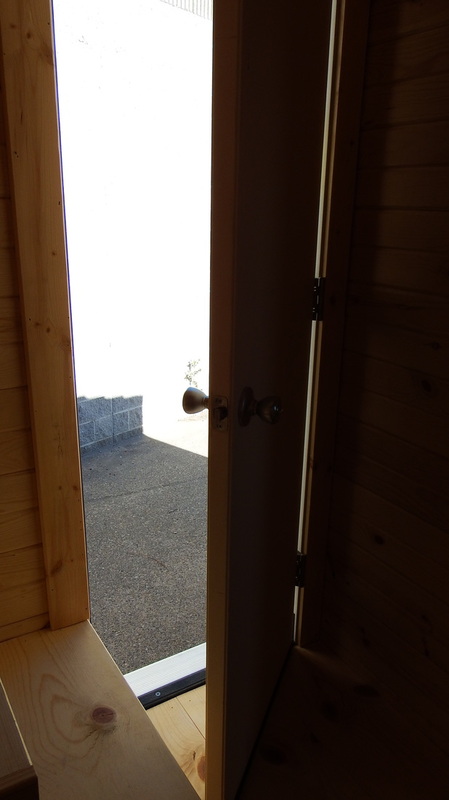 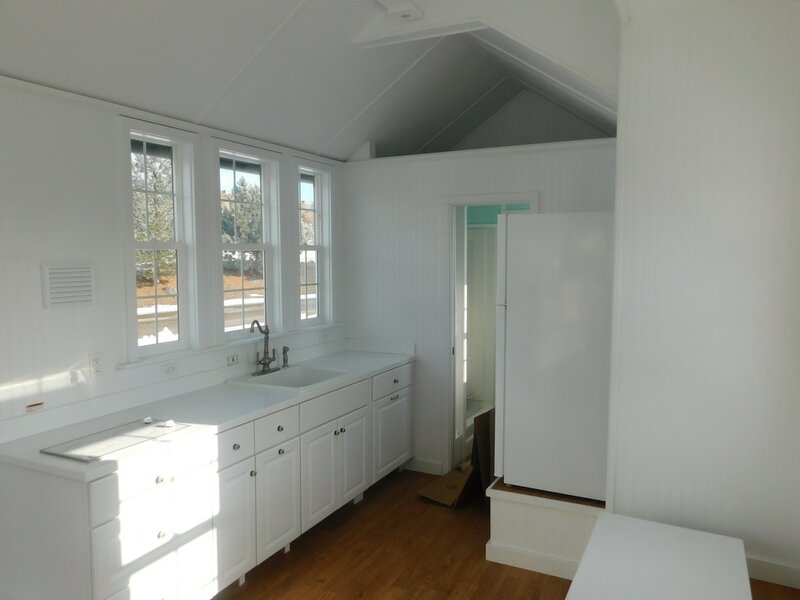 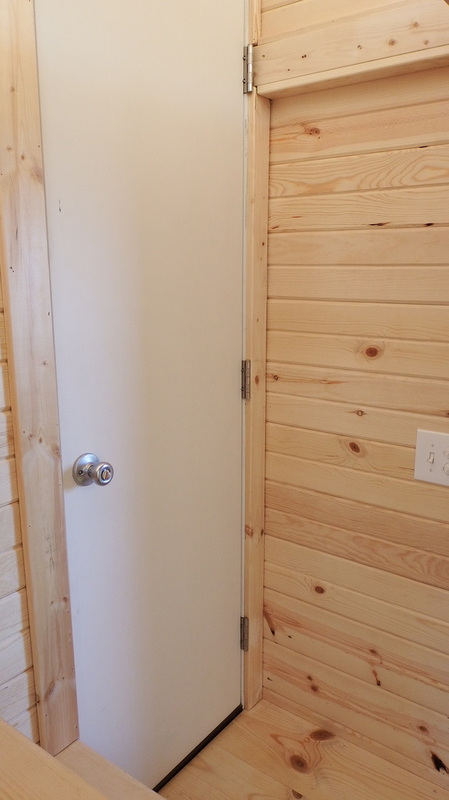 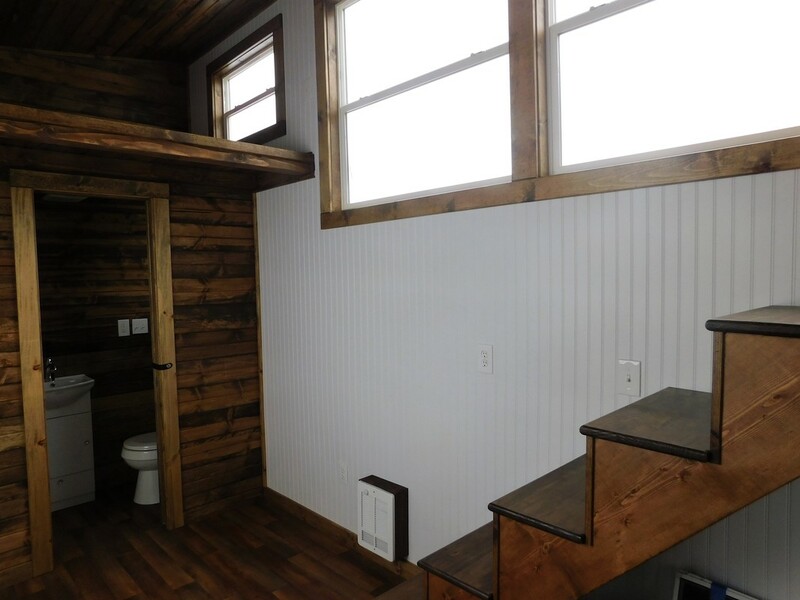 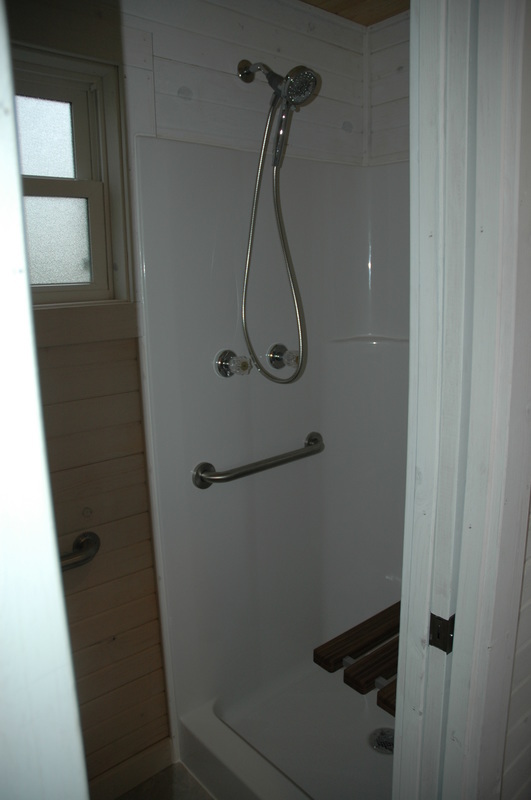 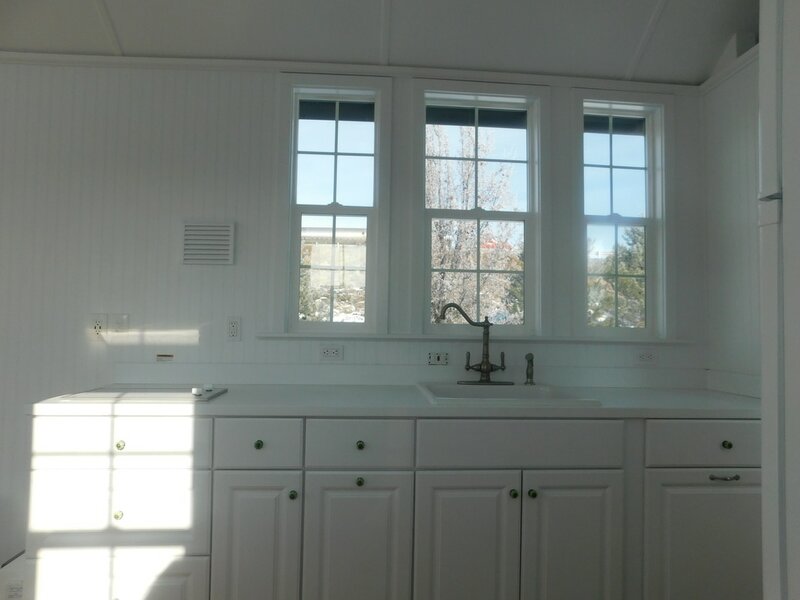 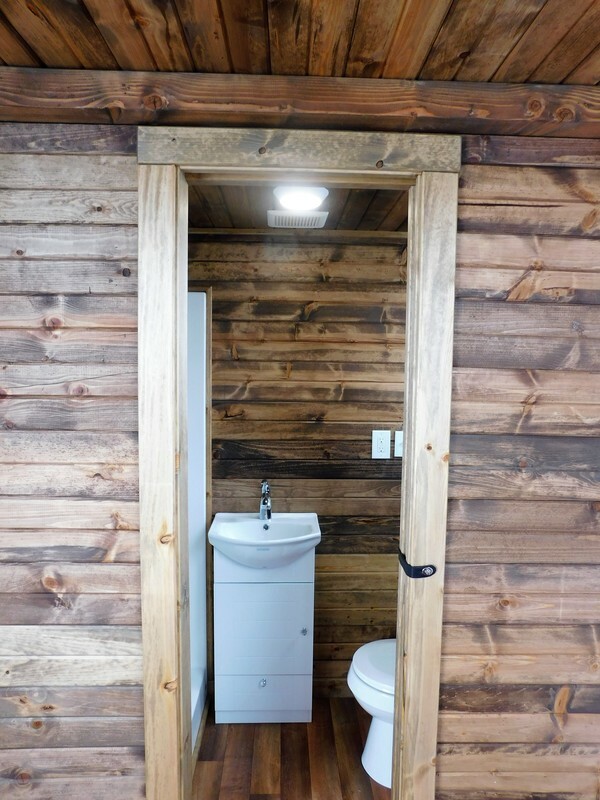 9’ front bathroom with sliding barn style door. 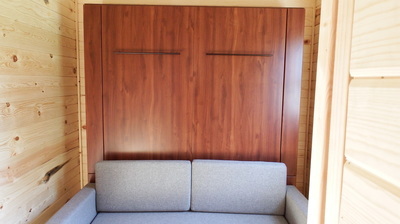 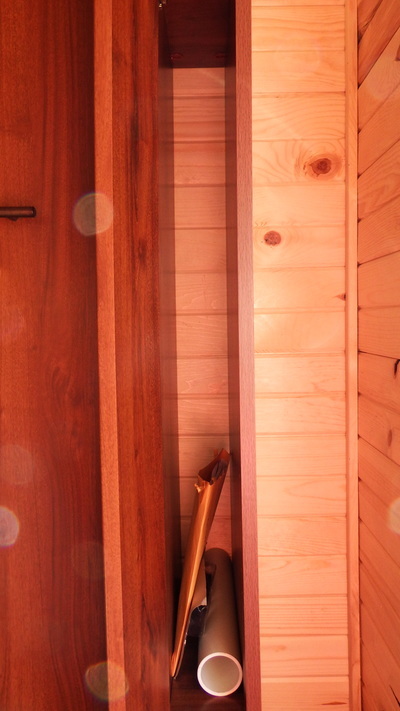 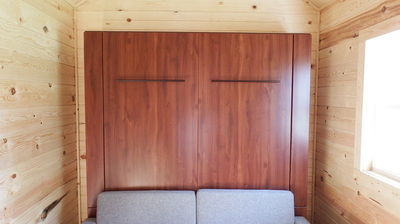 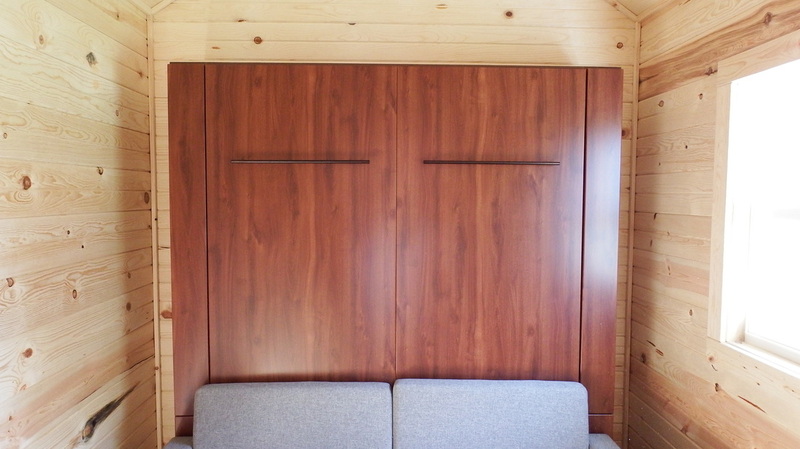 1’ wide bookshelf with opening to the Livingroom (only visible when door closed). 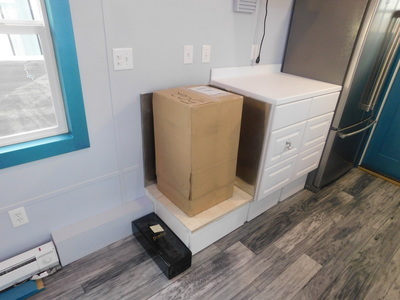 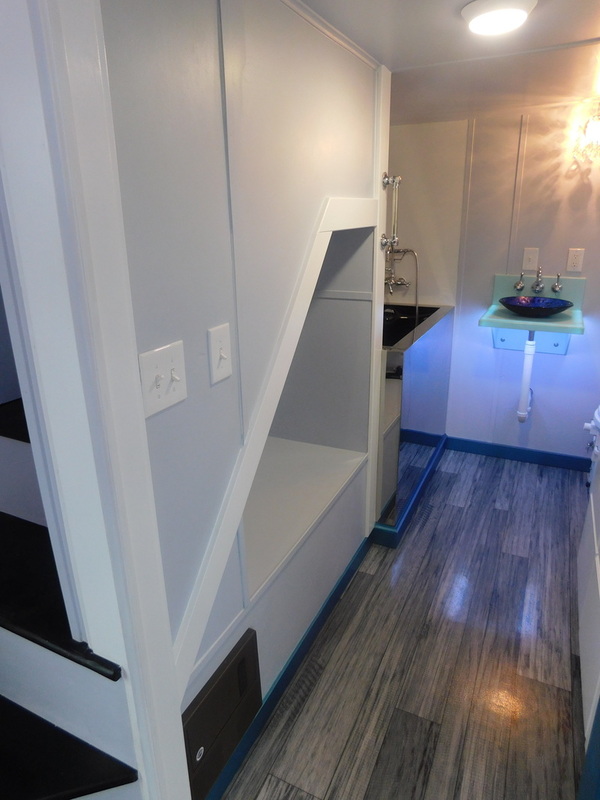 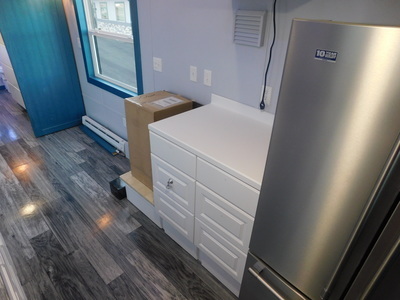 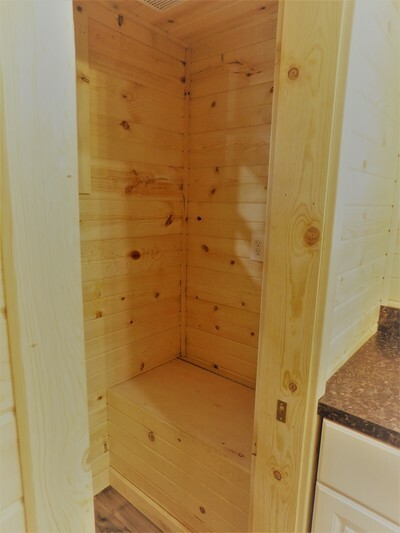 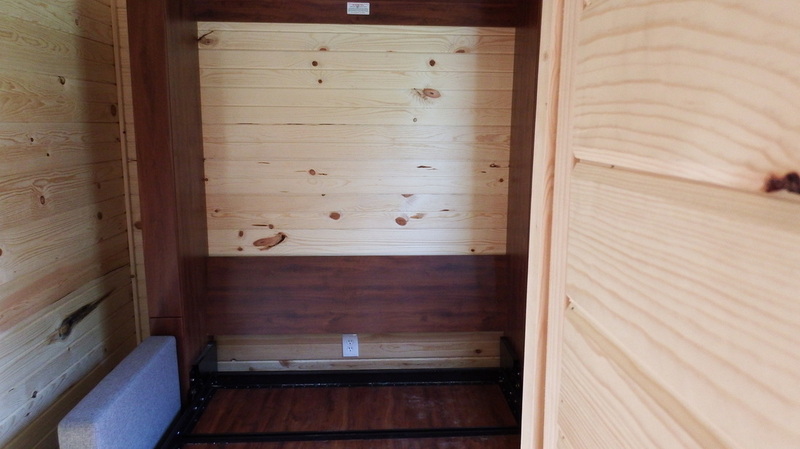 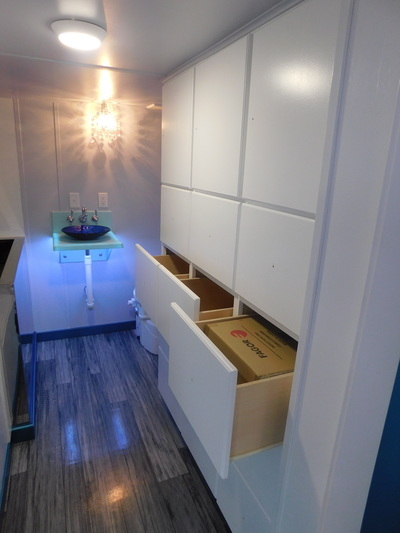 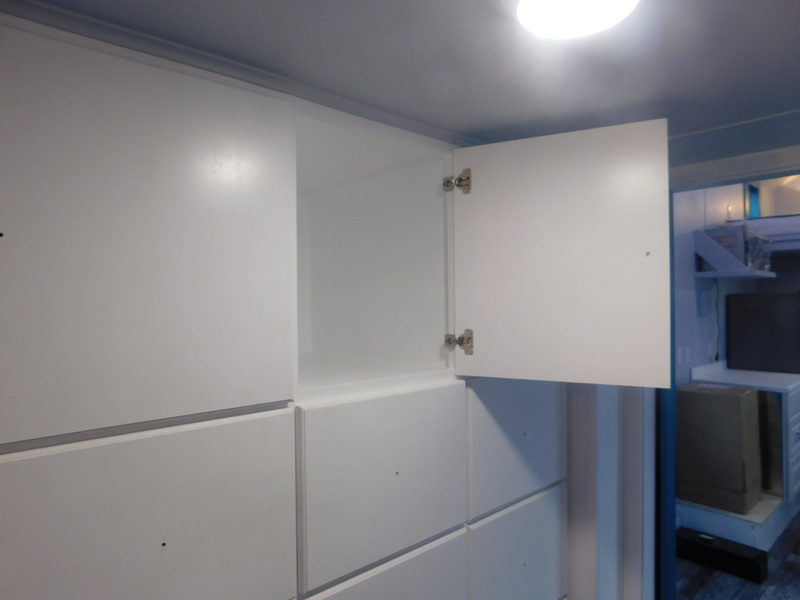 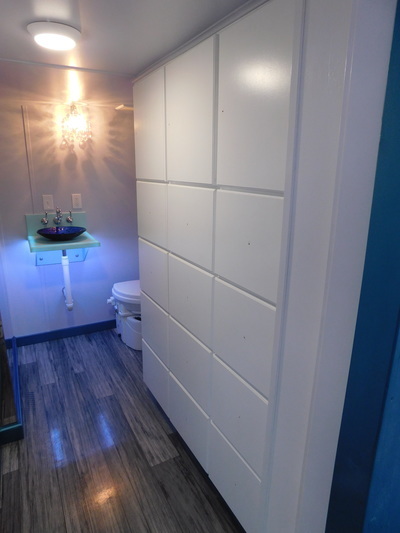 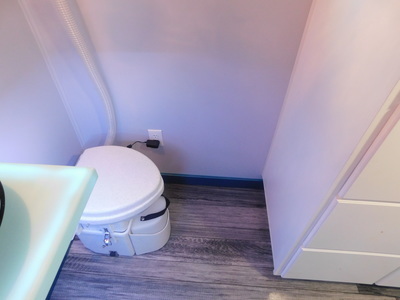 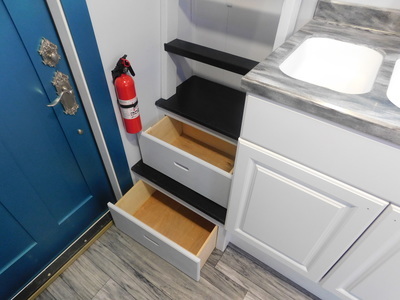 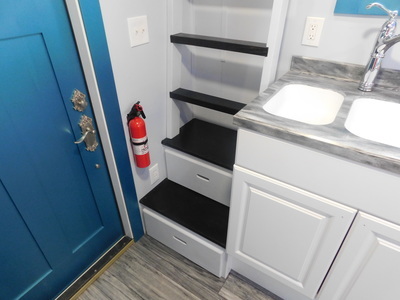 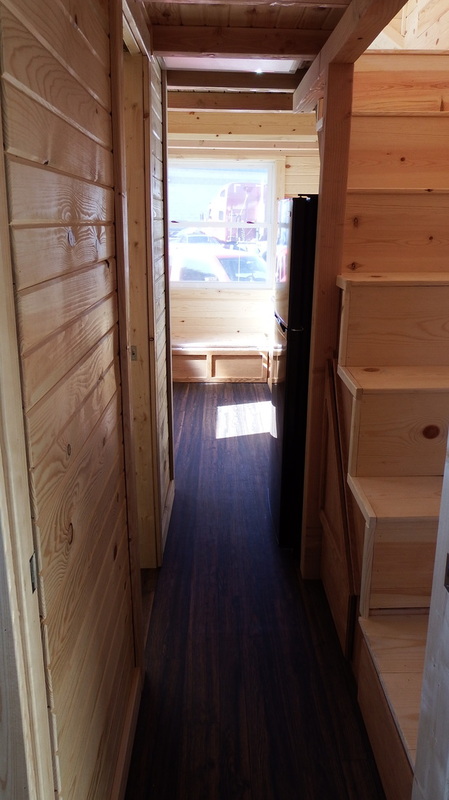 5’ long custom built storage with 12 drawers and 3 upper cubbies in the bathroom and big spacious utility closet under the stairs. 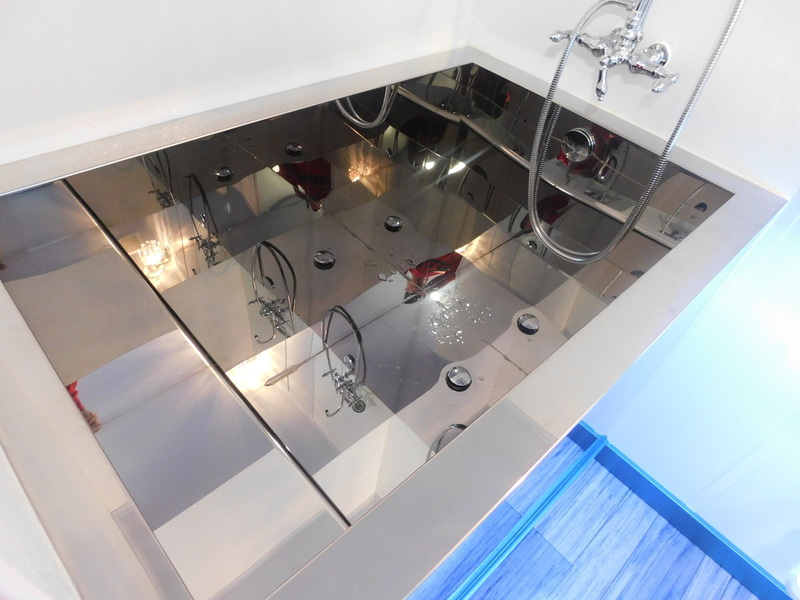 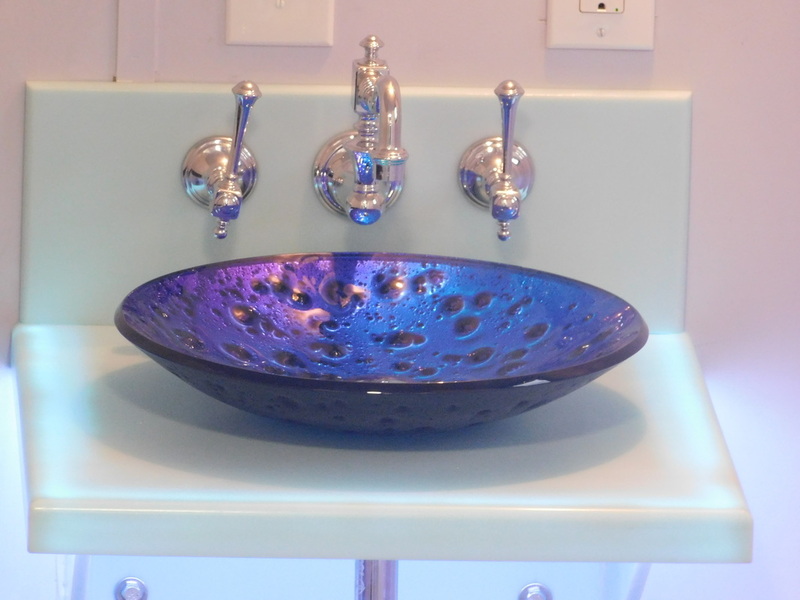 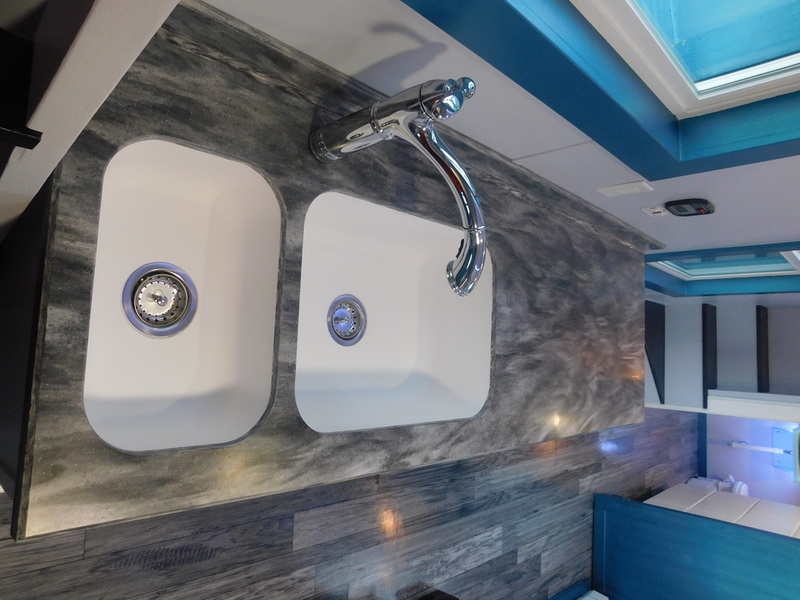 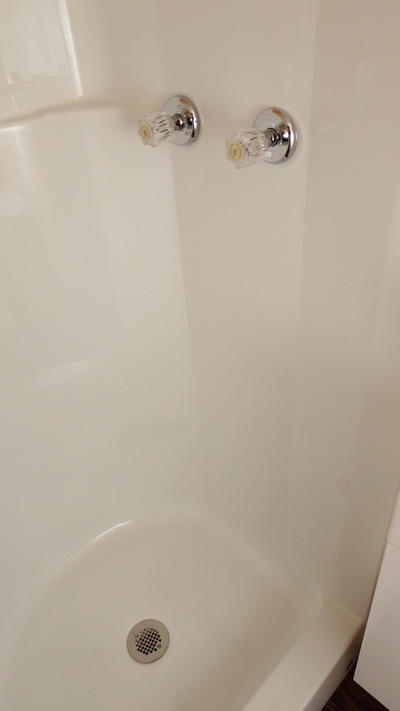 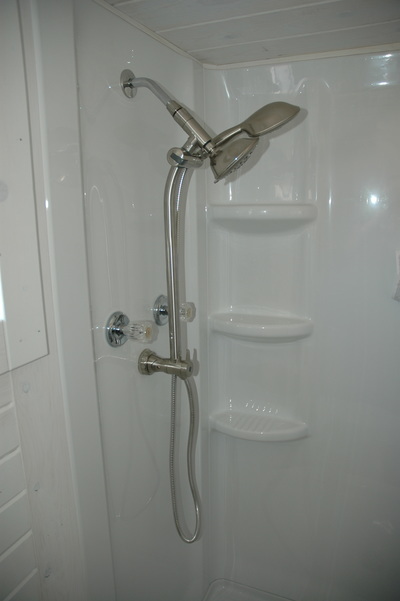 Bath tub is Ofuro soaking tub, a 48” Amery polished chrome bathtub with chrome finish signature hardware pasaia tub faucet and fiberglass surround for the tub shower. 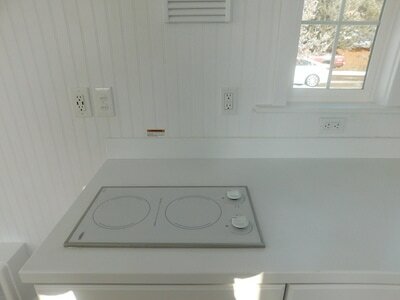 Corian designer white countertop on one side of the cabinets and Corian Bedford Marble on the other side of the cabinets. 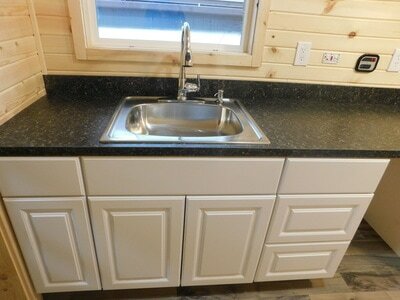 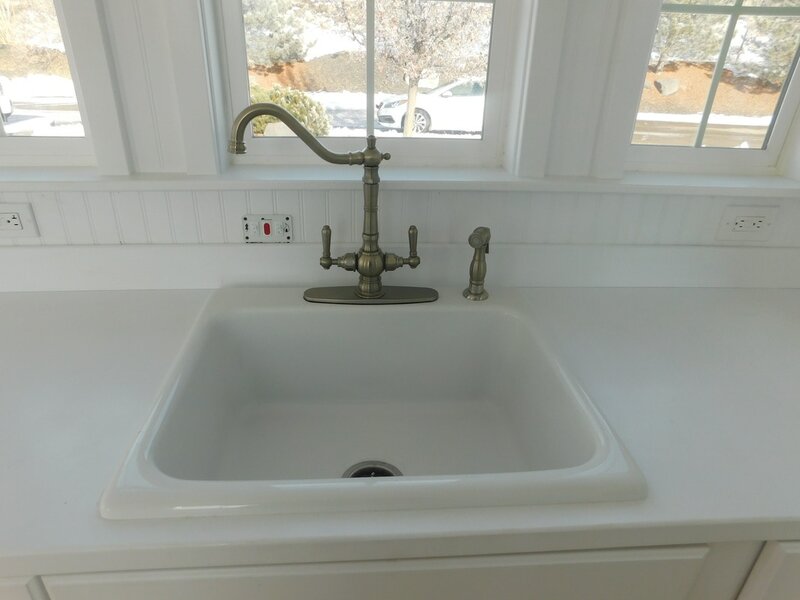 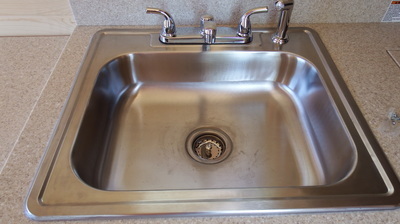 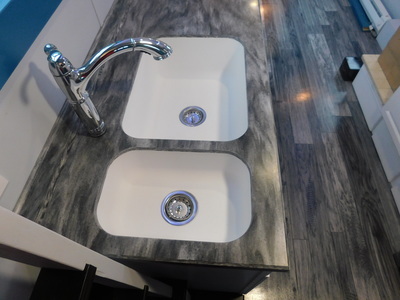 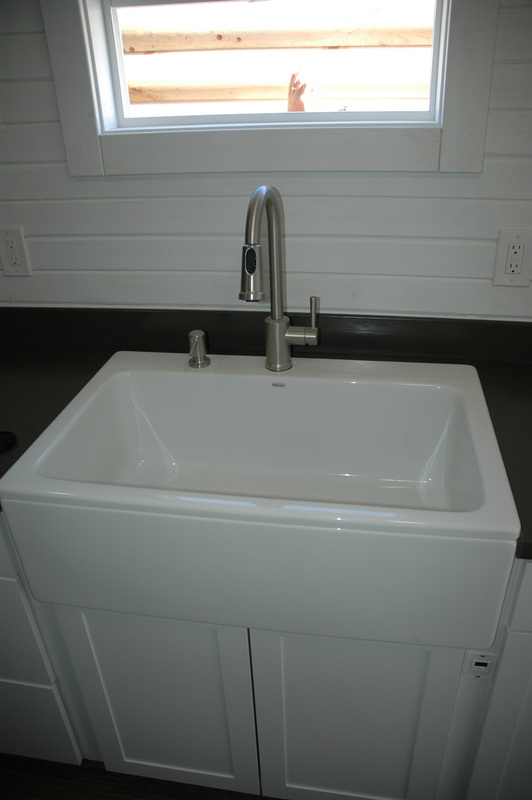 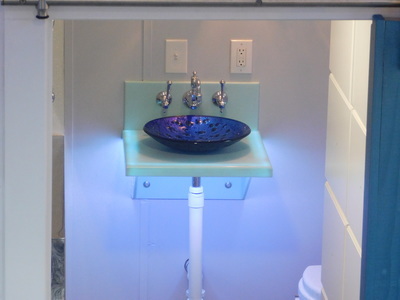 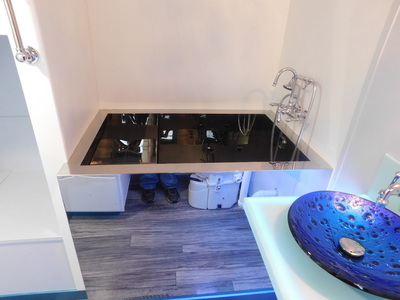 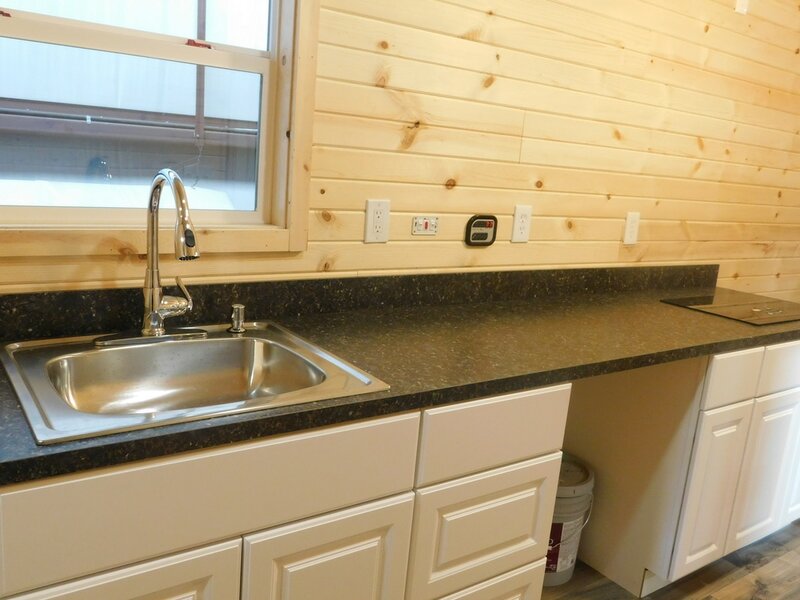 Kitchen sink is und-mount designer white Corian sink with chrome finish Brantford one handle high arc pullout kitchen faucet. 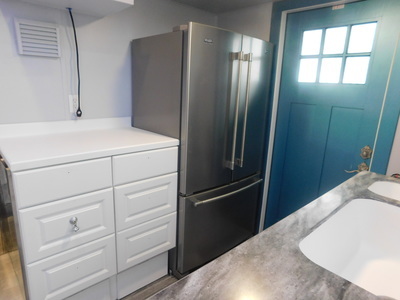 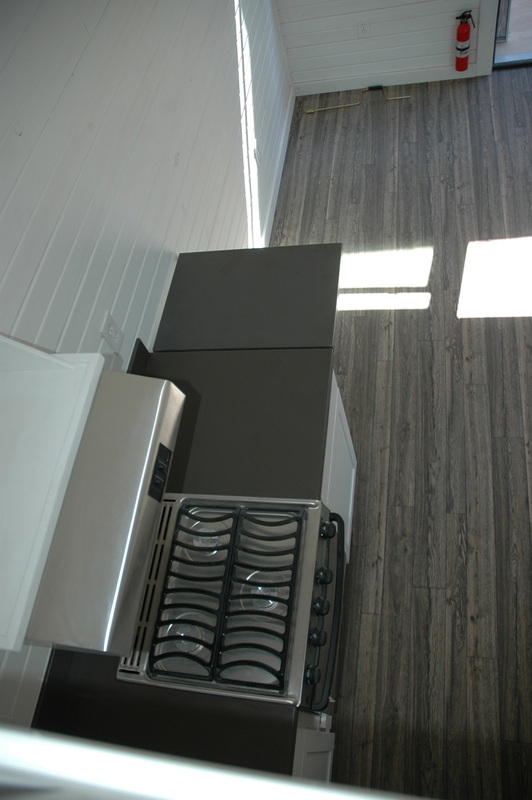 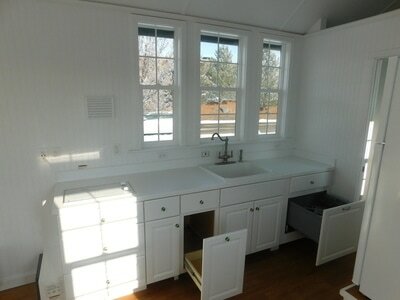 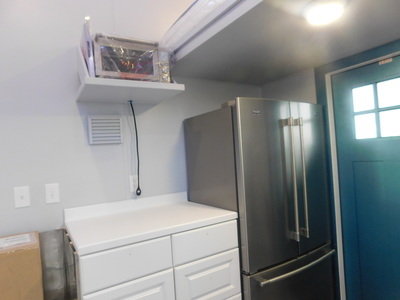 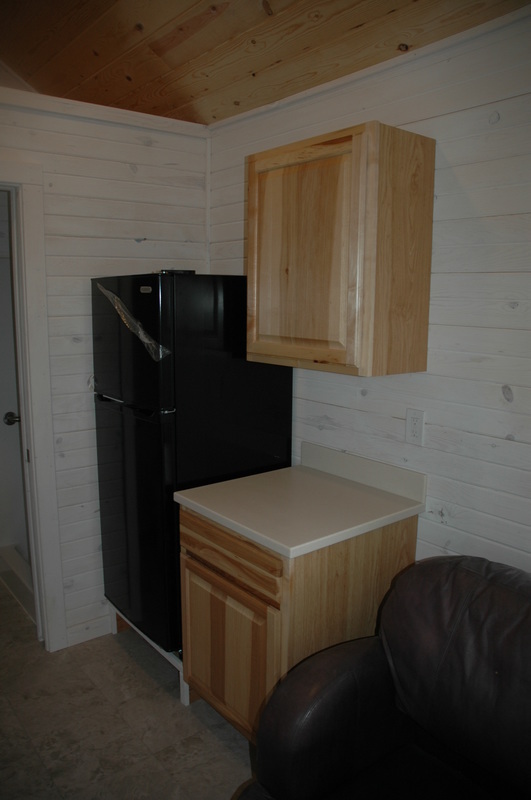 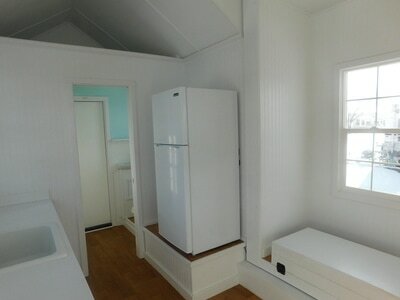 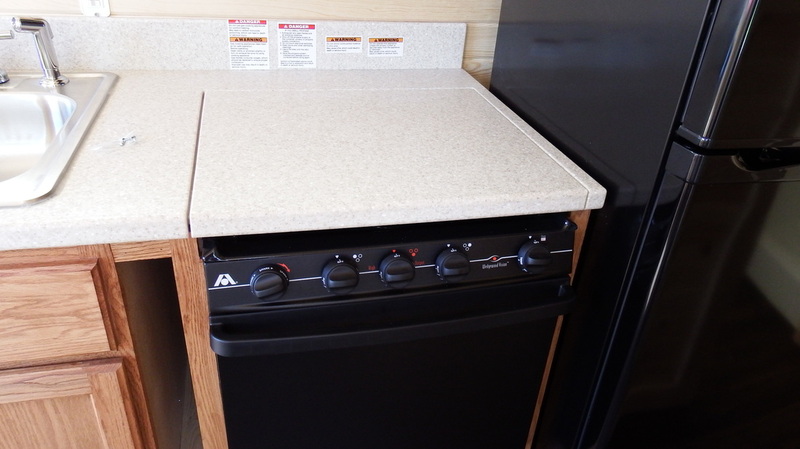 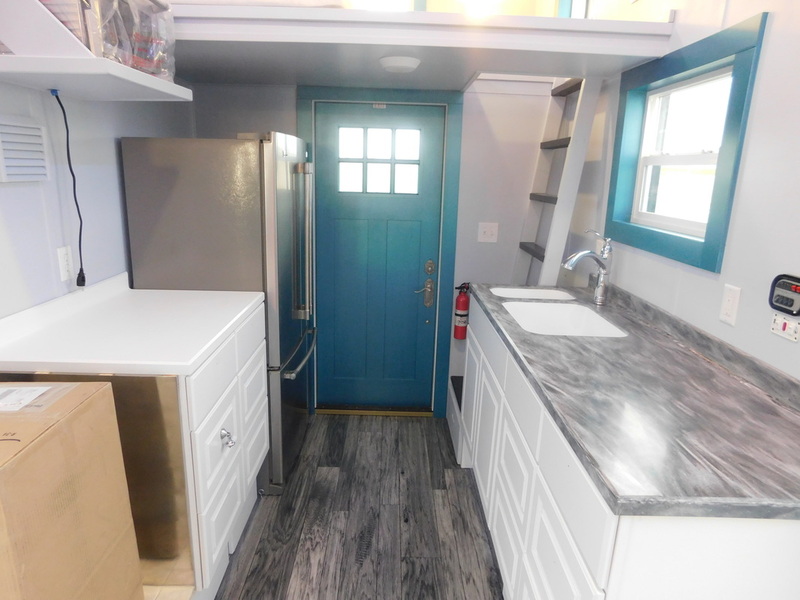 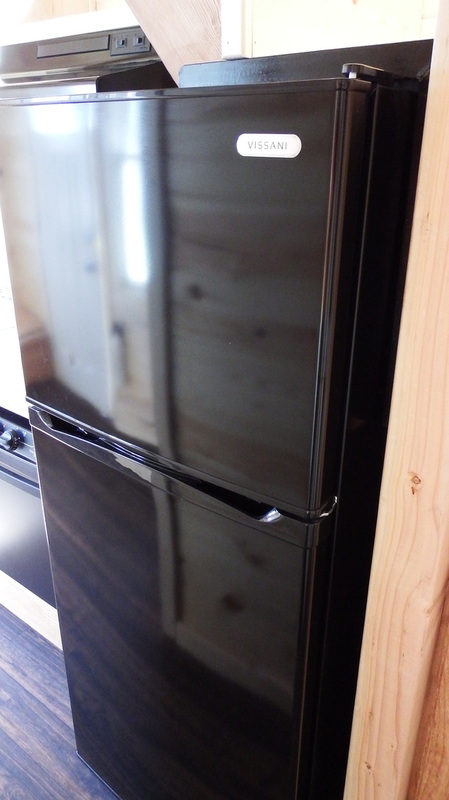 Kitchen has a Maytag side by side refrigerator and freezer. 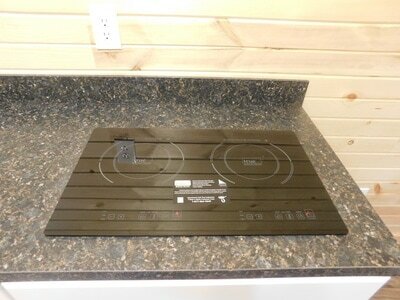 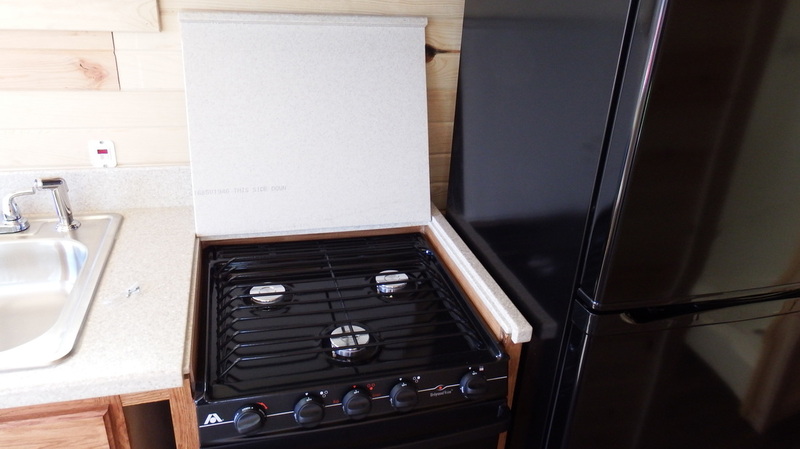 Breville smart oven convection toaster oven. Atwood 10 gallon dual electric/propane water heater.